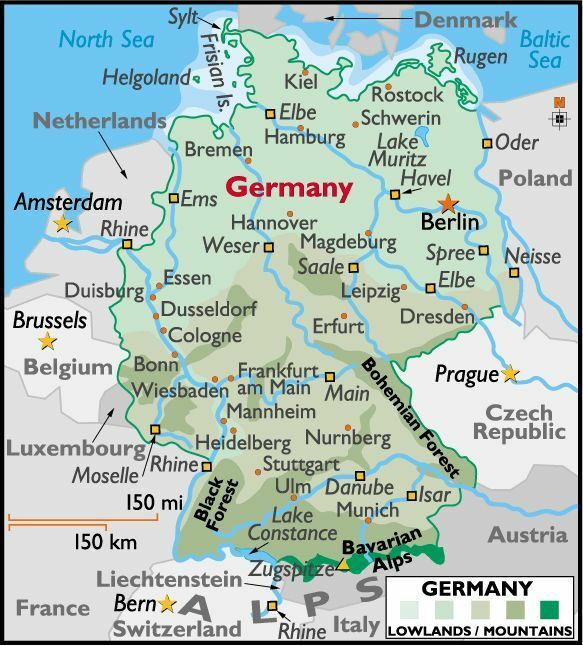 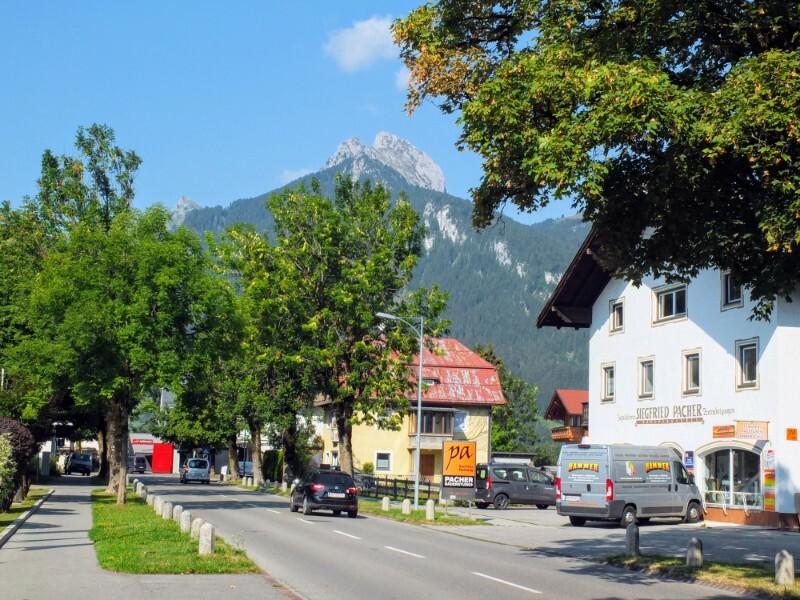 There are many route variations crossing the Bavarian Alps which straddle most of Germany’s southern border with Austria. 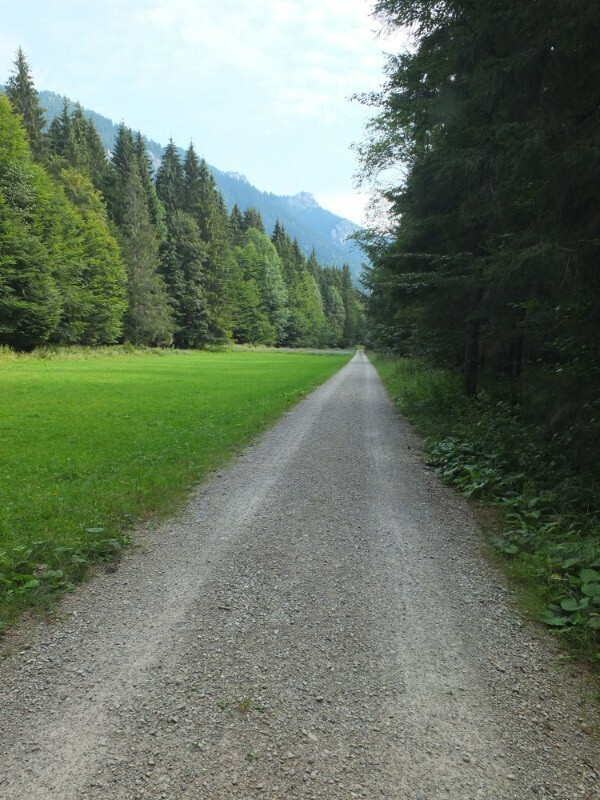 As I sorted my way through the possibilities, several things were important to me. 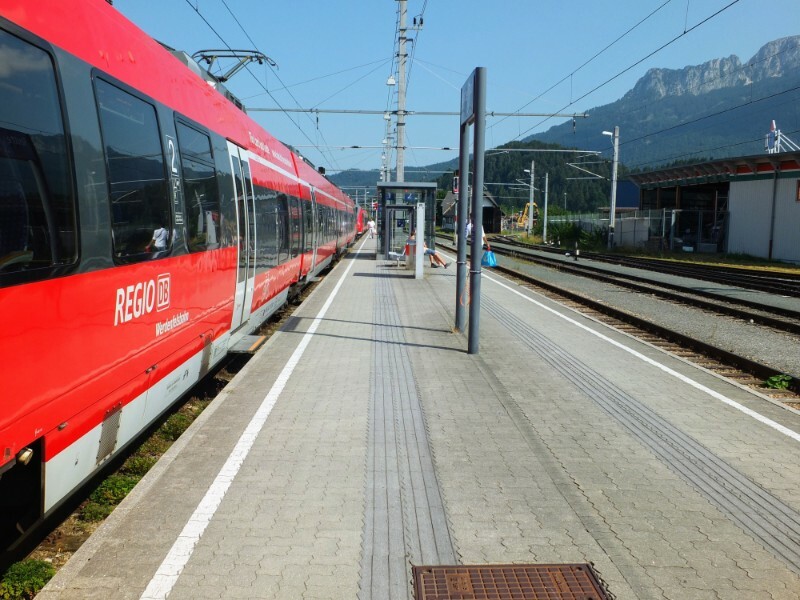 Both ends of my hike needed to be served by good public transportation. 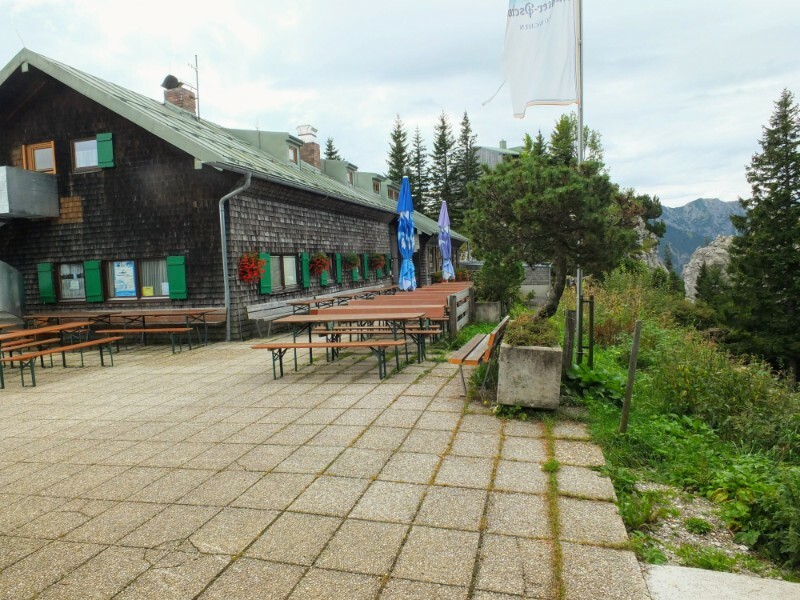 I was also looking to see some of the area’s prime sights, stop by some breweries along the way, and use mountain huts as my nightly stops. 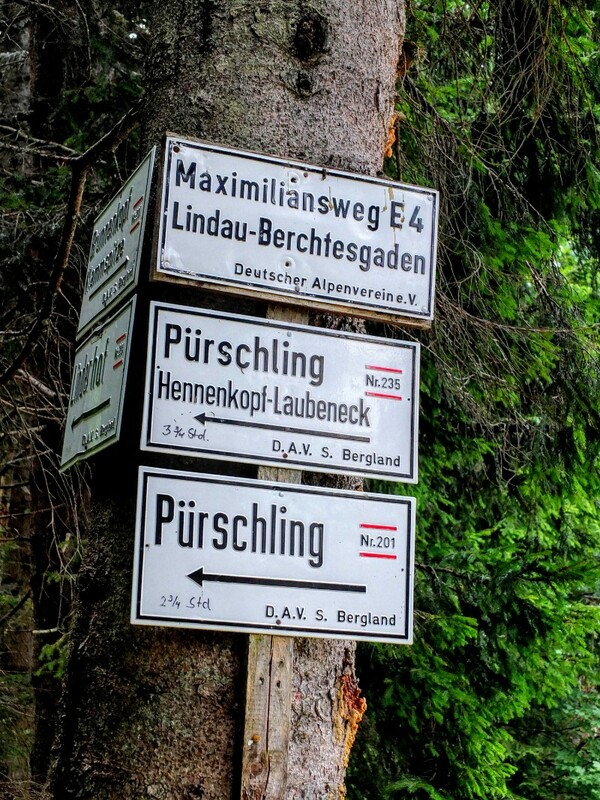 So began my mapping exercise to find the intersections between these pursuits. 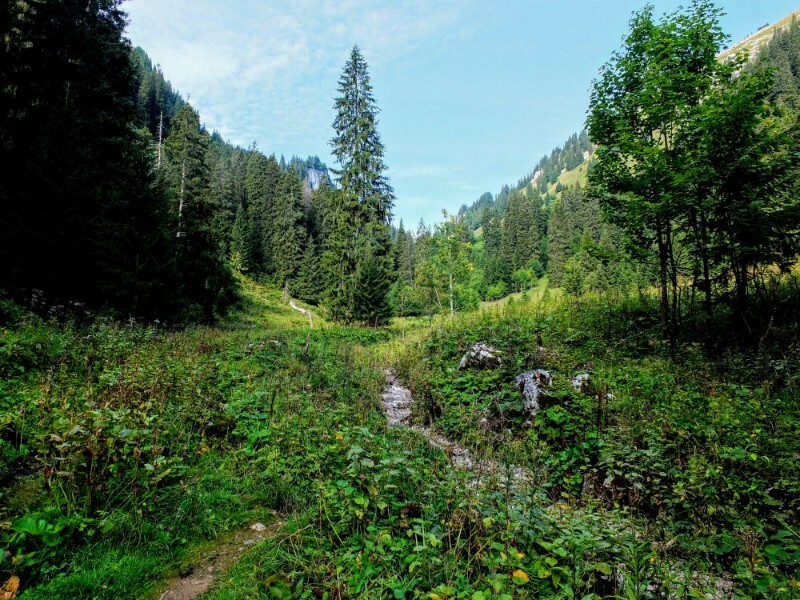 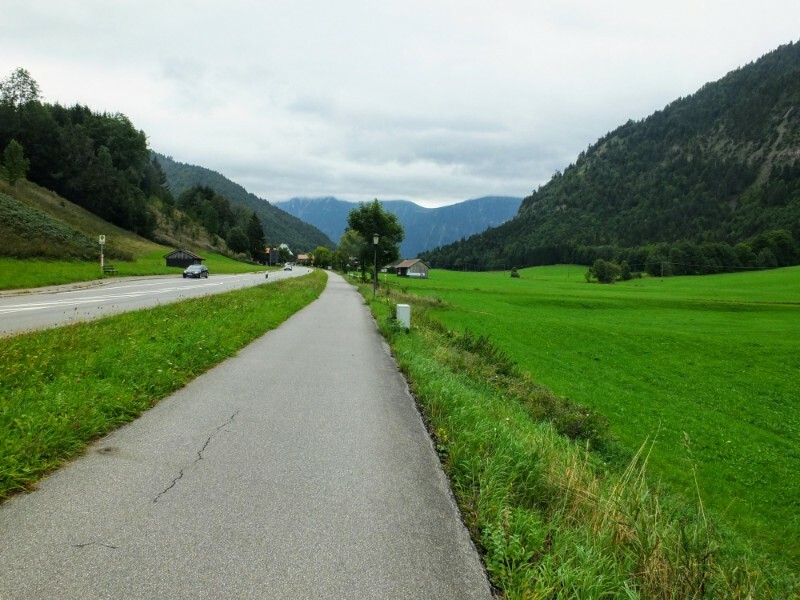 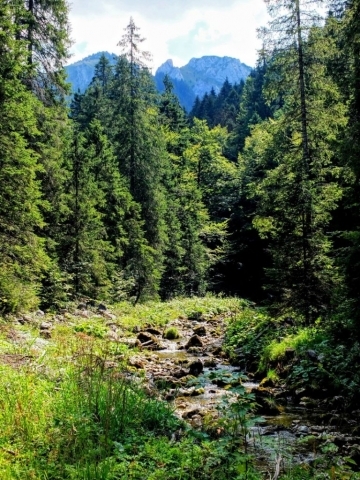 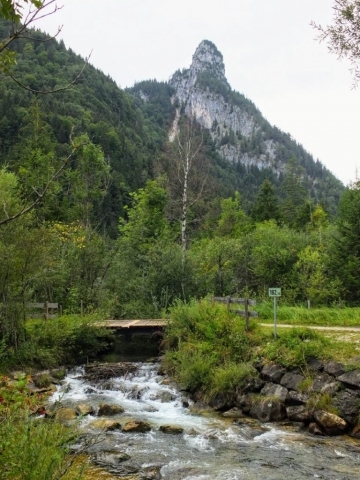 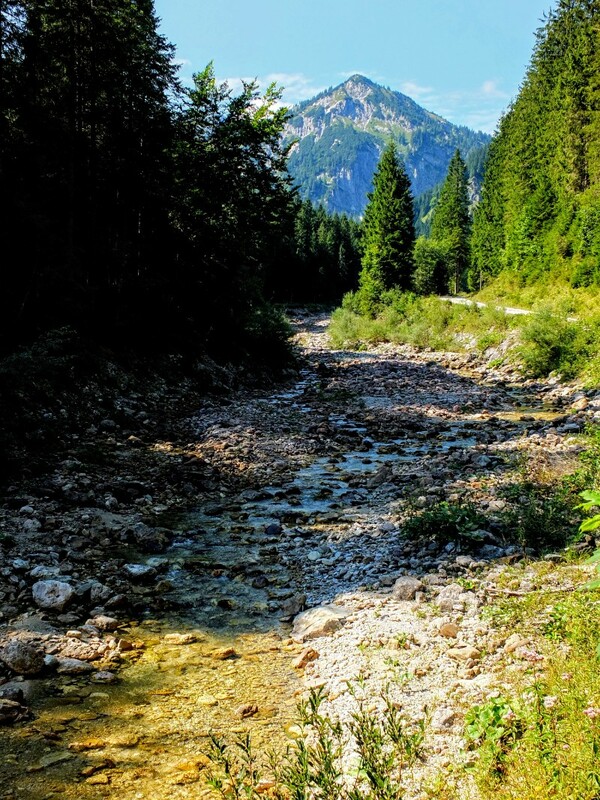 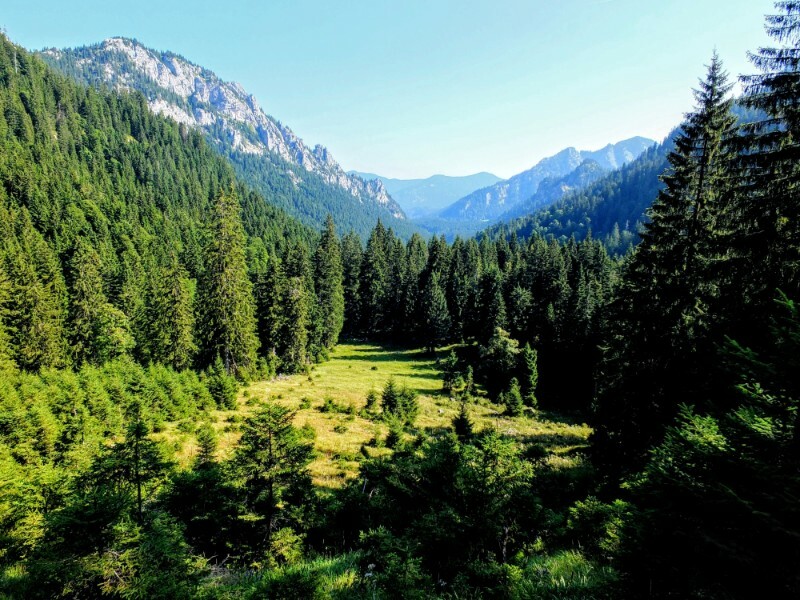 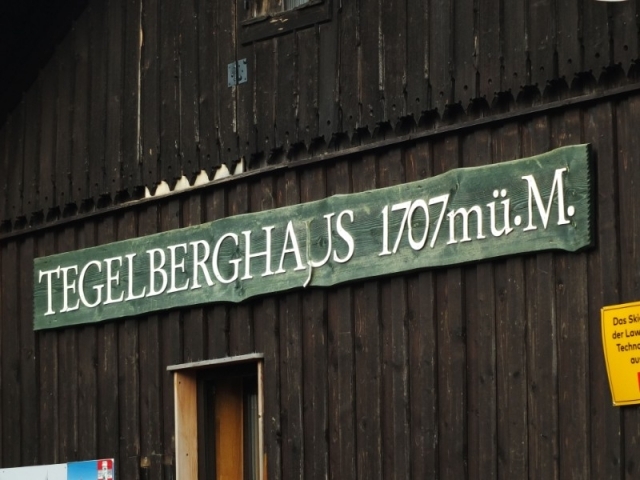 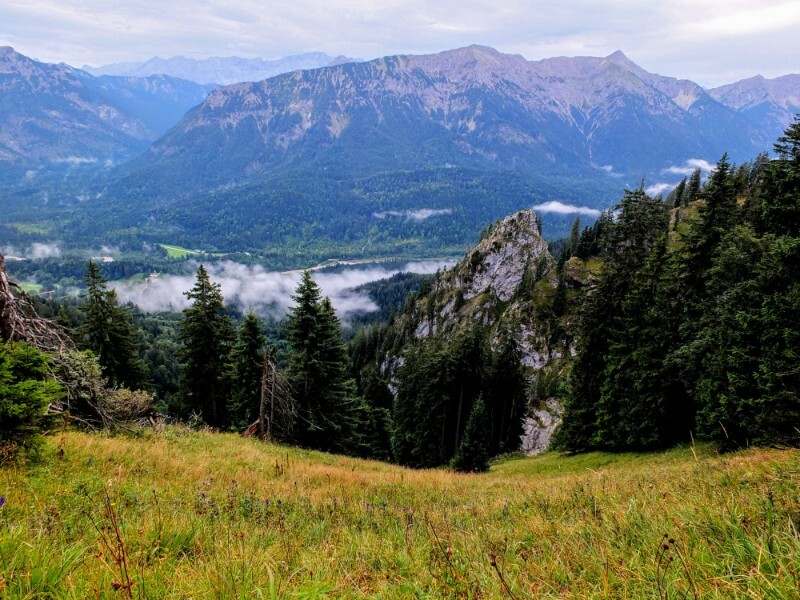 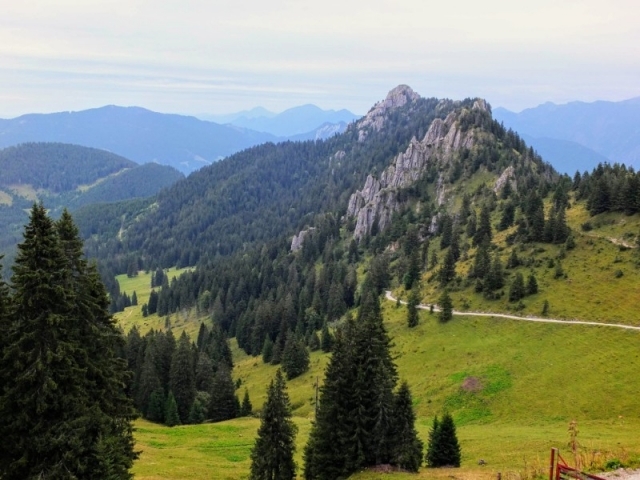 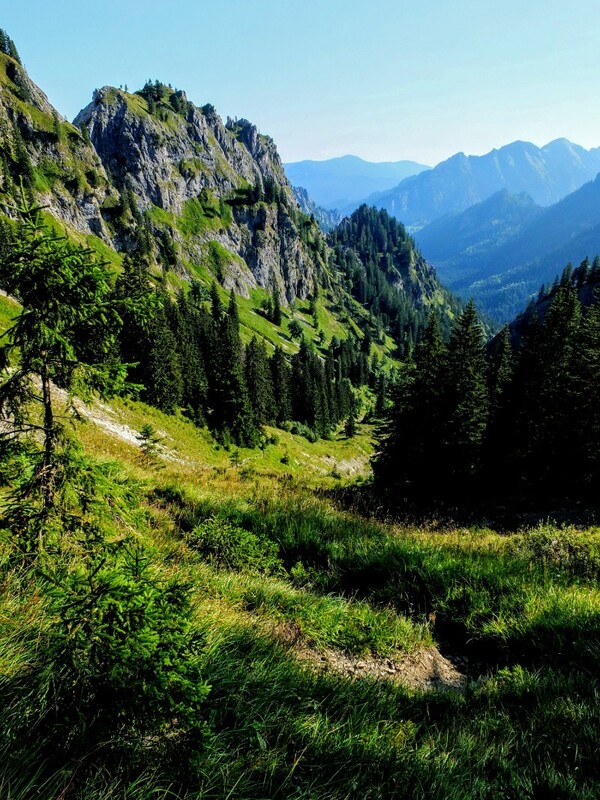 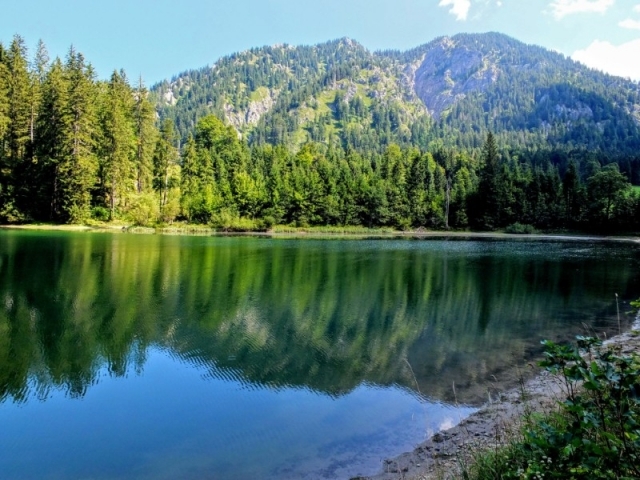 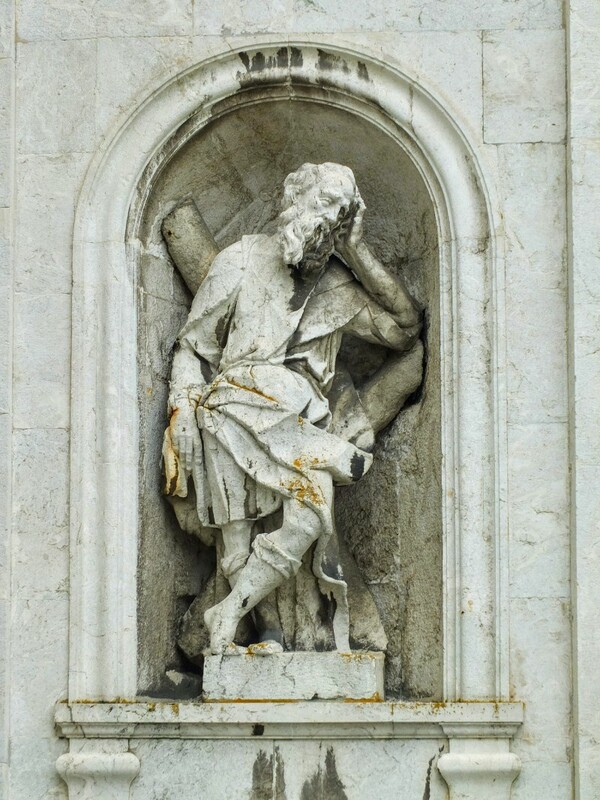 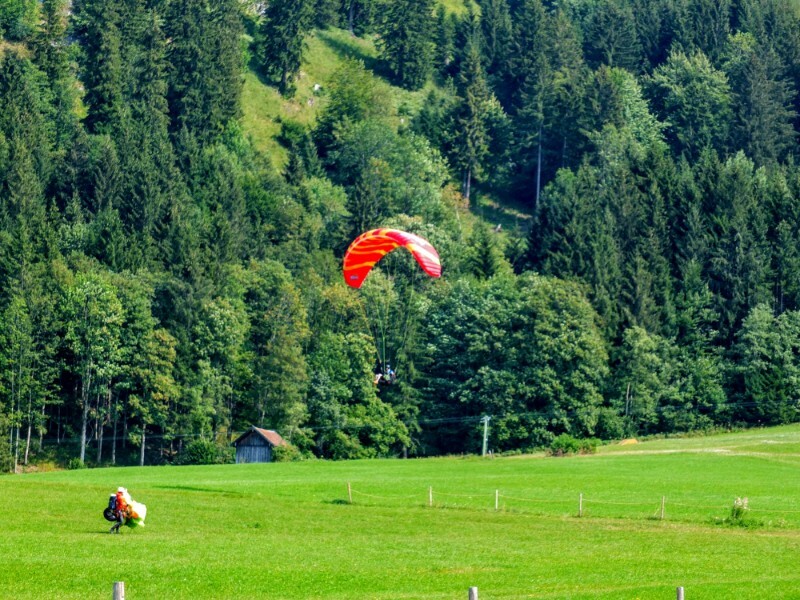 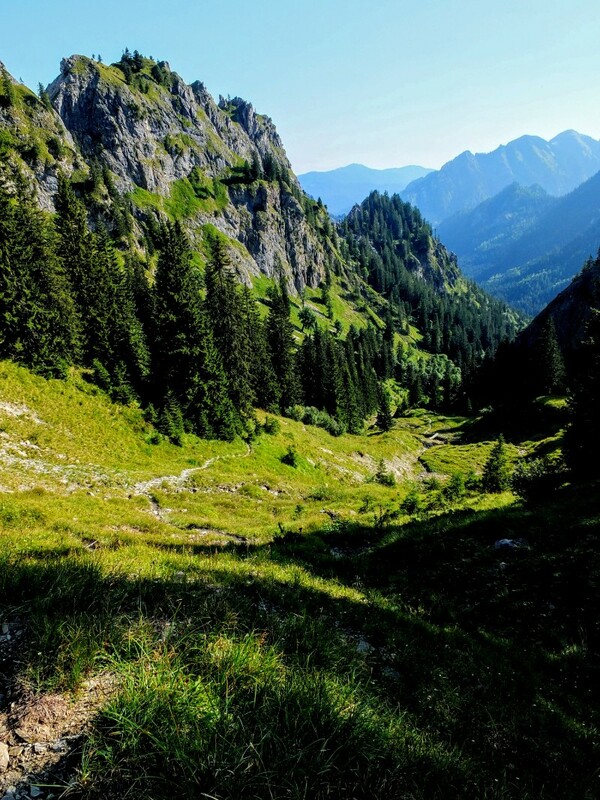 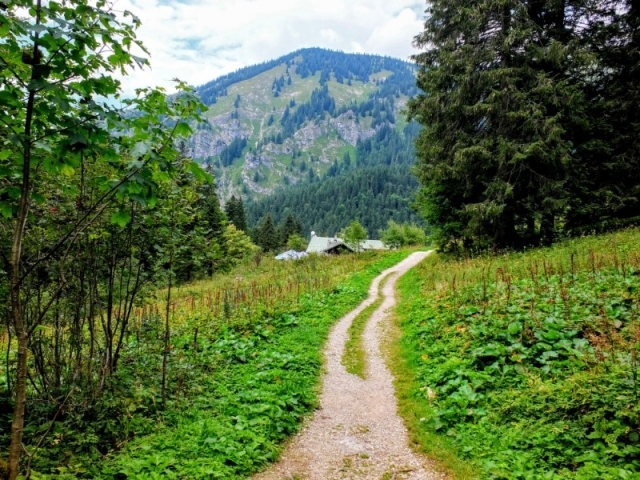 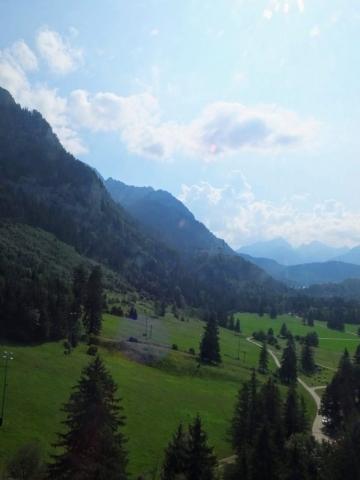 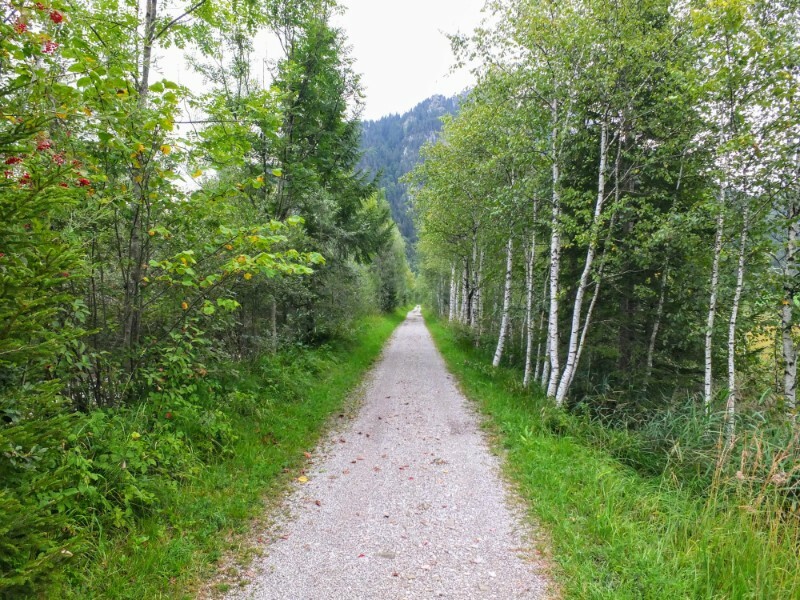 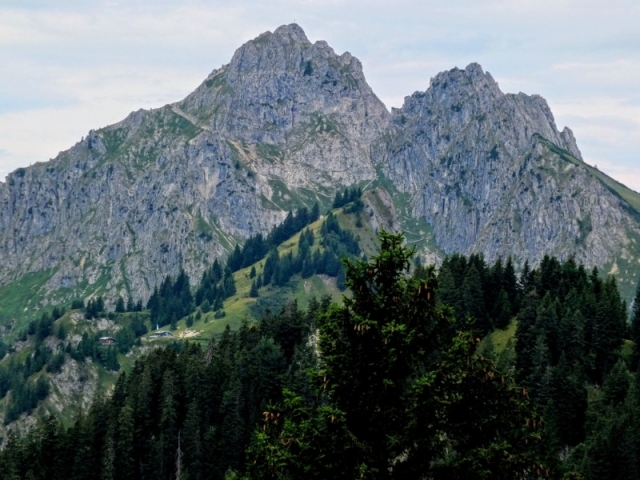 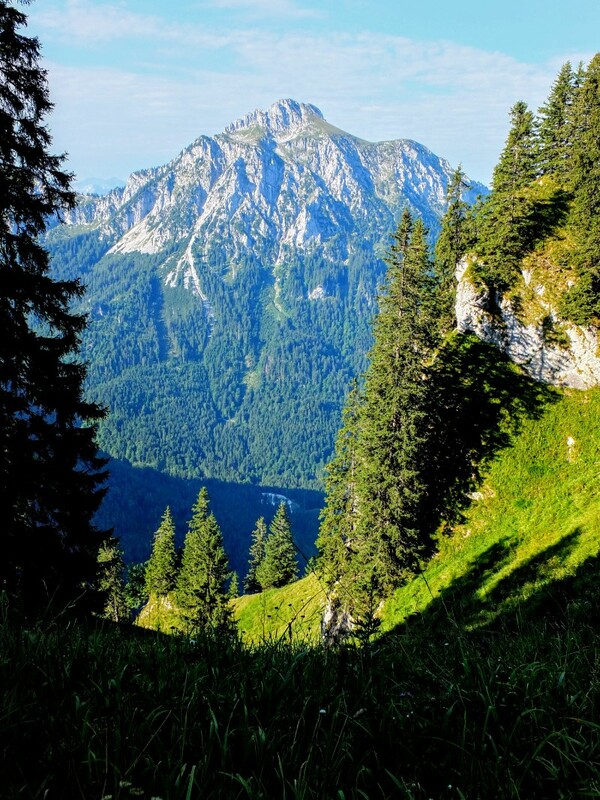 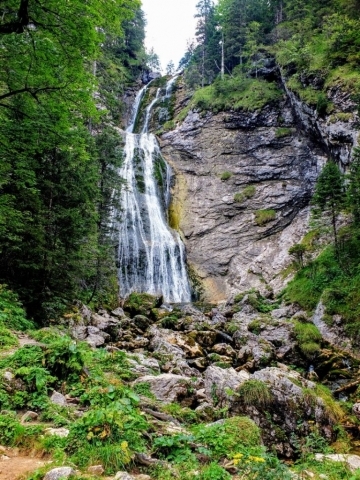 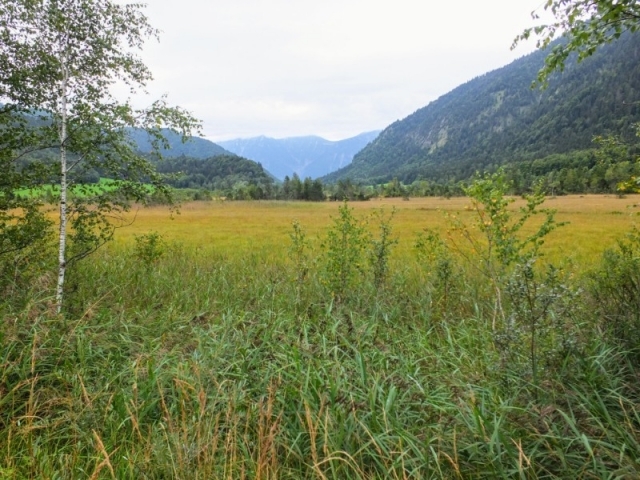 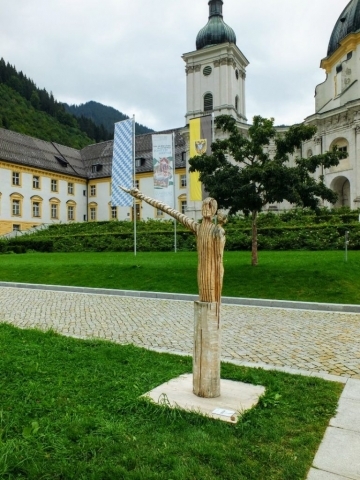 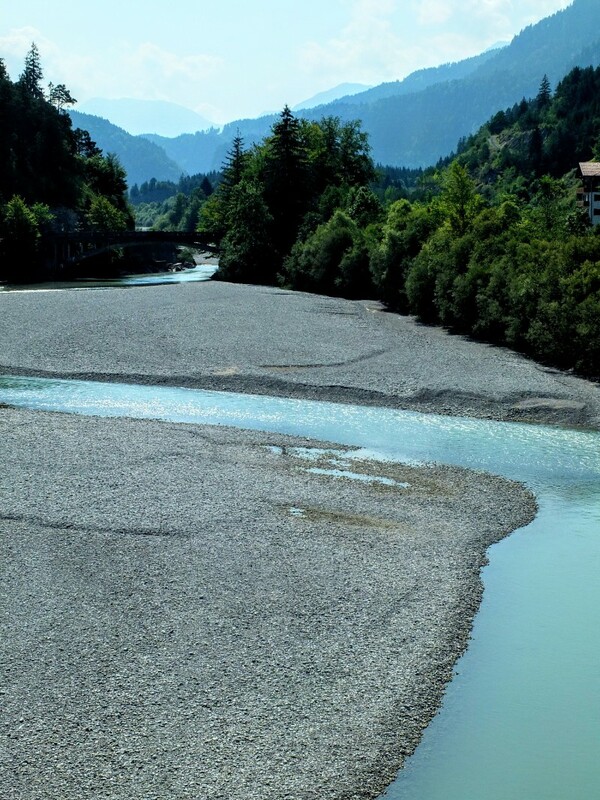 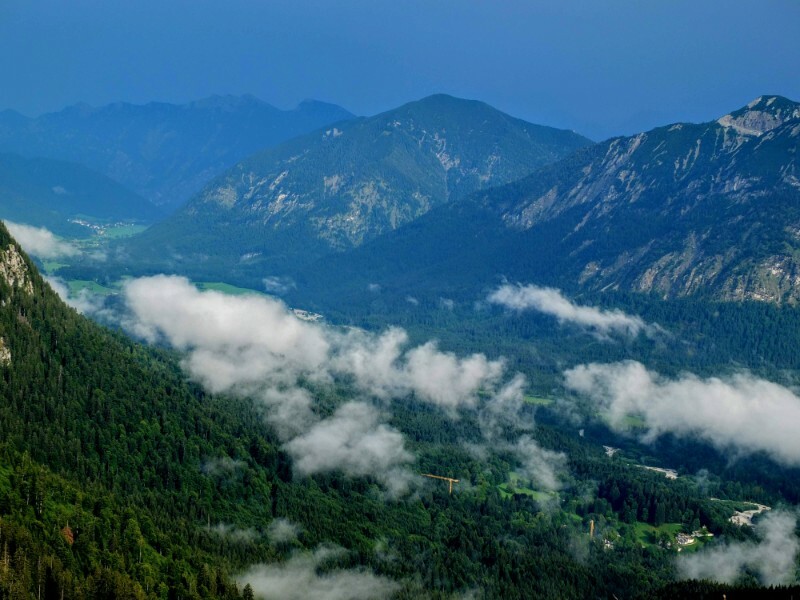 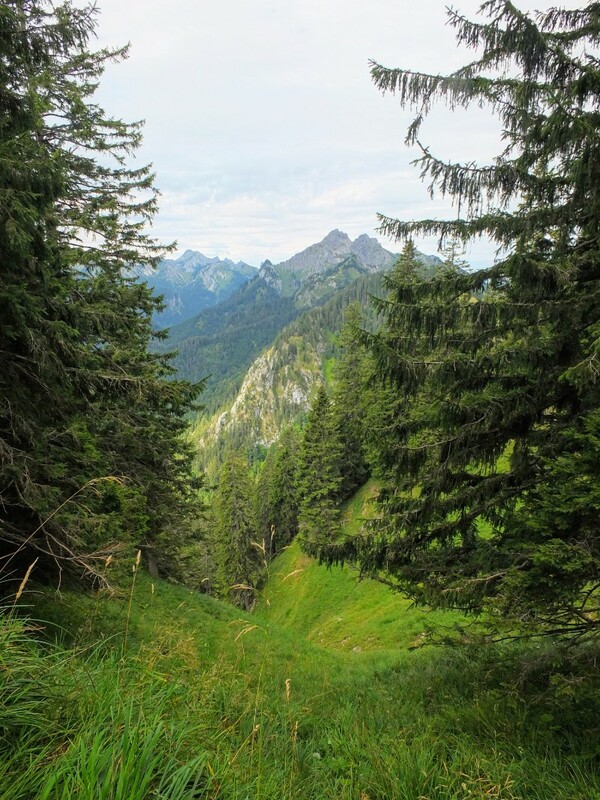 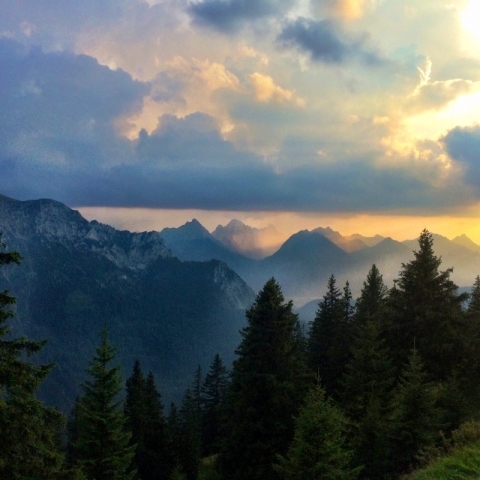 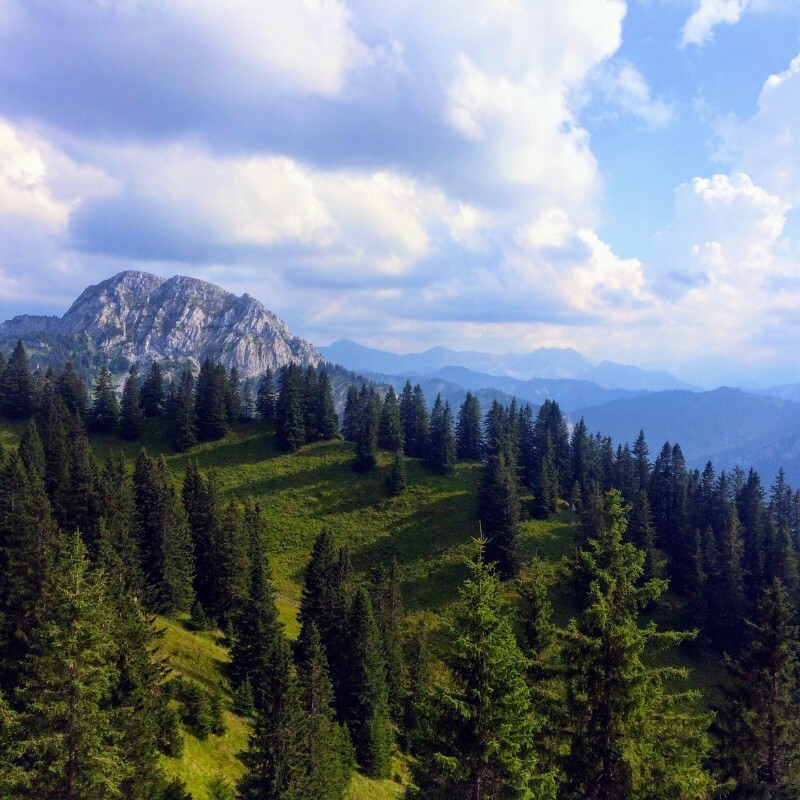 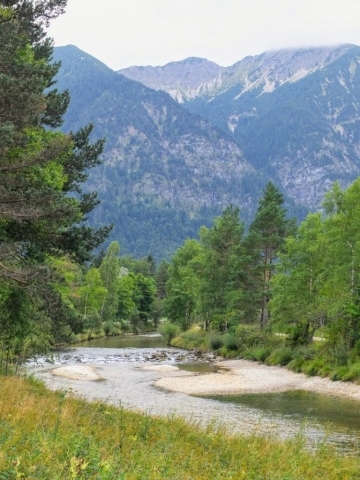 The result was a multi-day trek from a train stop near Reutte in the Austrian Tirol through the Ammergäu Alps ending at the train station at Oberau. 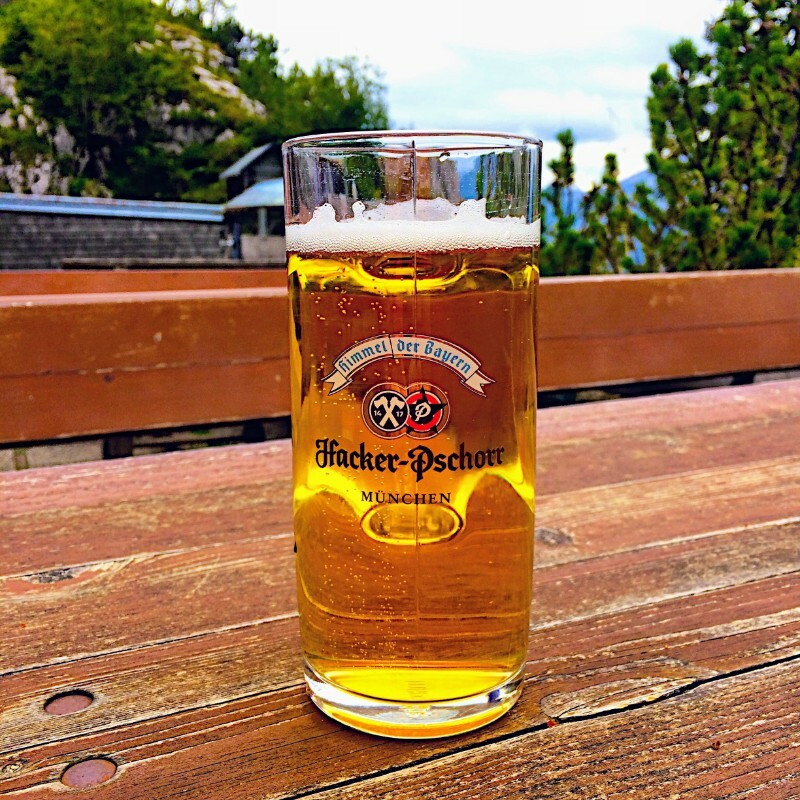 I’ve broken my story of the trek into four pieces: On the Path describes the route taken; Hut Life is about what staying in four mountain huts along the way was like; Beers and Breweries touches on the beer culture along the way; and Seen on the Trail is about the incredible scenery, interesting sights (including Schloss Hohenschwangau, Neuschwanstein & Linderhof palaces, Oberammergau, and the Ettal Monastery) that are experienced along the route. 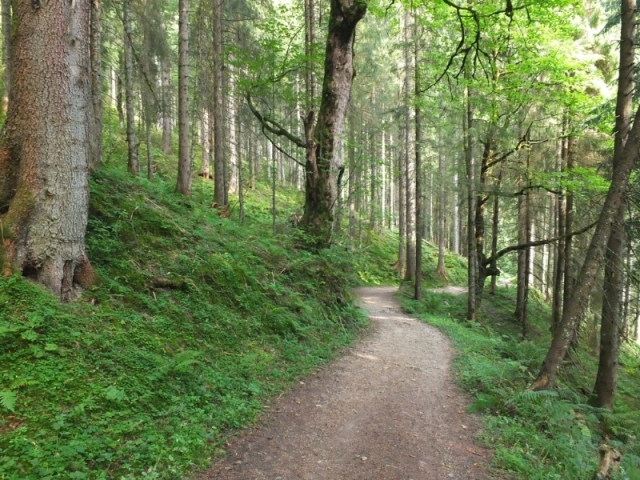 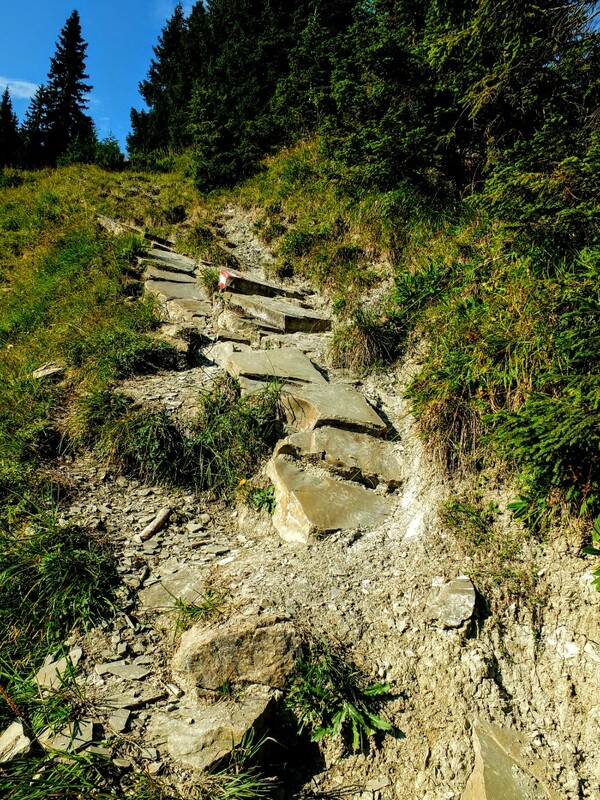 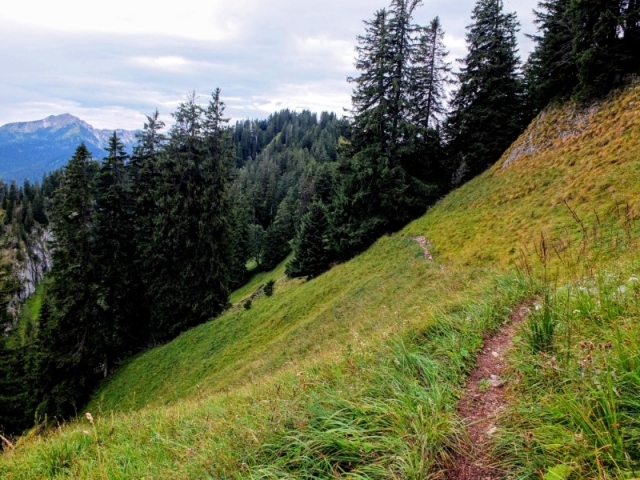 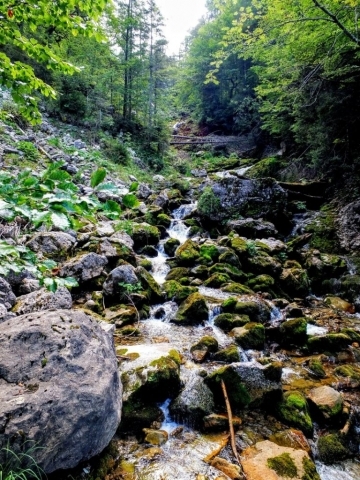 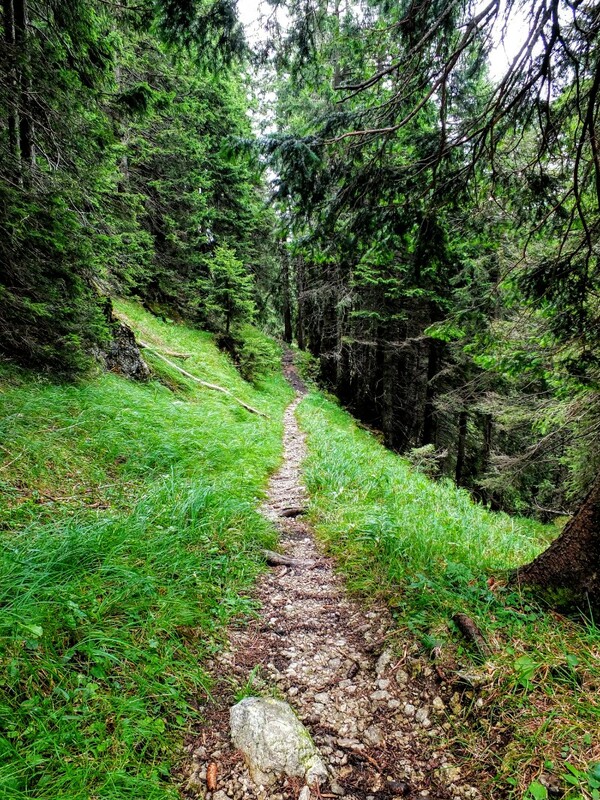 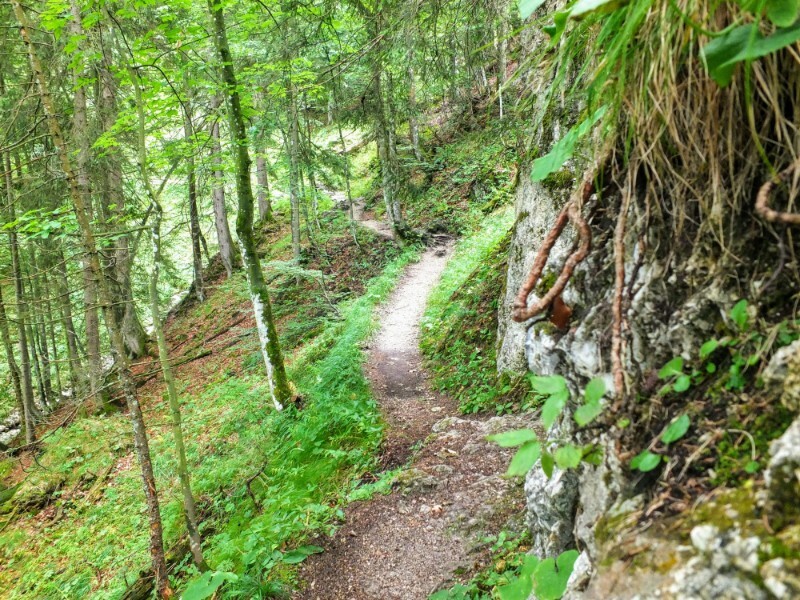 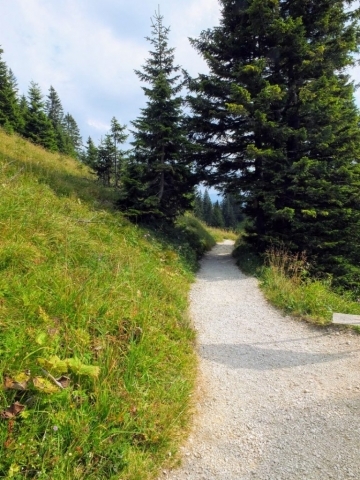 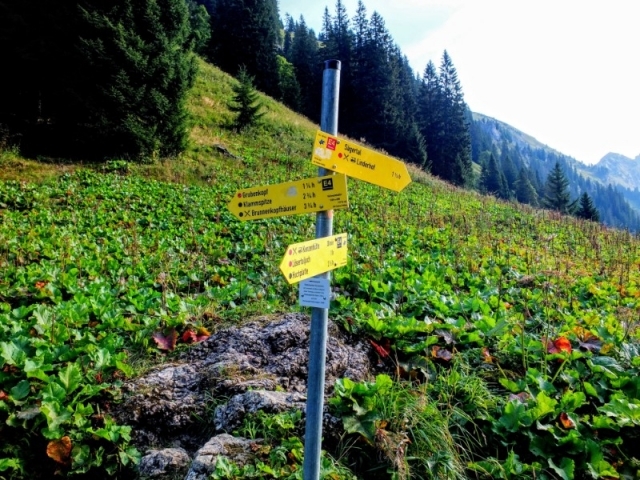 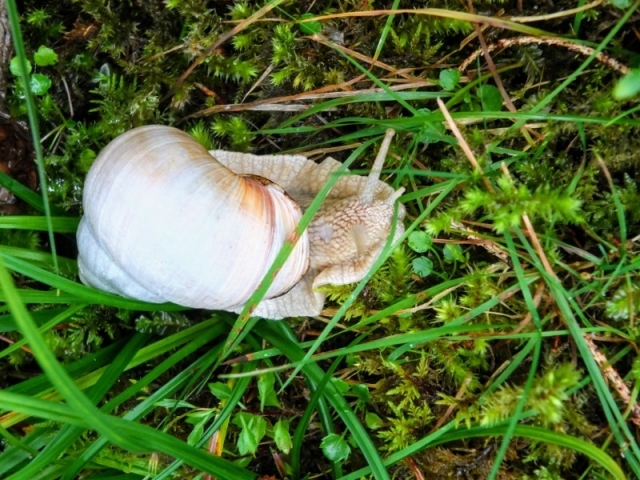 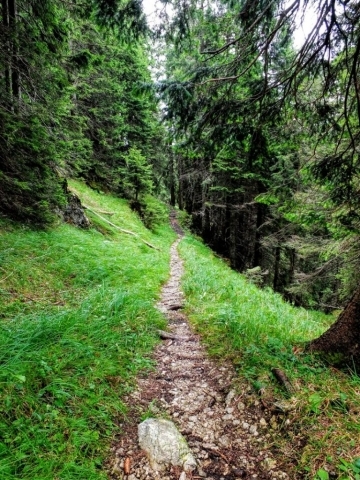 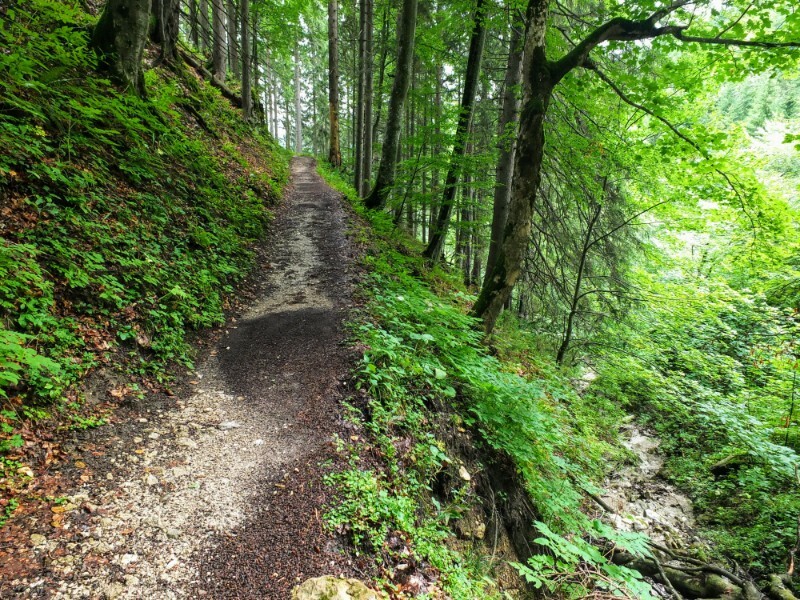 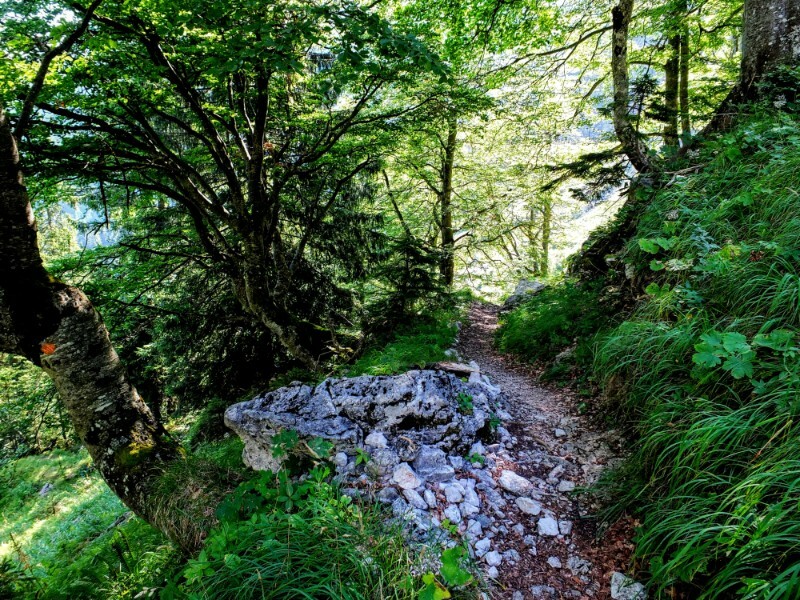 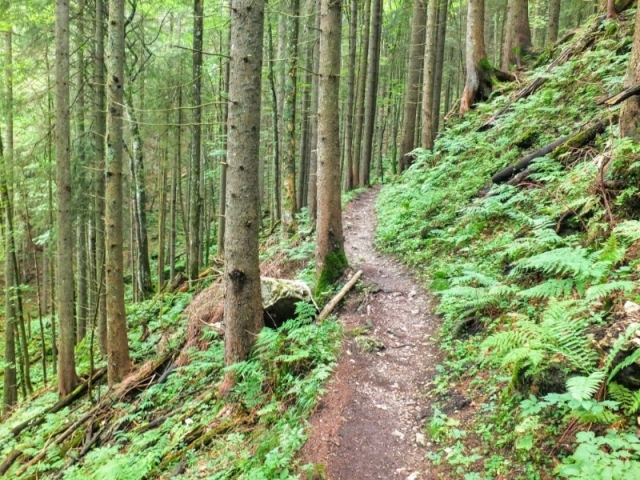 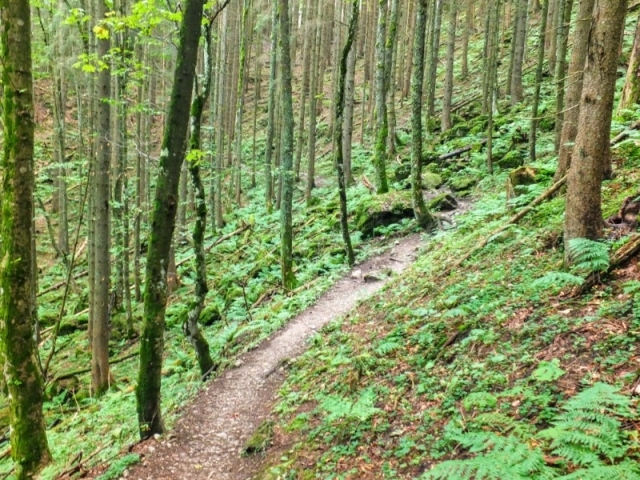 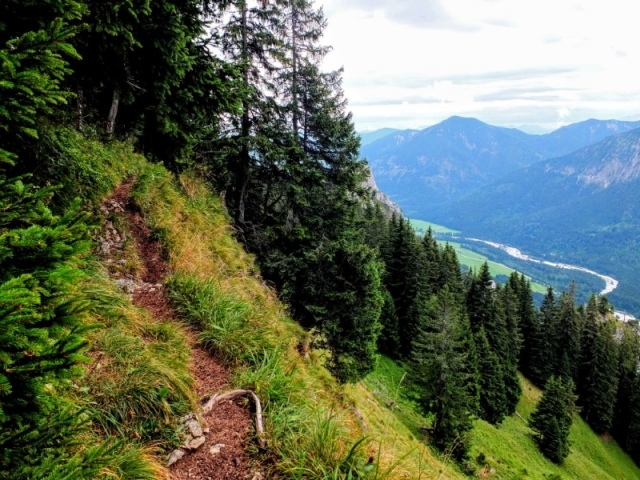 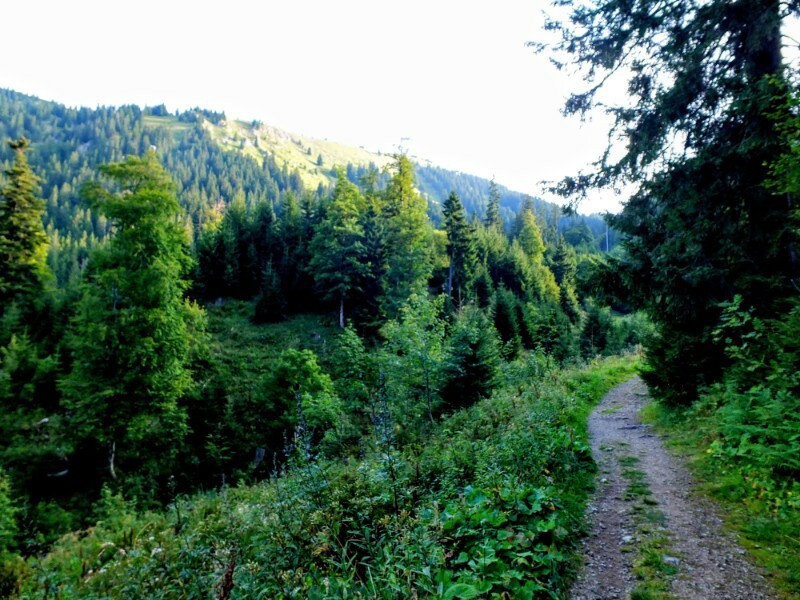 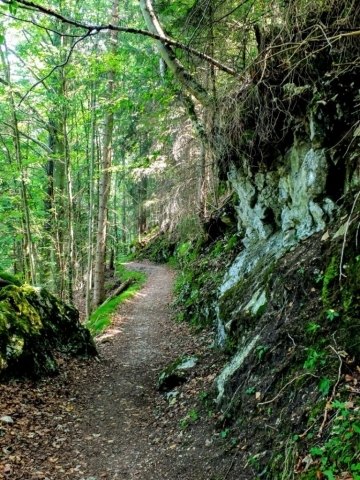 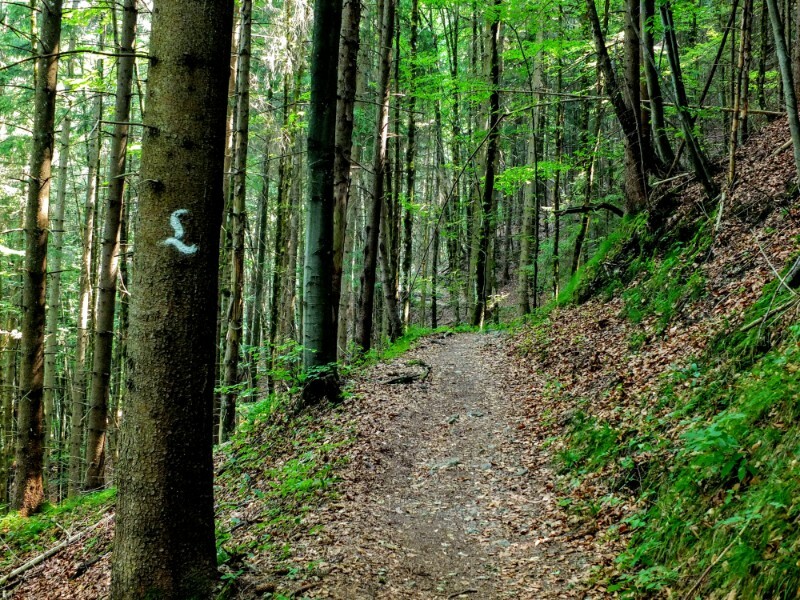 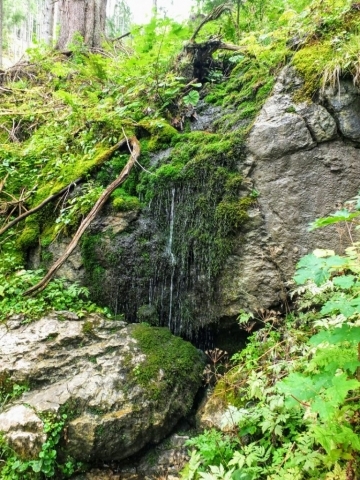 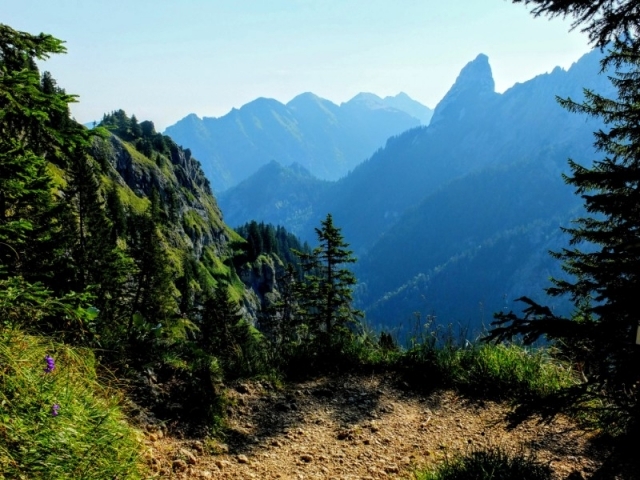 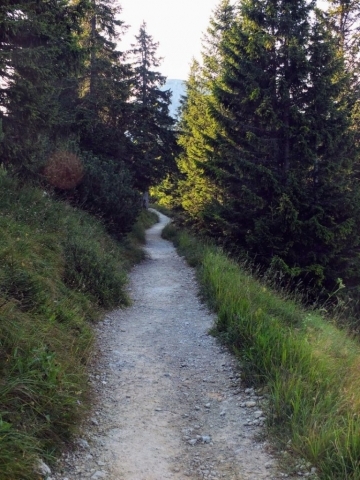 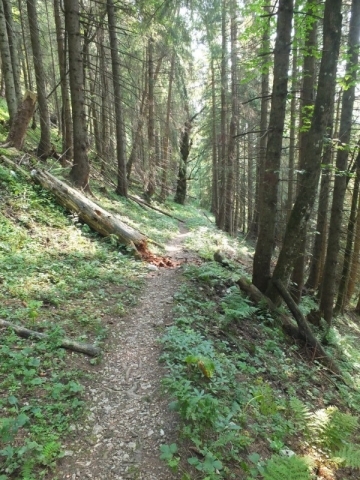 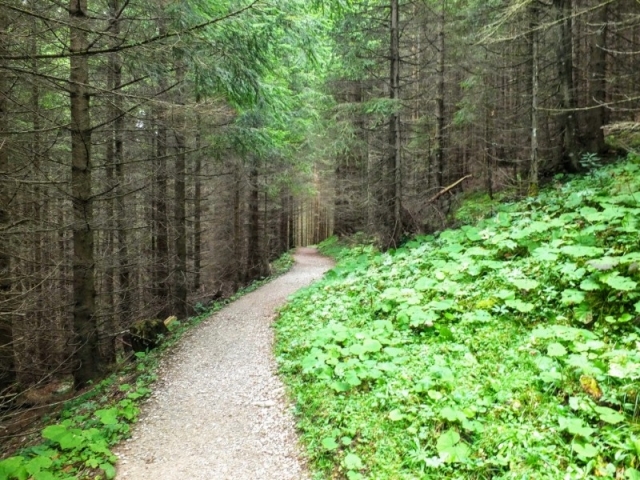 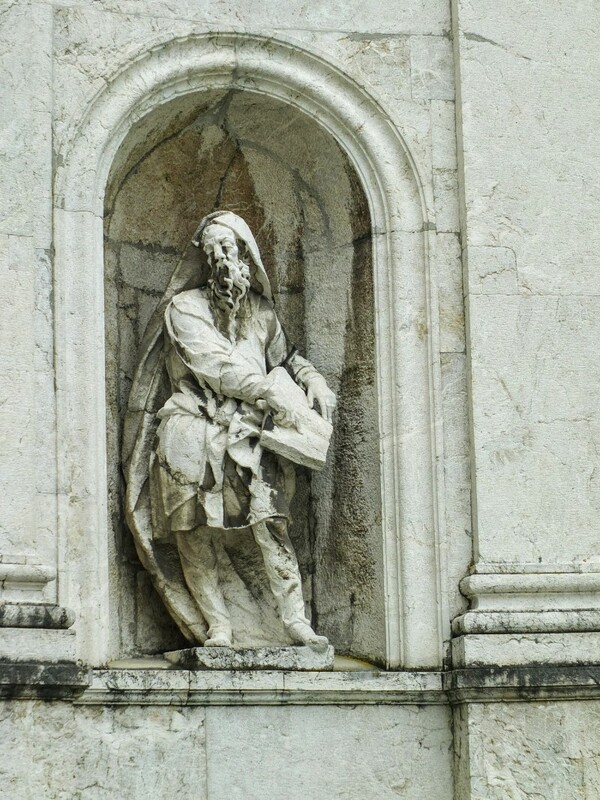 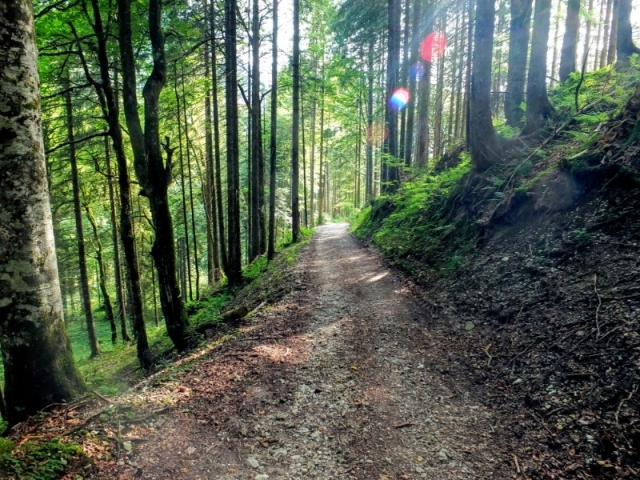 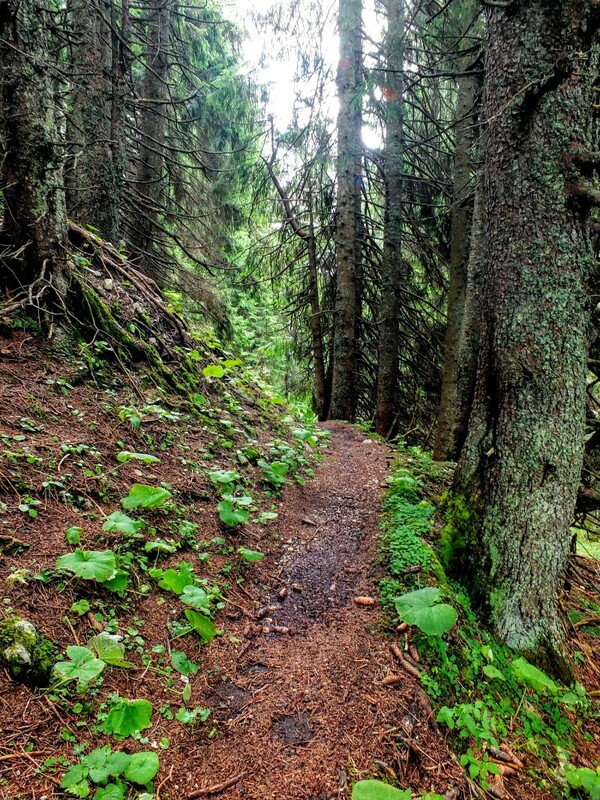 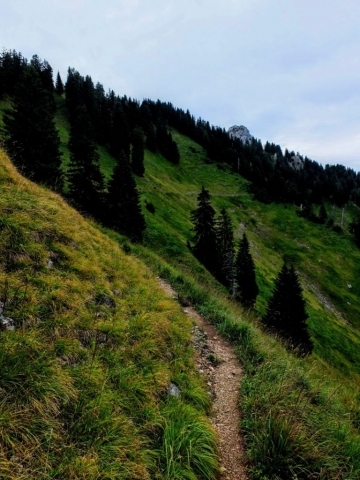 Europe is blessed with many long distance hiking routes. 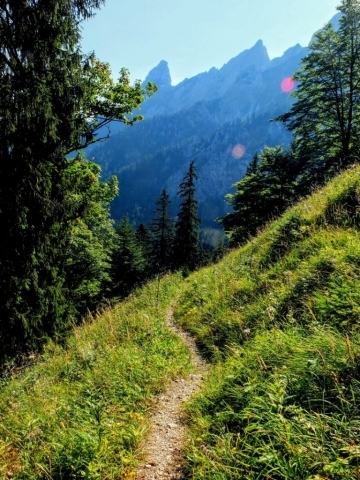 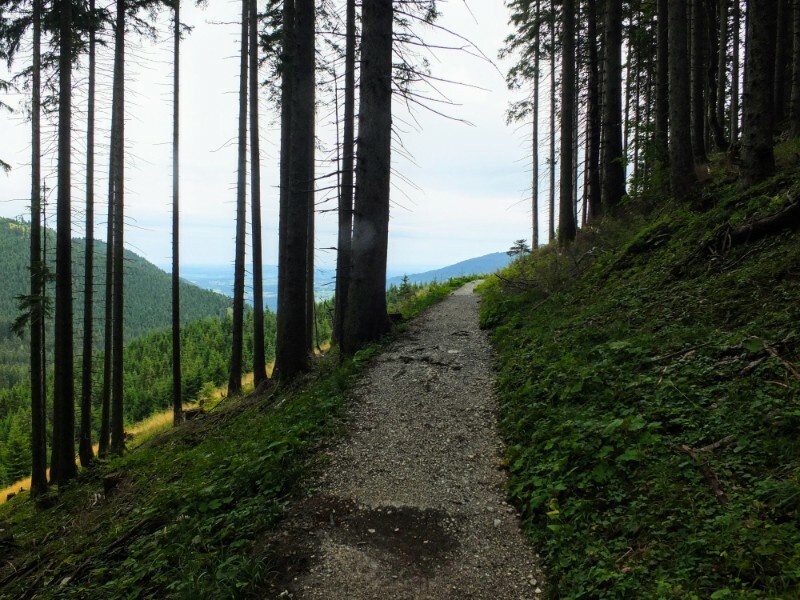 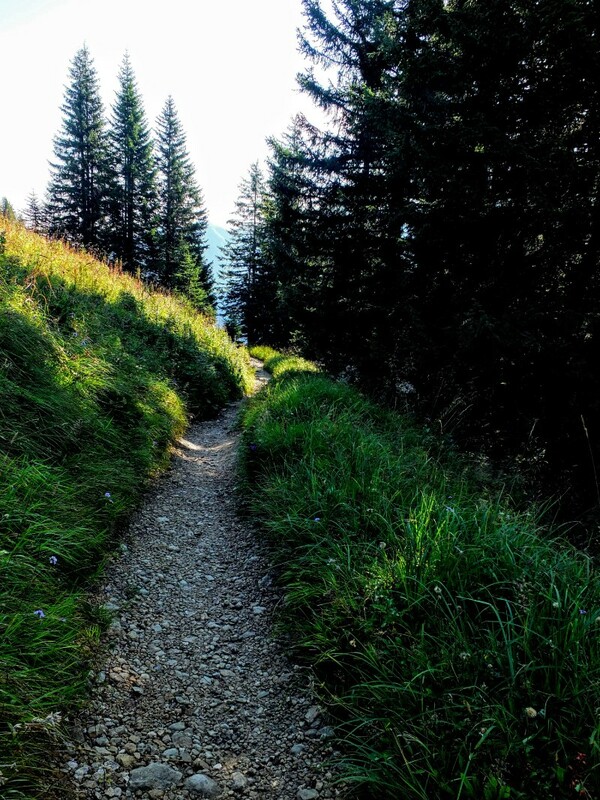 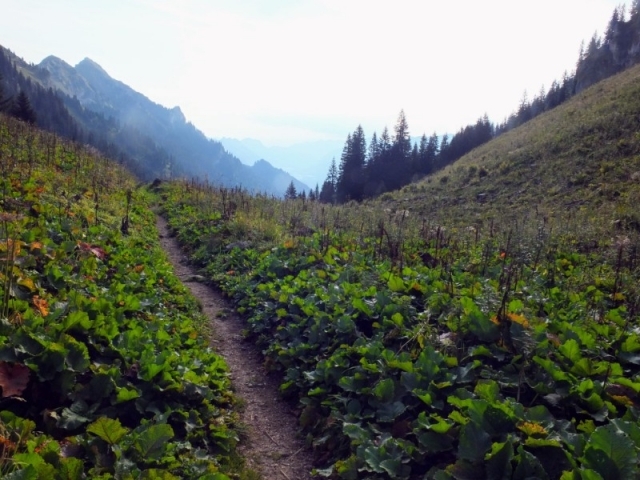 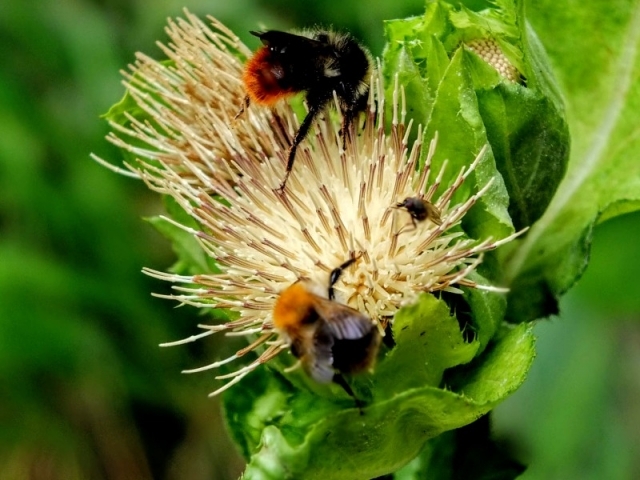 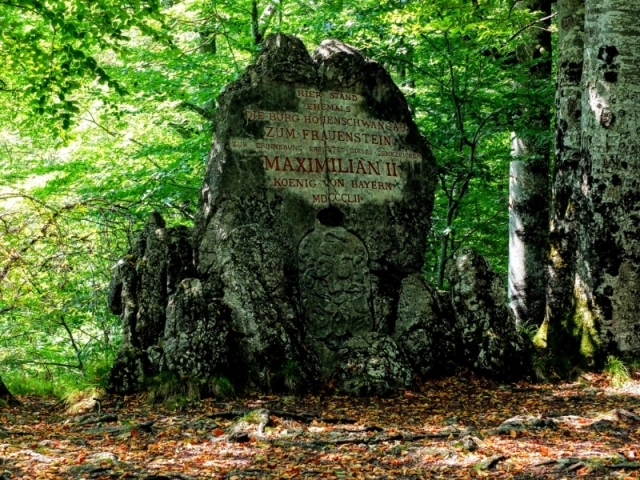 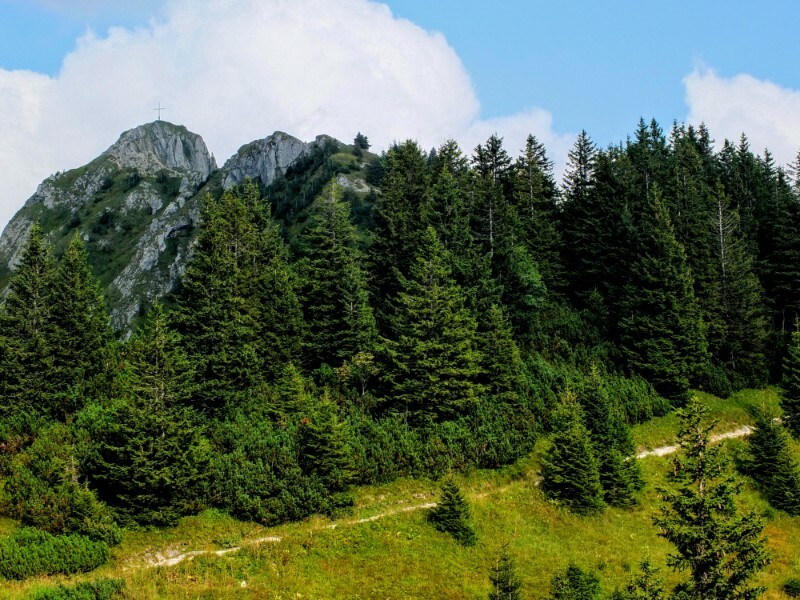 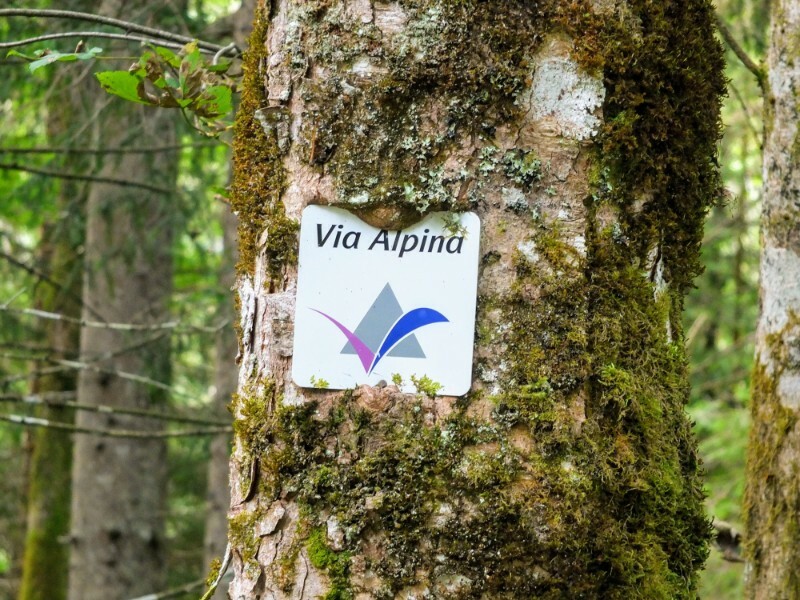 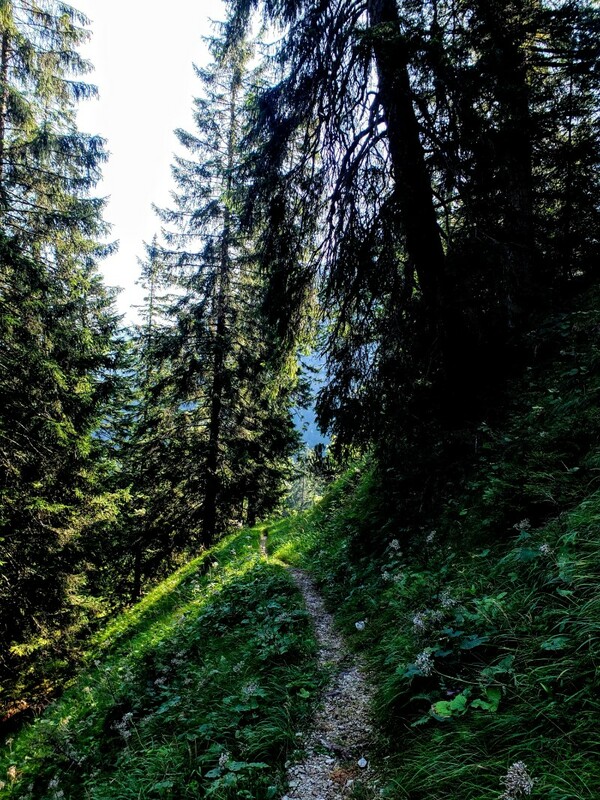 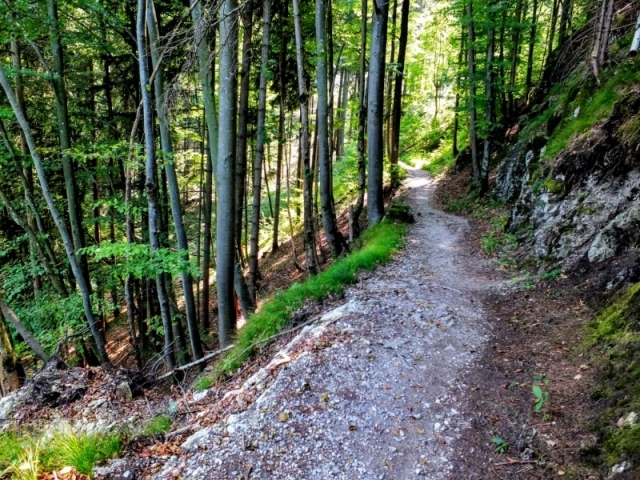 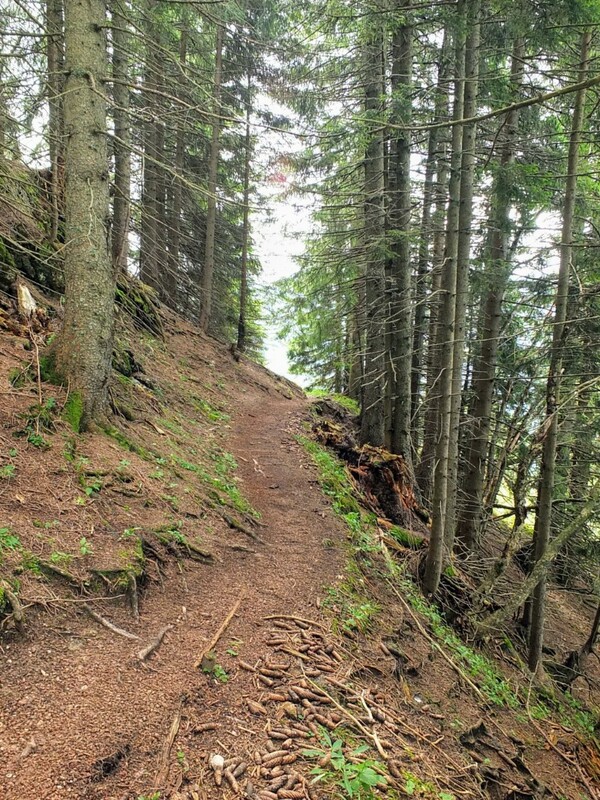 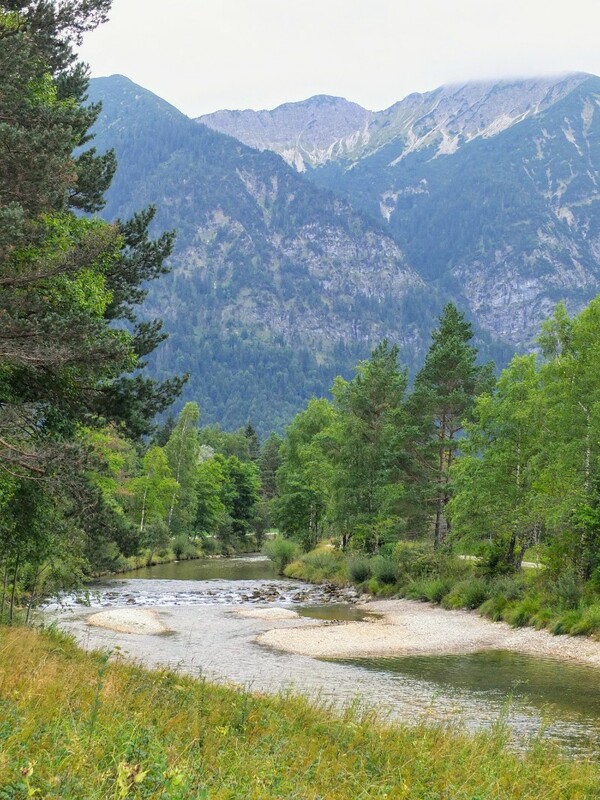 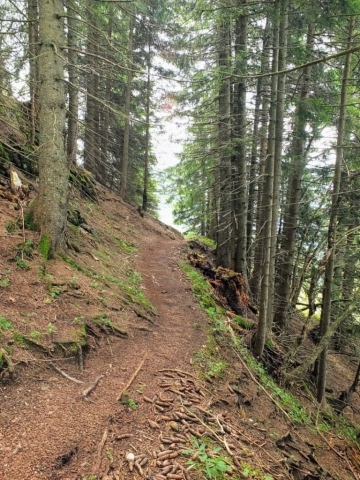 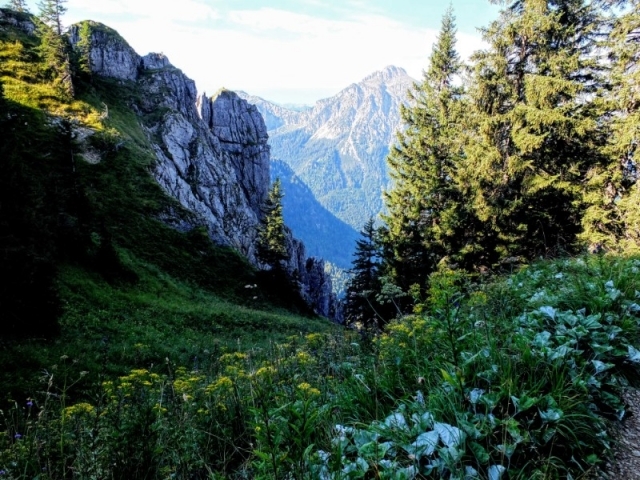 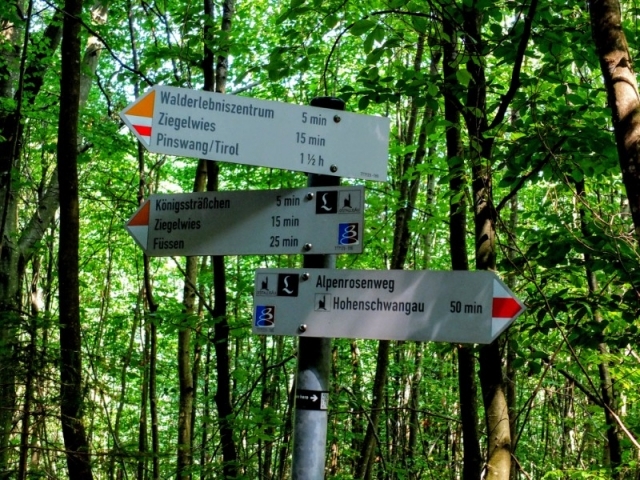 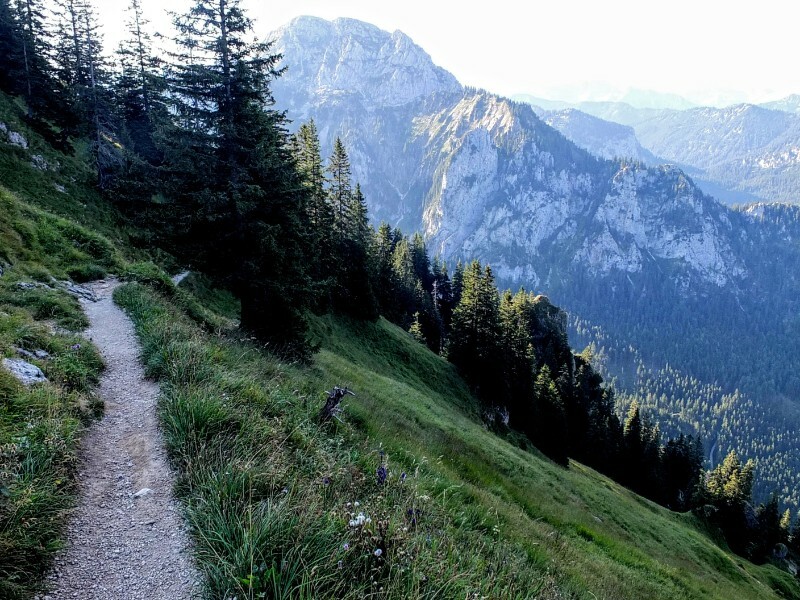 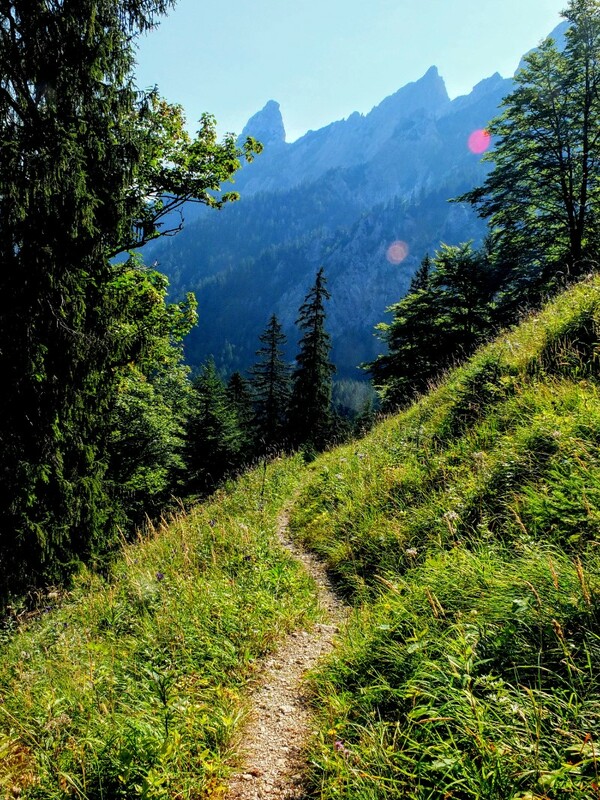 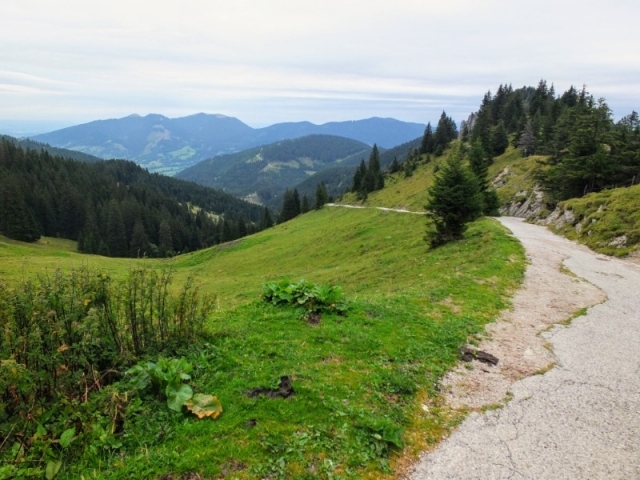 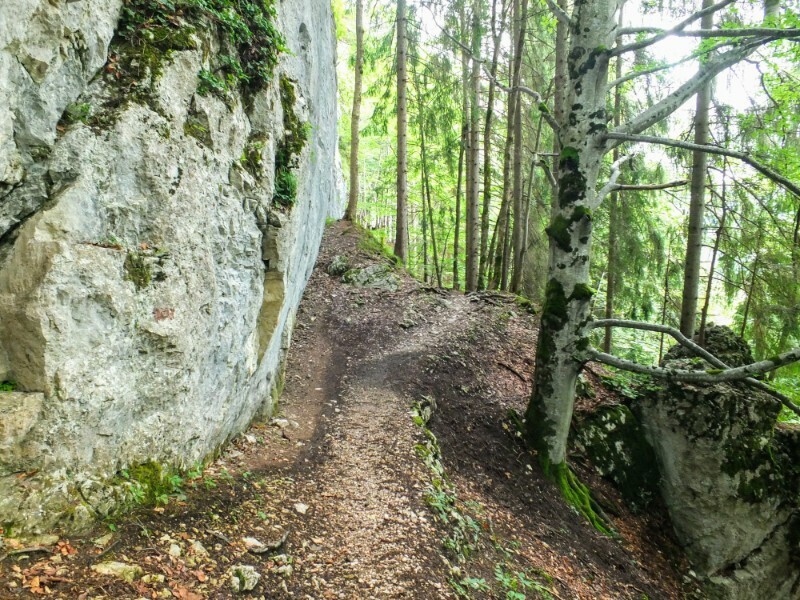 The route I chose for this trek generally followed the route of the Via Alpina, a network of 5 walking trails covering more than 3000 miles (5000 km) of distance in the alpine regions of eight European countries. 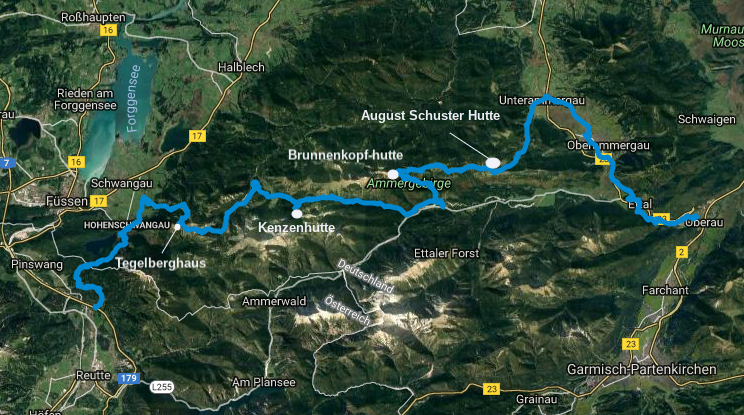 The part I was on is called the “Purple Route”. 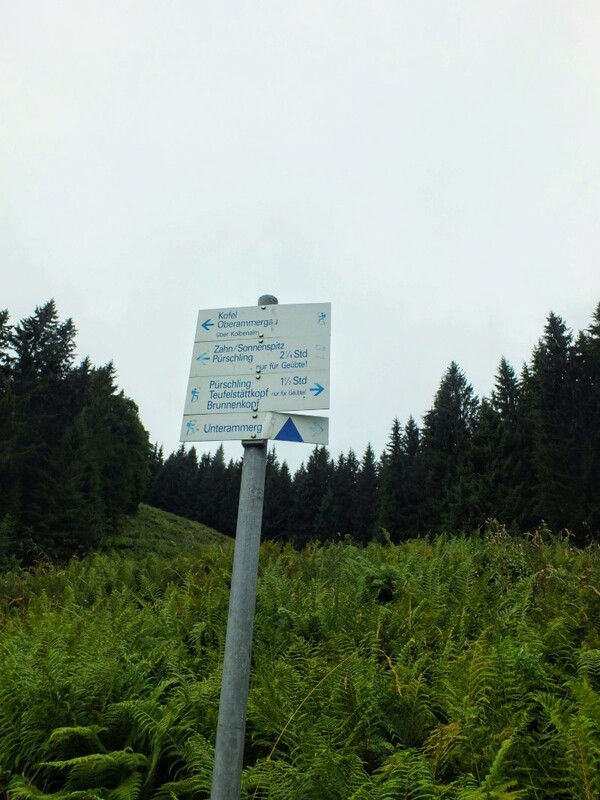 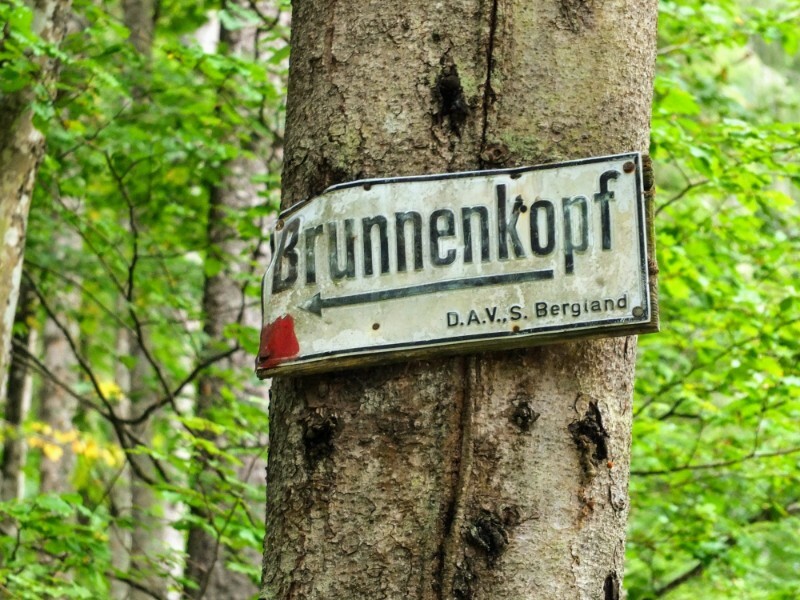 The route is well signed, although the names on the signs change — sections of the route have multiple designations. For example, routes called Maximillianswegsweg and Ludwigsweg use the same paths in some places. 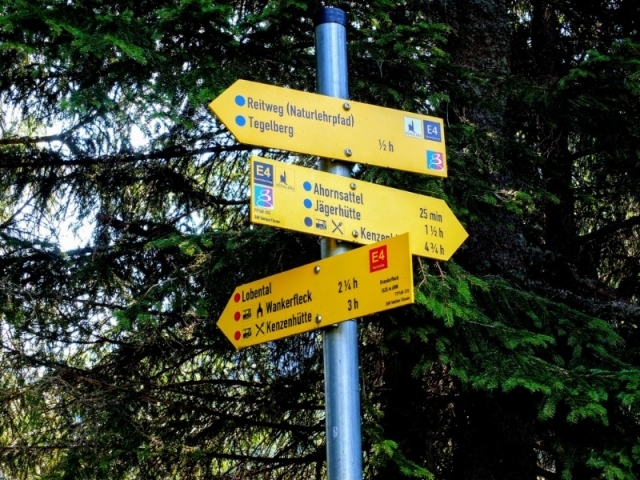 Waysigns typically would call out destinations (e.g. 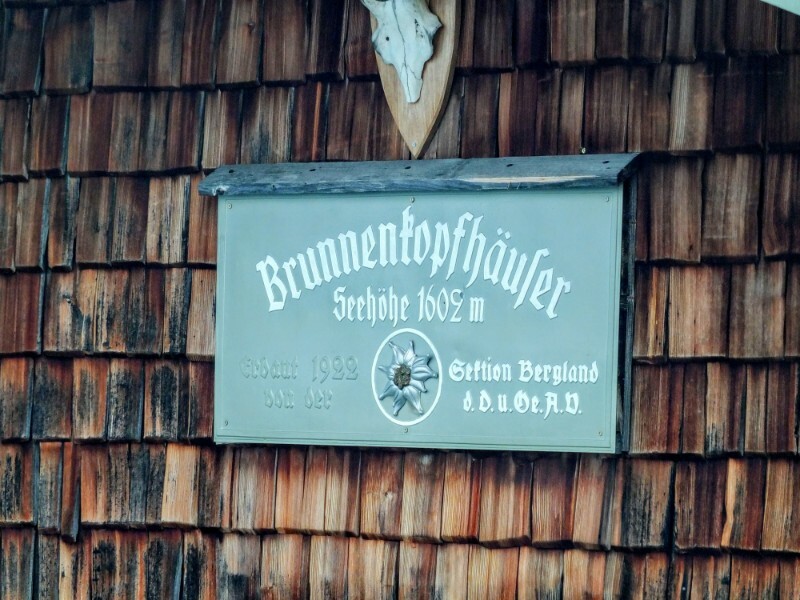 hut names), so I found that to be least confusing. 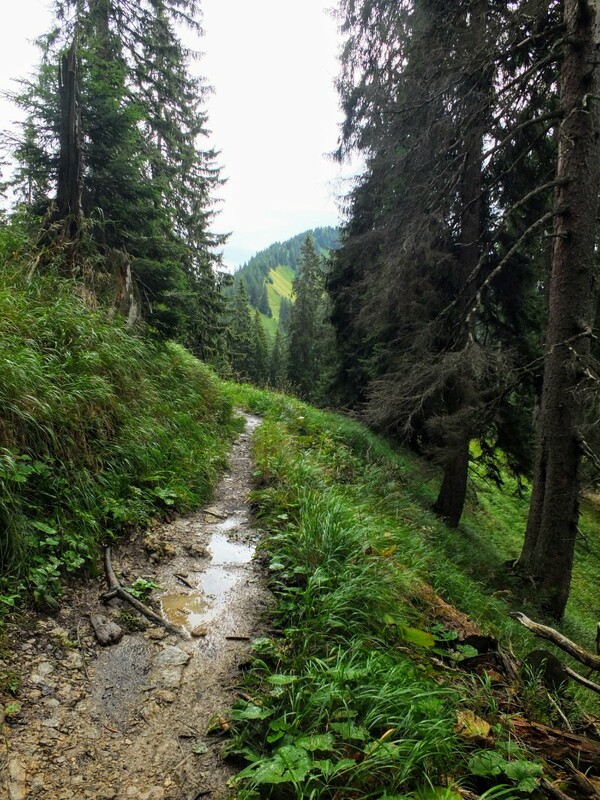 My five day hike covered a distance of about 28 miles (45 km) at elevations ranging from 2600 feet (400 m) to 5620 feet (1710 m). My hike tracker says that my total climb during the five days amounted to 8875 feet (2705 m). 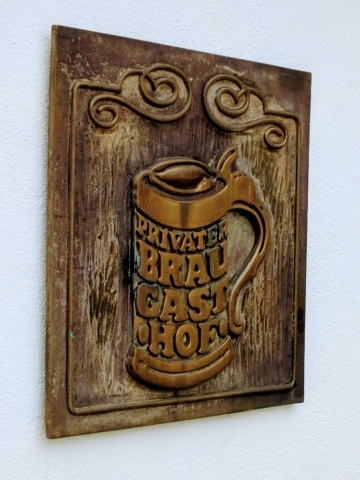 The last day is pretty much down grade. 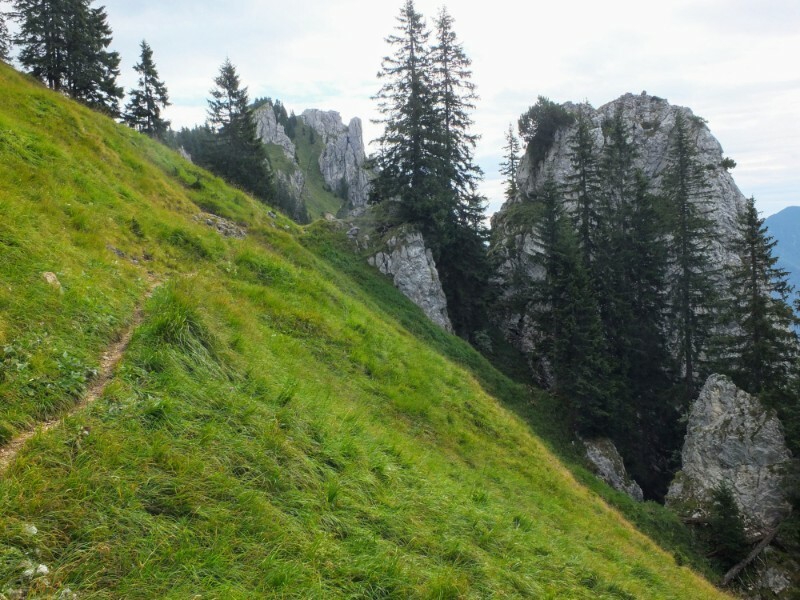 There is nothing technical about this hike and I would class it as a medium difficulty hike with some difficult sections owing to steepness. The following gallery with give an idea of what the trail looks like at various places along the way. 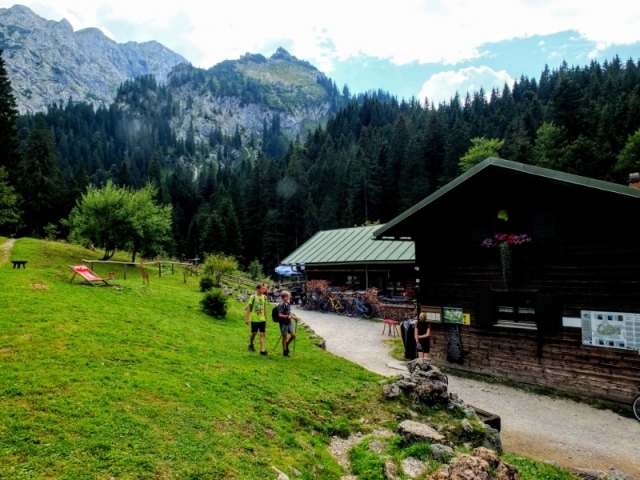 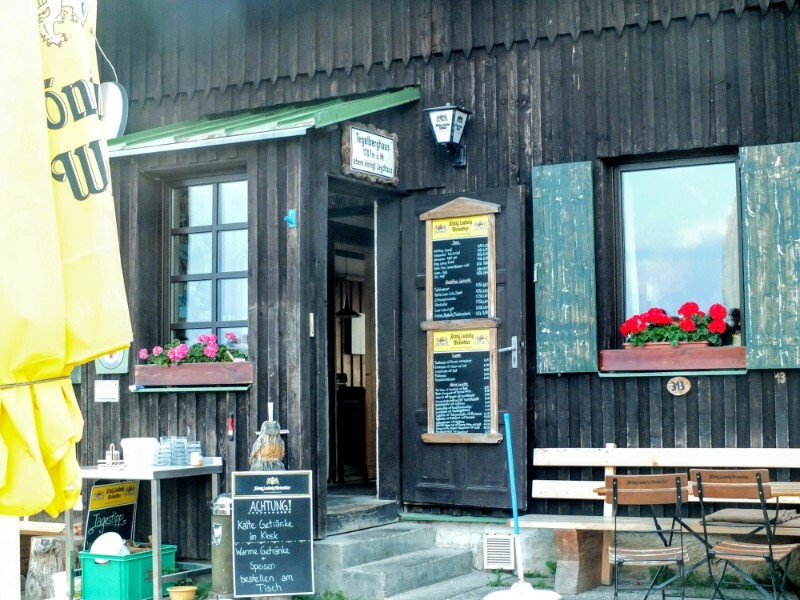 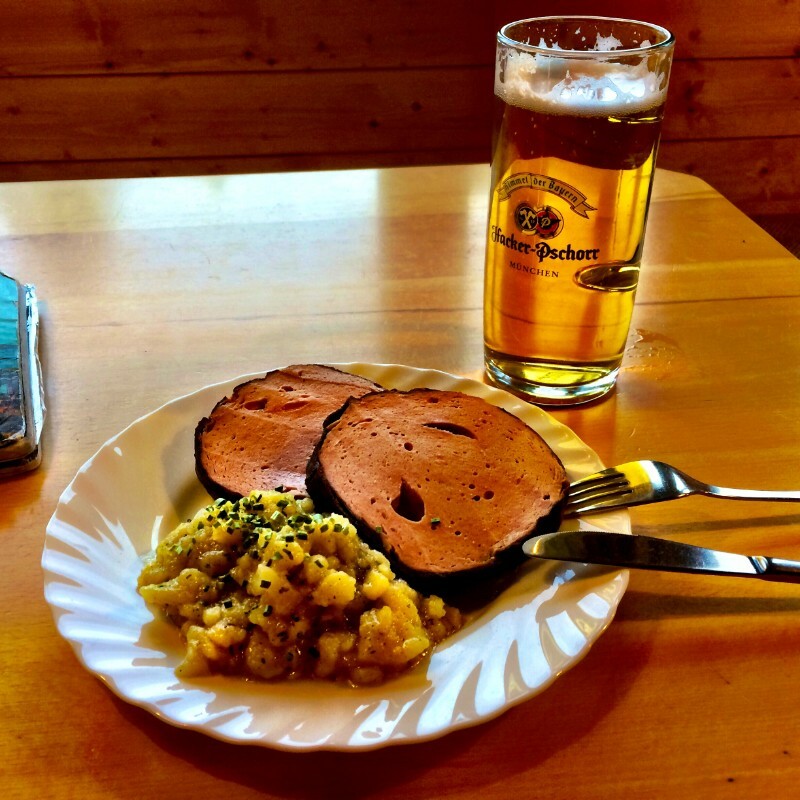 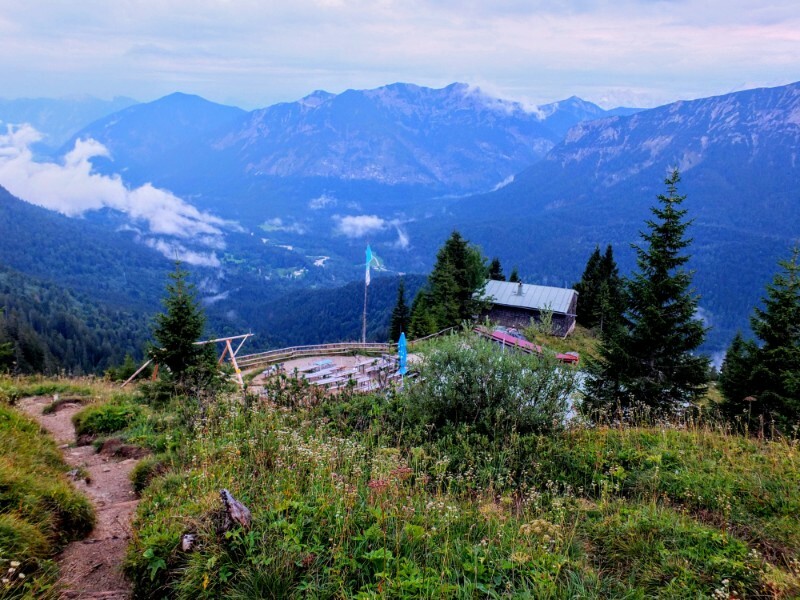 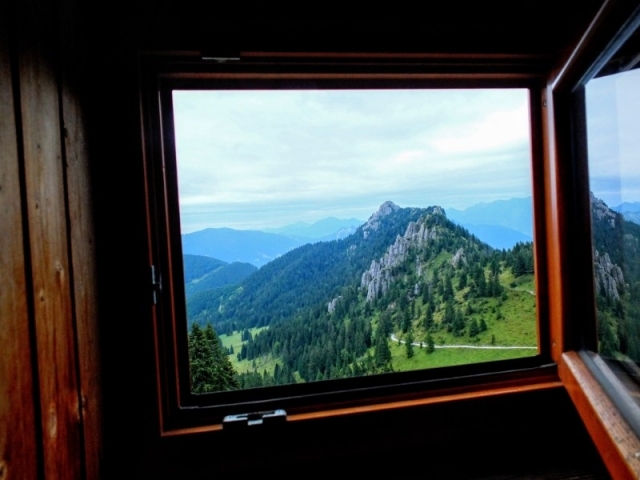 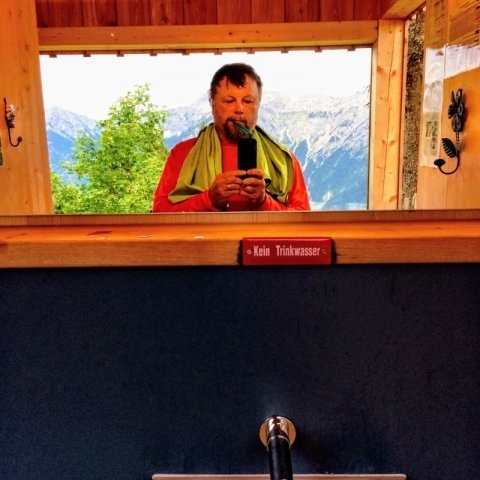 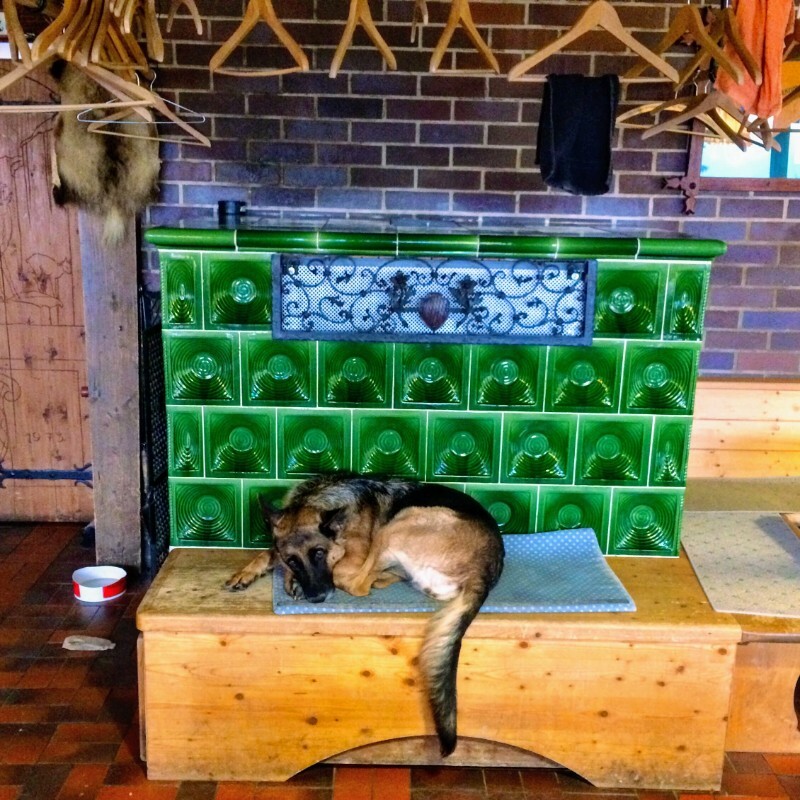 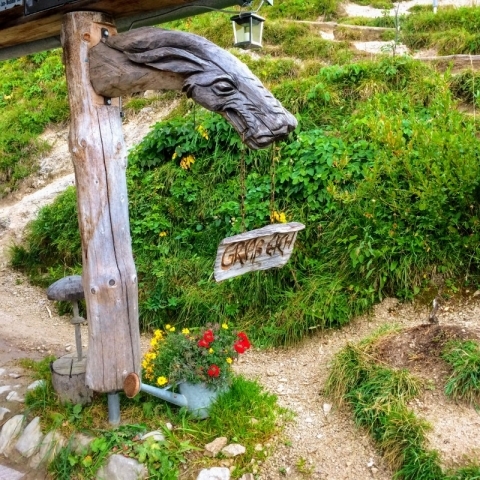 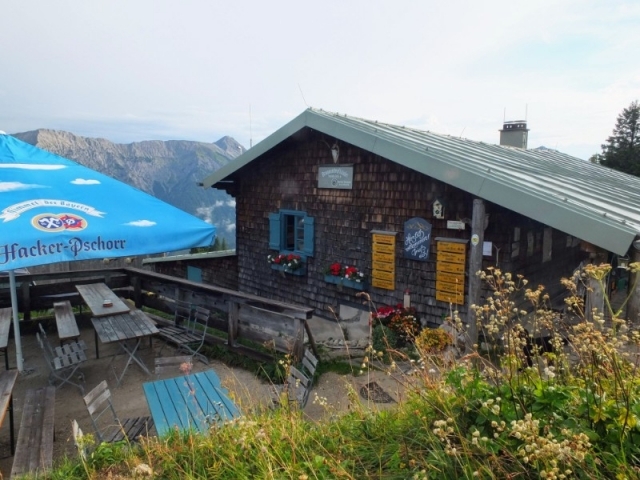 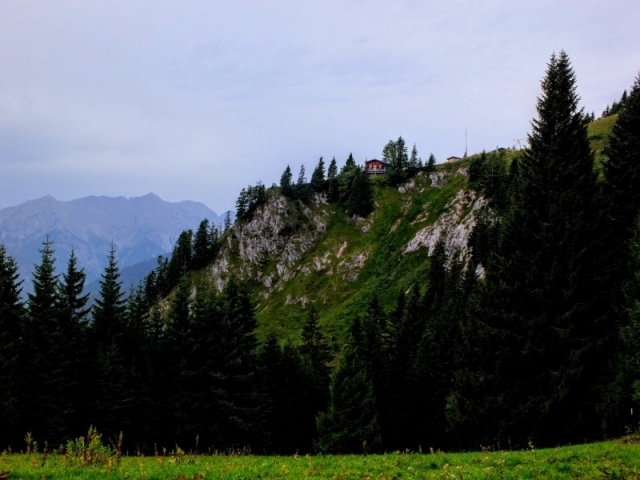 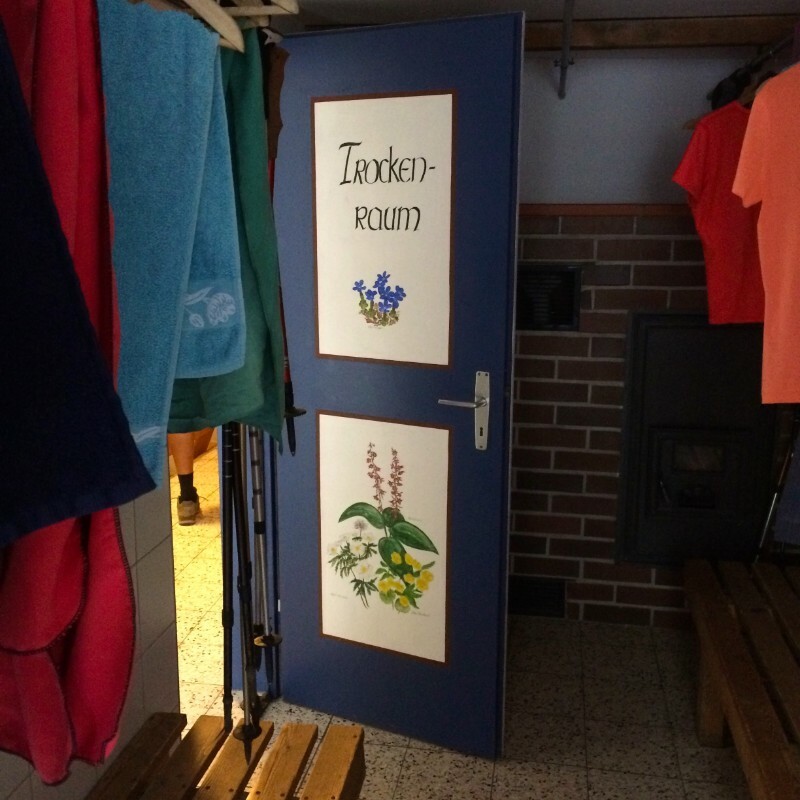 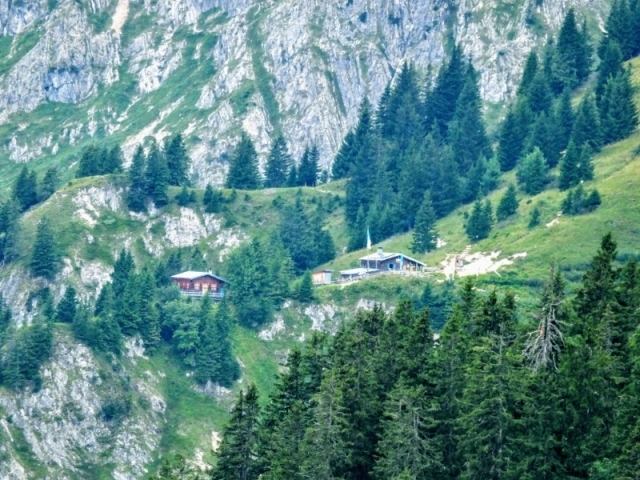 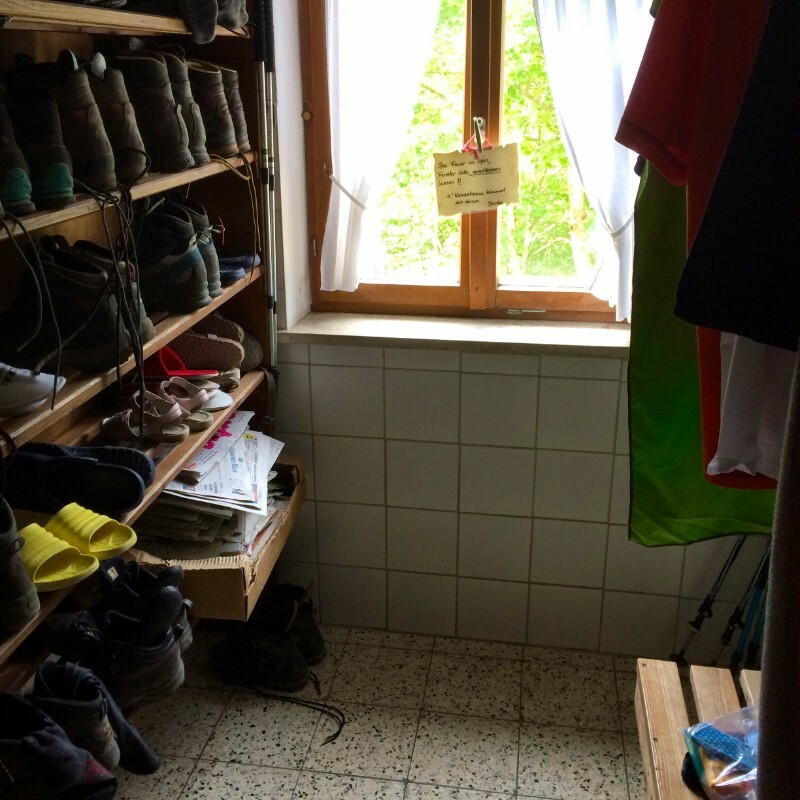 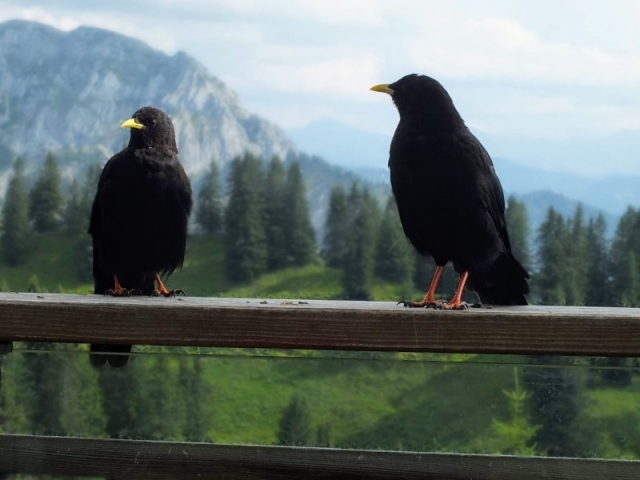 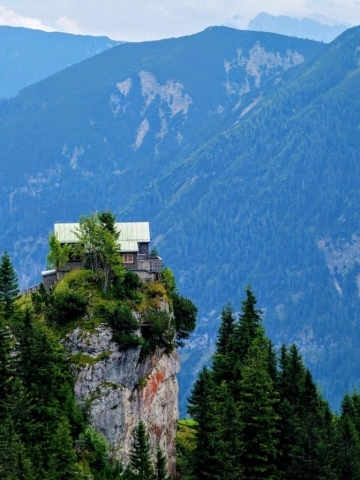 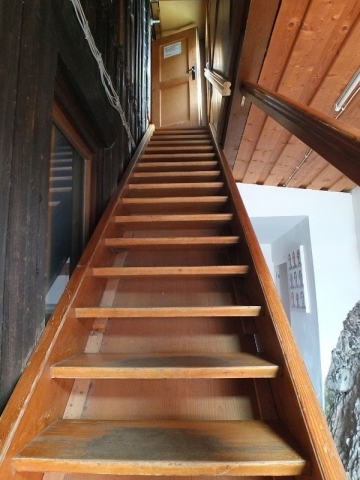 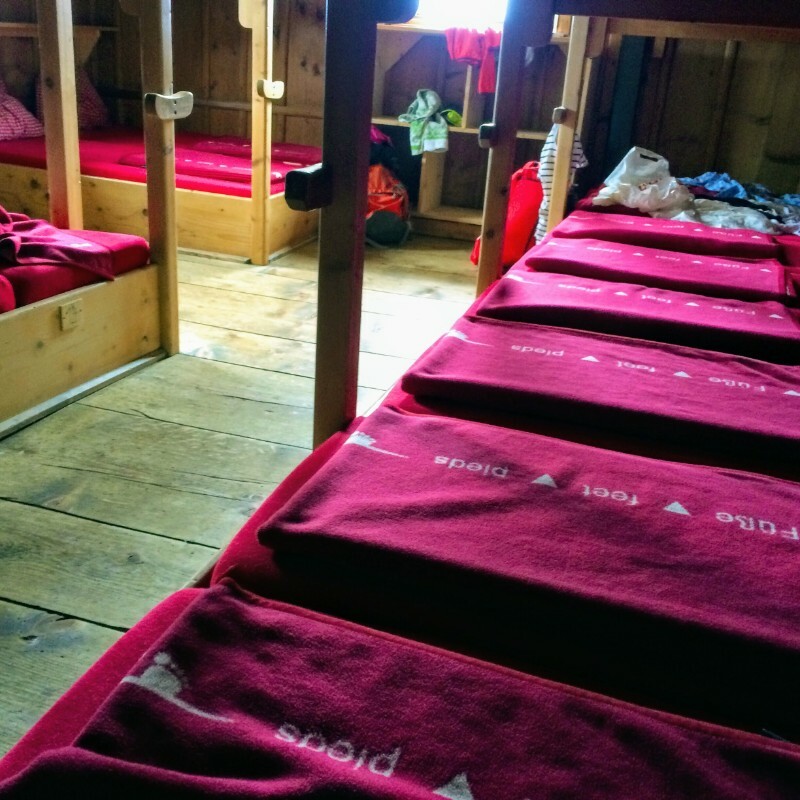 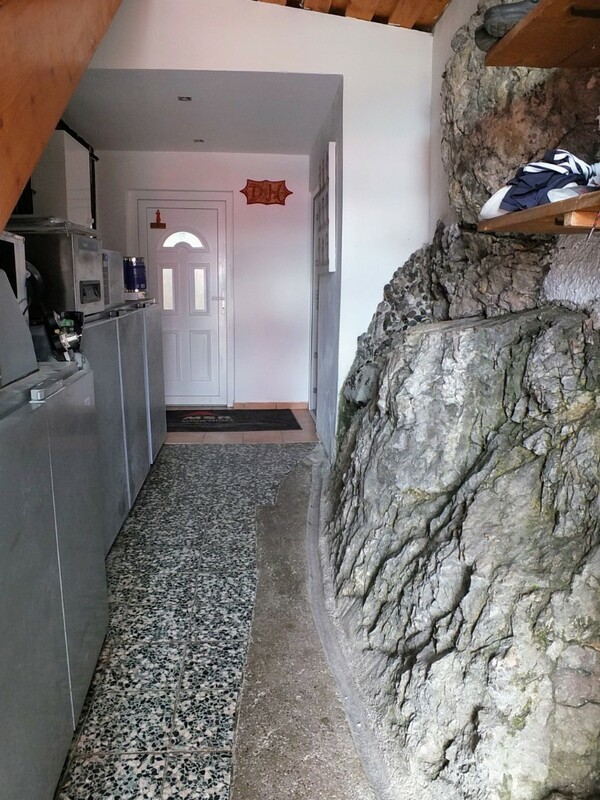 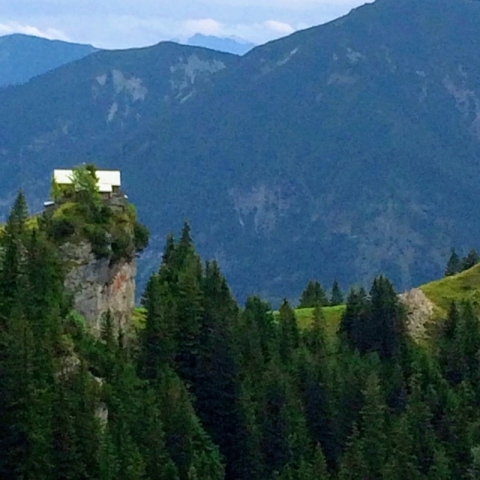 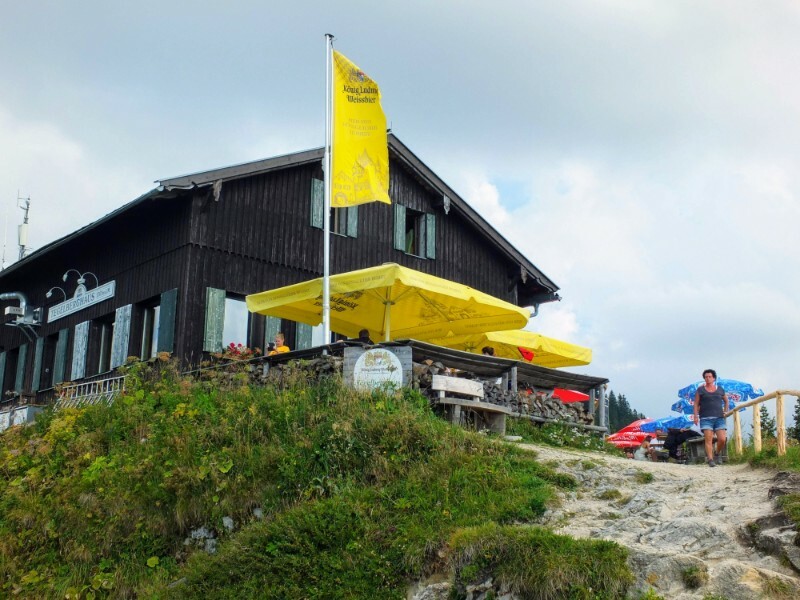 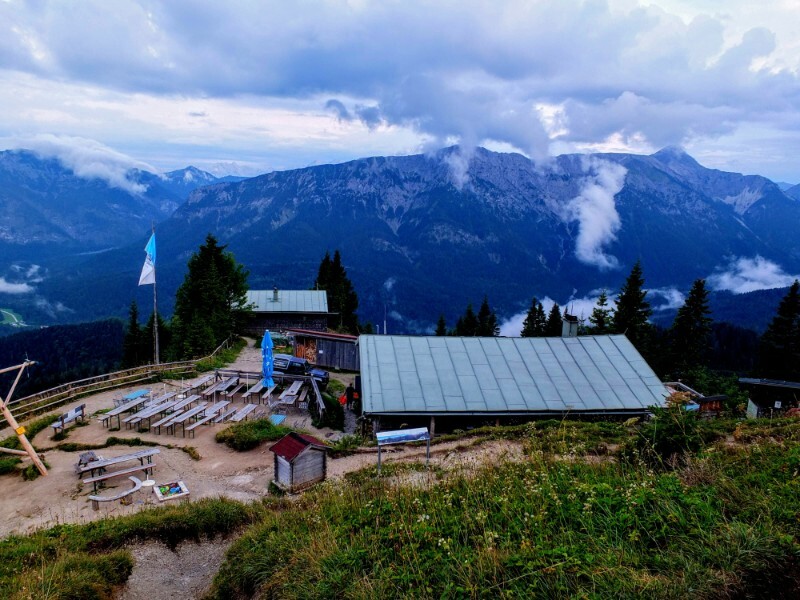 The mountain hut system in Germany (and throughout the Alps) is well organized and most huts in Germany are affiliated with the Deutscher Alpenverein (DAV) — the German Alpine Association. The availability of the huts mean that you don’t have to carry much gear or food on a hike like this. 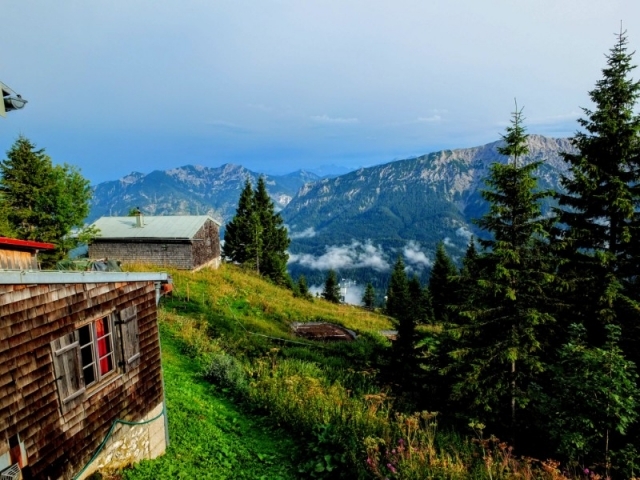 The huts vary in size and service, but suffice it to say that referring to them with the word “hut” is often an understatement. 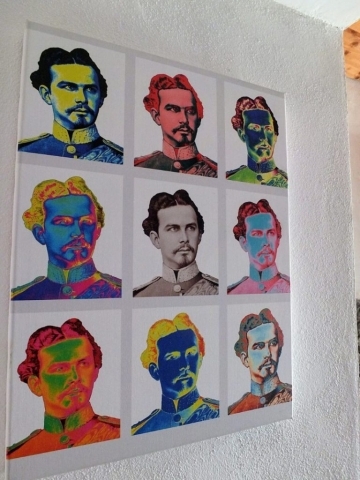 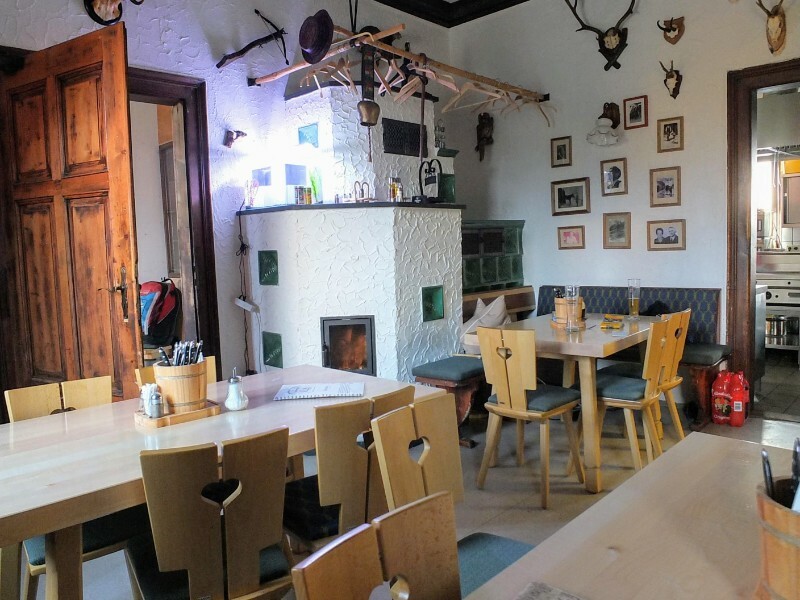 Each of the places I stayed seemed to be operated by an independent business person or manager, but to a basic standard that I assume is set by the DAV. 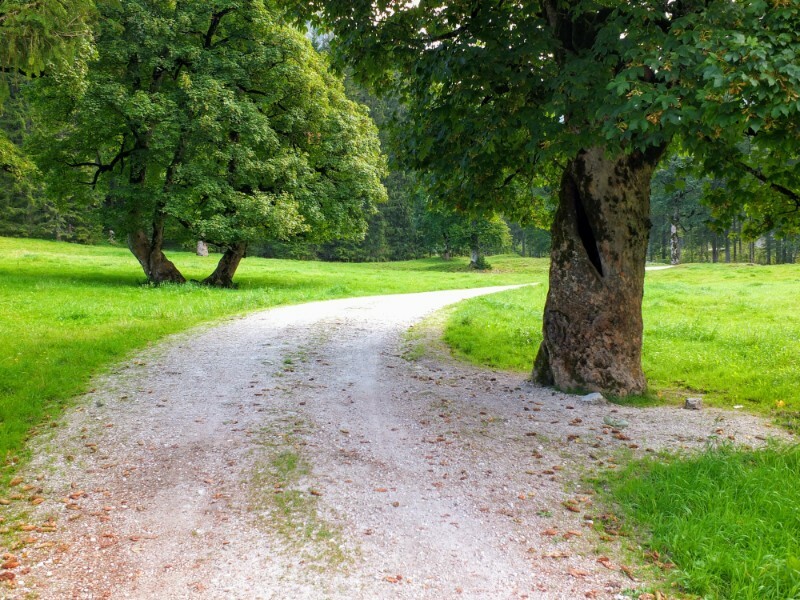 Even though each place was different, you could count on a common set of basics. 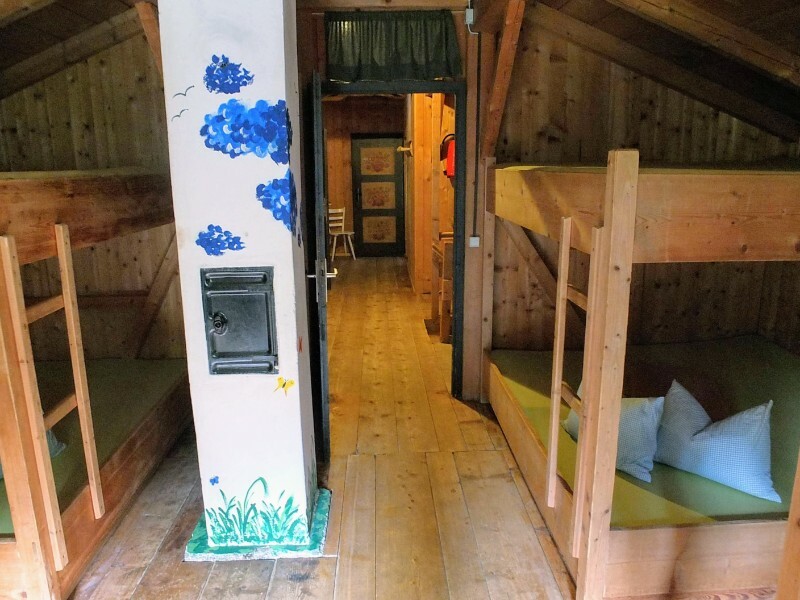 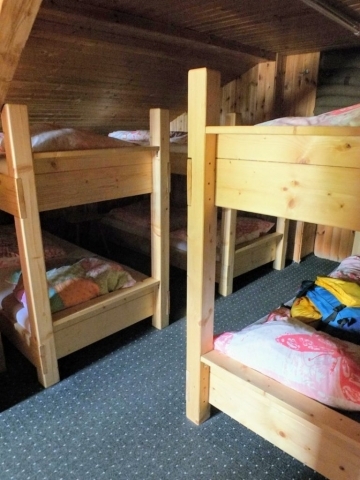 For instance, I carried a hostel sack to sleep in but relied on the hut for a bunk, blanket, and pillow. 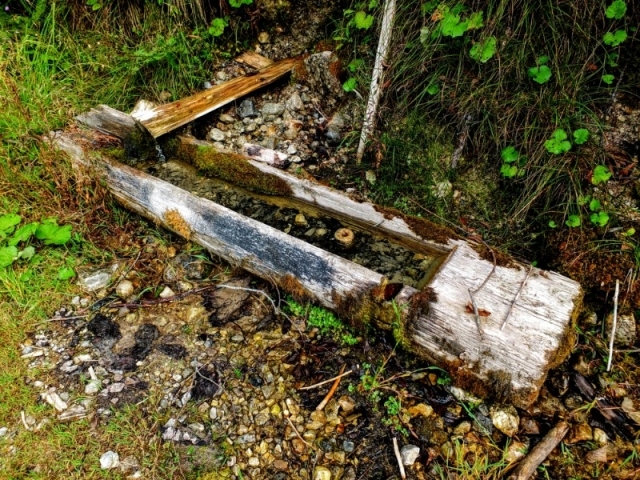 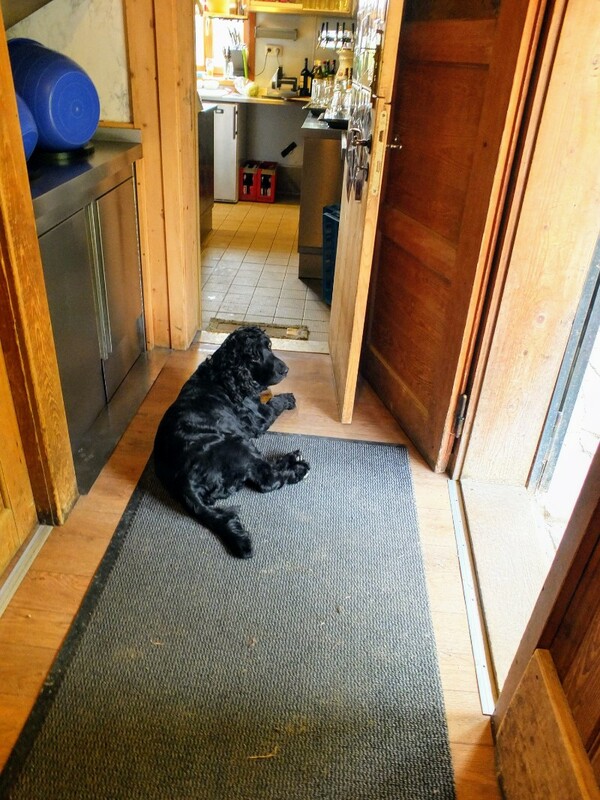 Similarly, I could count on the huts for helpful staff, water resupply, hearty food, and a nice beer or three. Some are quite small with places for a dozen or less people and some are quite large — able to house many dozens. 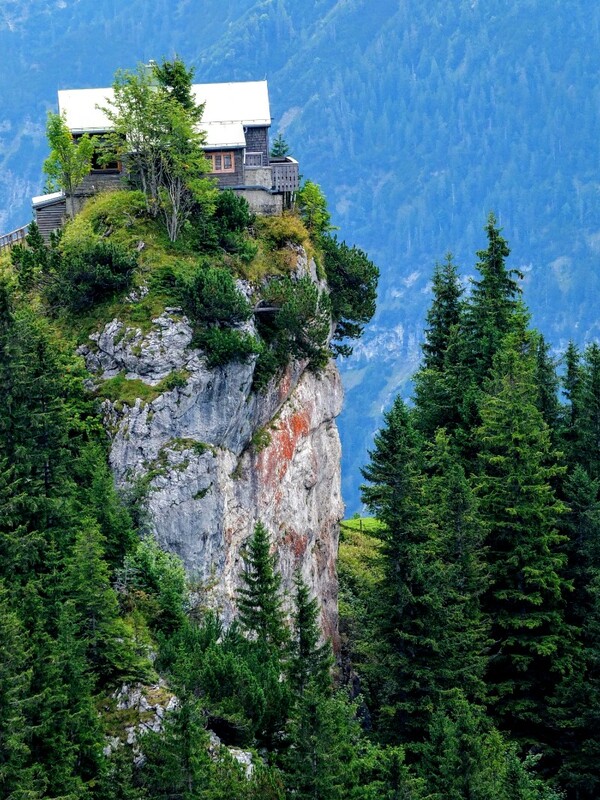 Forget about cell service or internet connection. 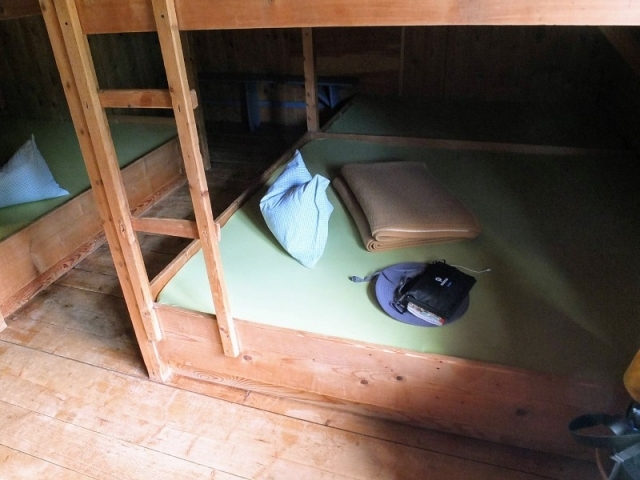 My trip was on weekdays so there were few others staying overnight. I’ve heard the places can be quite busy on the weekends. 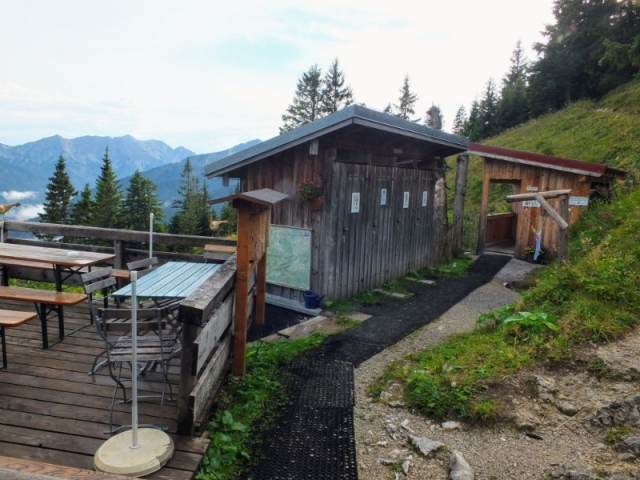 Huts like these are generally open from June to early October – I called ahead and made reservations individually with each hut (as far as I know there is no central reservation service nor any way to make reservations over the internet). I may be a wuss or something, but I have to say I love this kind of hut experience. 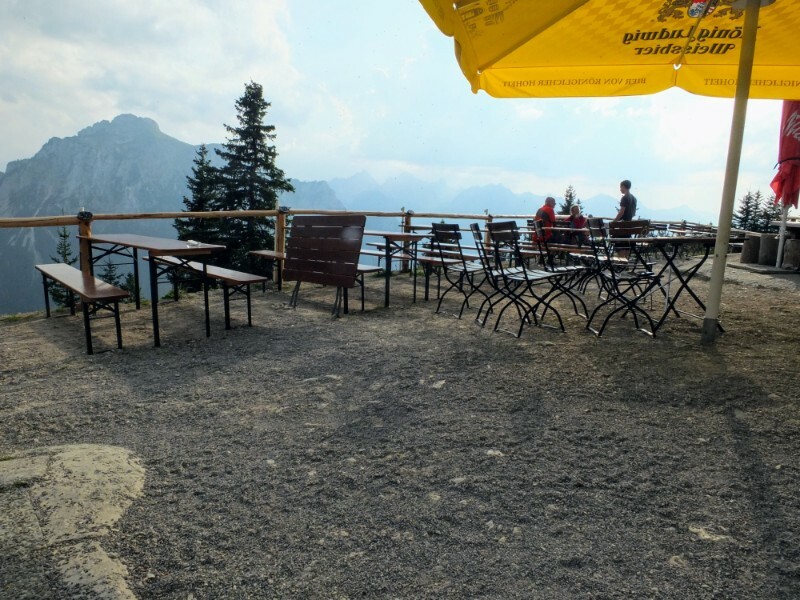 There is nothing like kicking back on a sunny terrace and enjoying a nice beer and a fantastic view after spending a day on the trail. 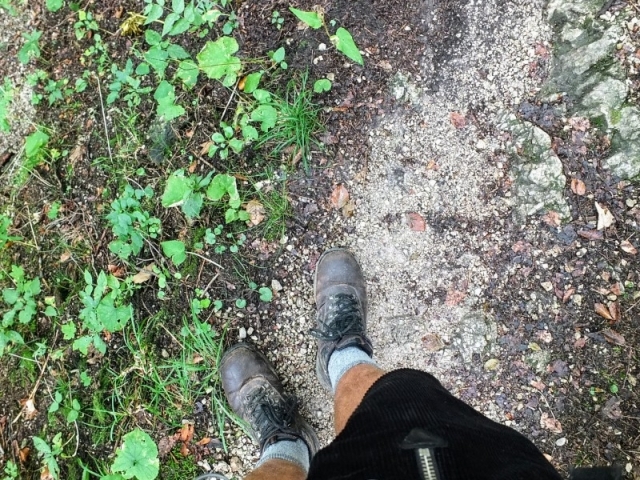 As a devoted beer hiker, I was not disappointed in any way by this adventure. 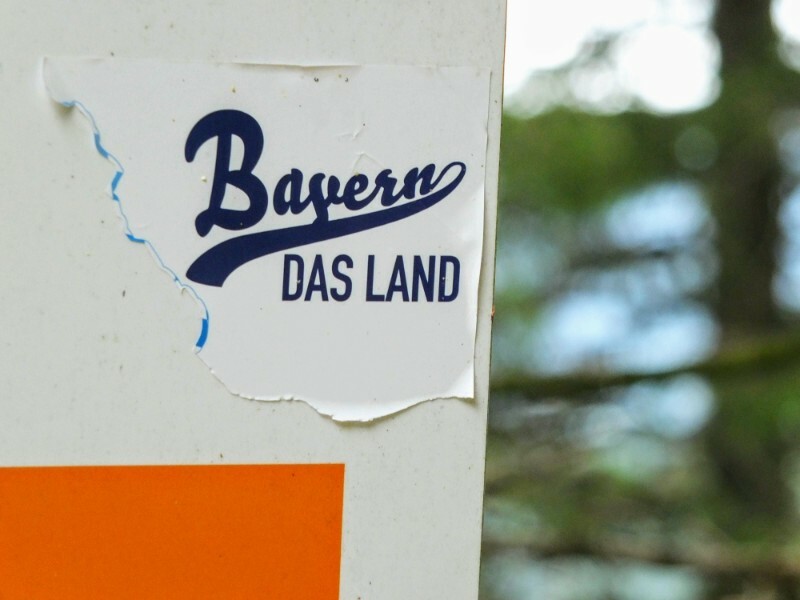 Although breweries are fewer and farther between than in other parts of Bavaria, there was plenty of good beer to be had along the way. 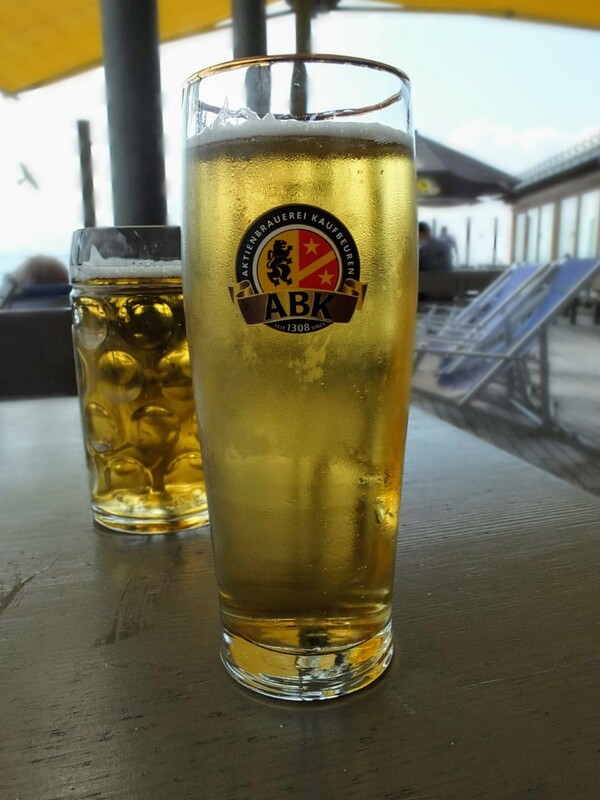 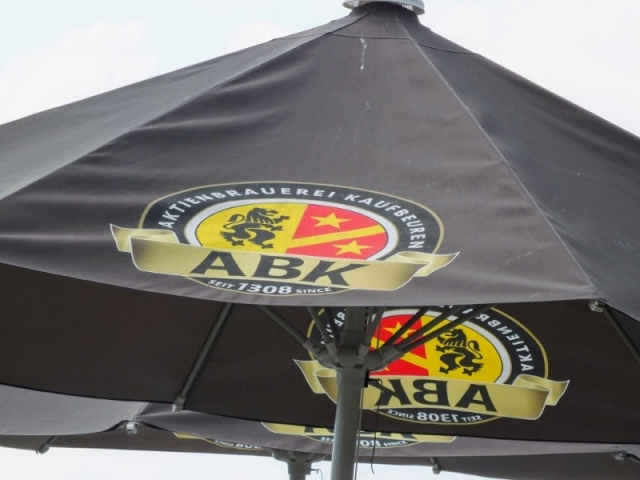 In the huts, I encountered beers from a variety of breweries including Schlossbrauerei Kaltenberg (King Ludwig beers), Aktienbrauerei Kaufbeuren (ABK), and Hacker-Pschorr from Munich. 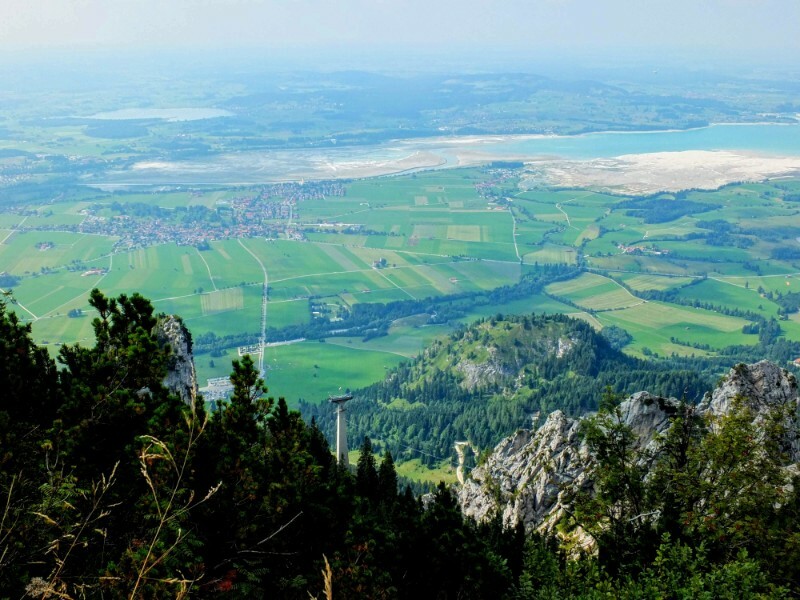 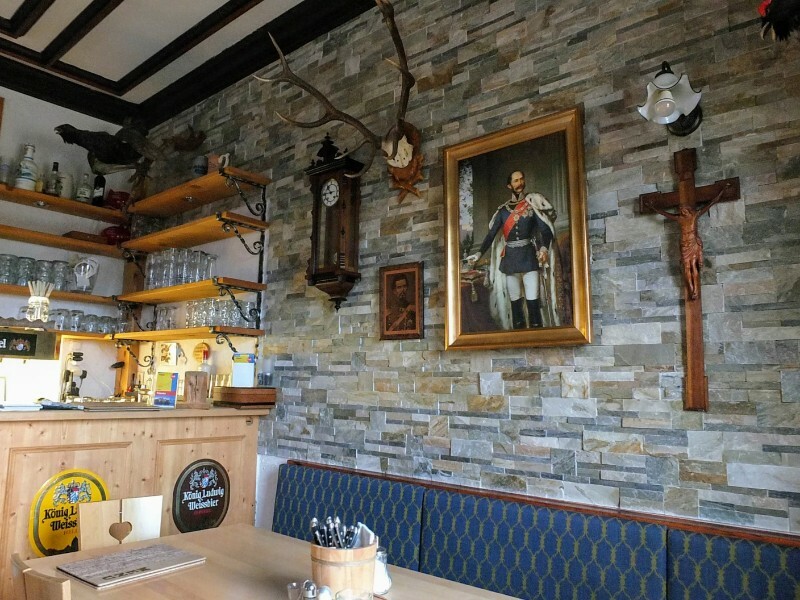 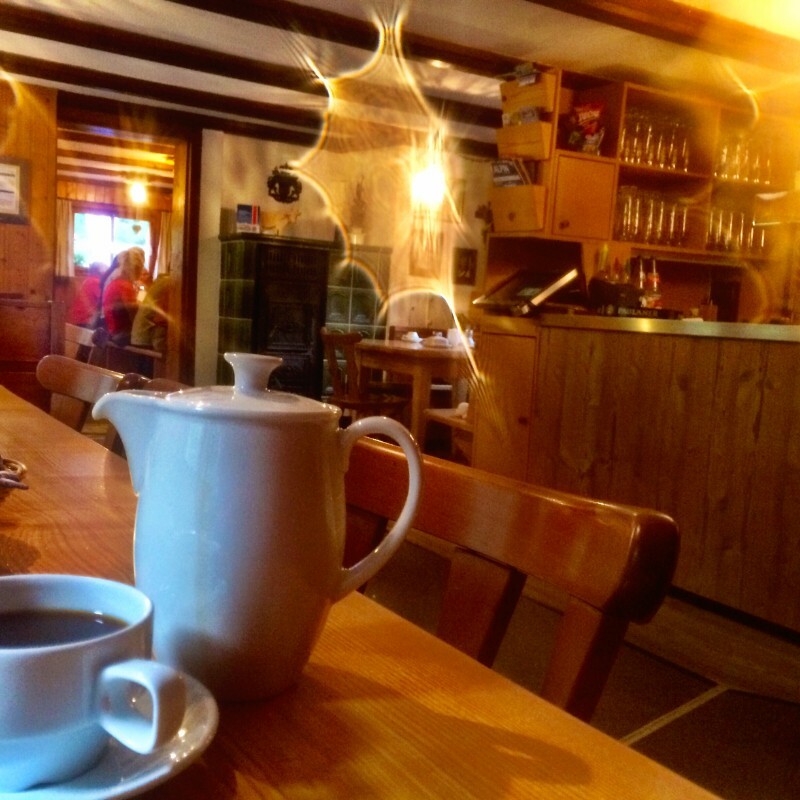 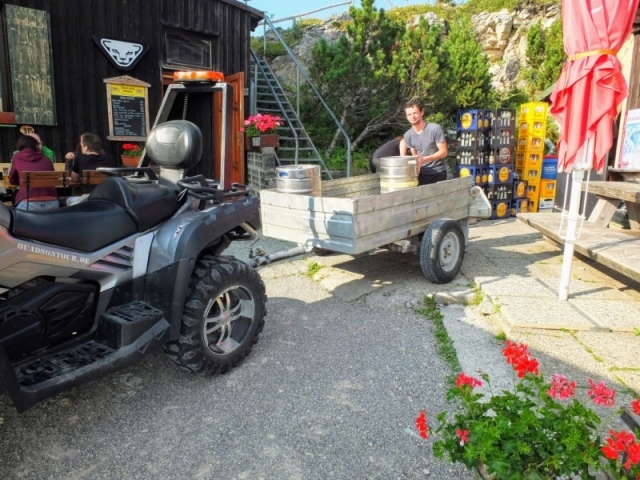 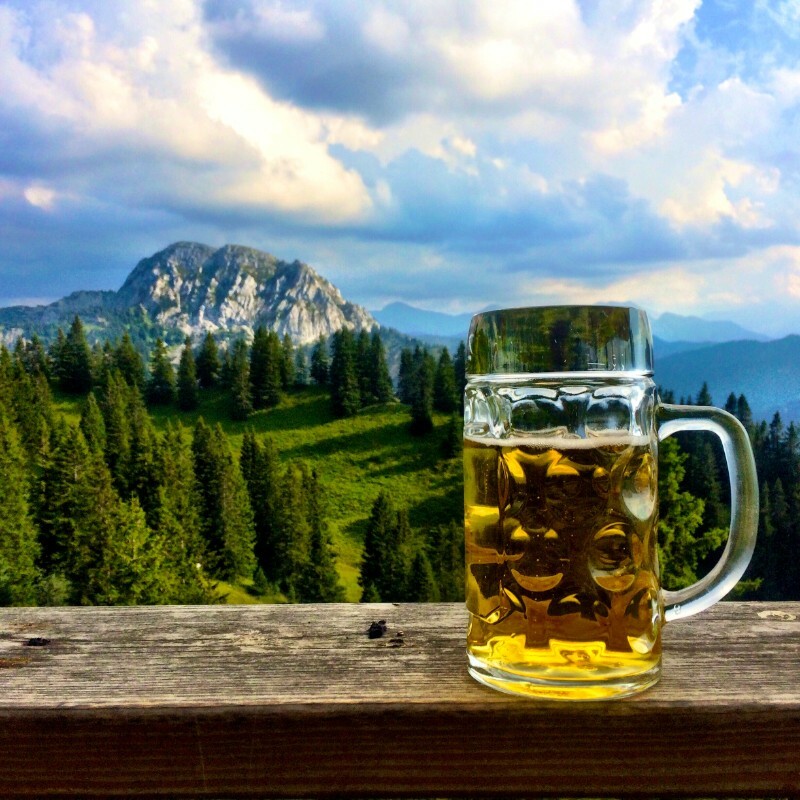 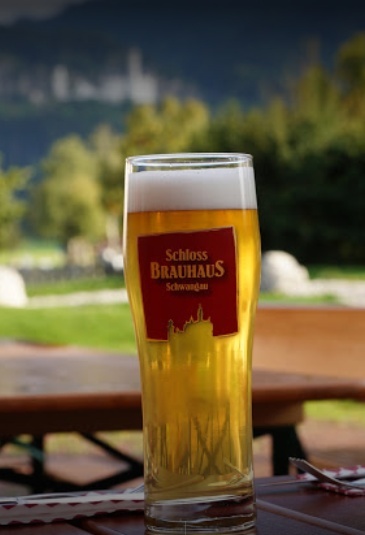 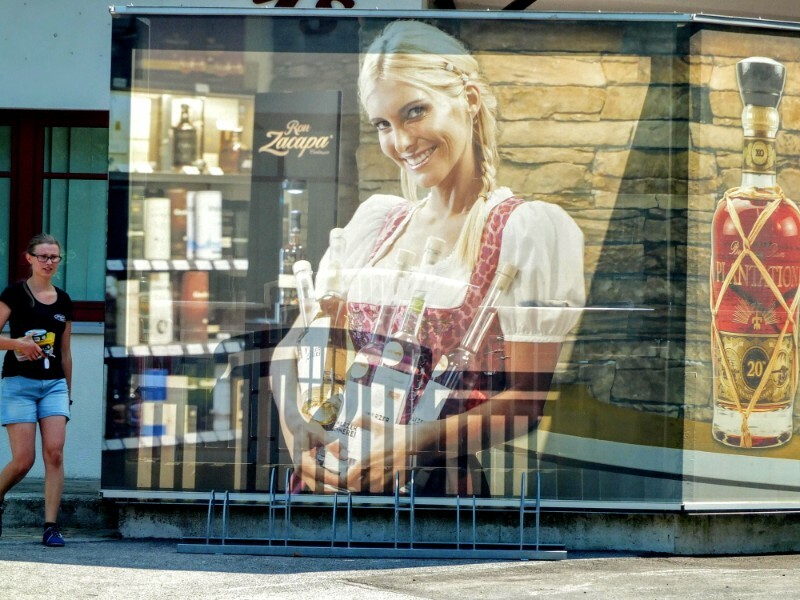 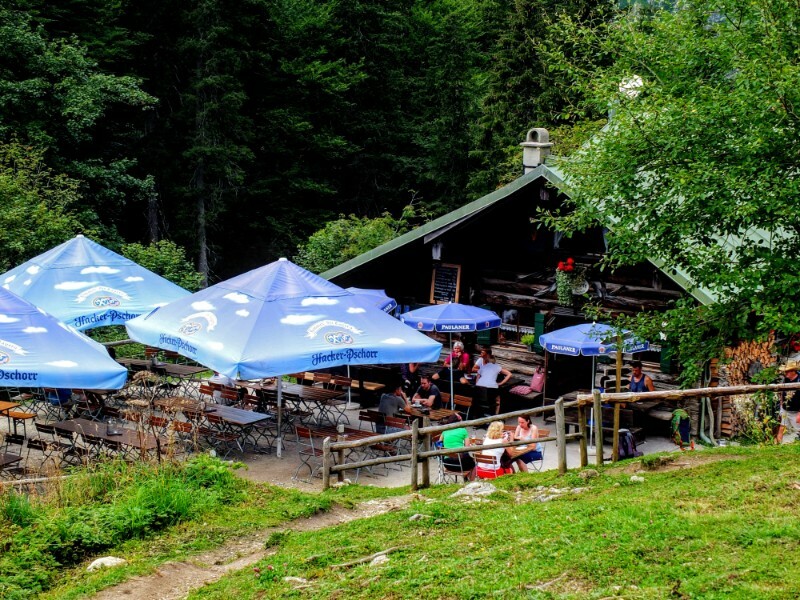 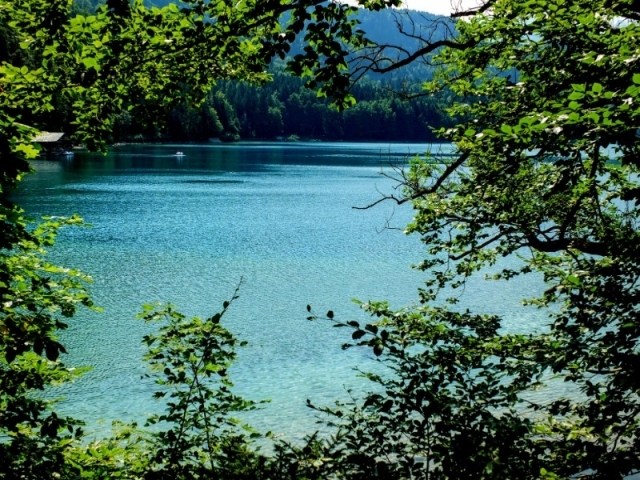 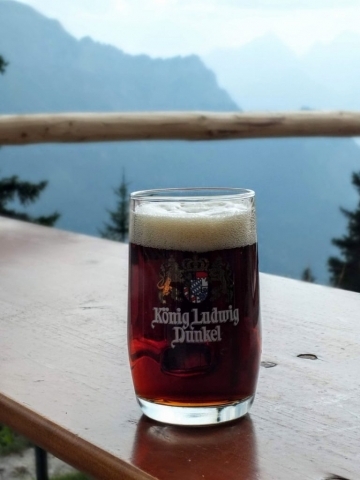 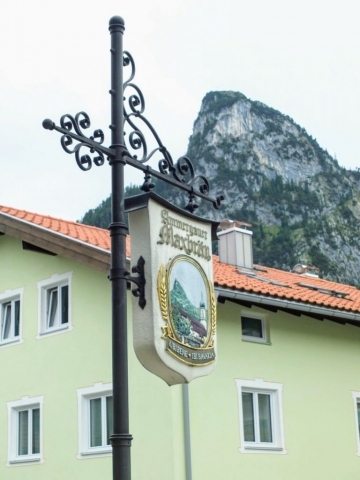 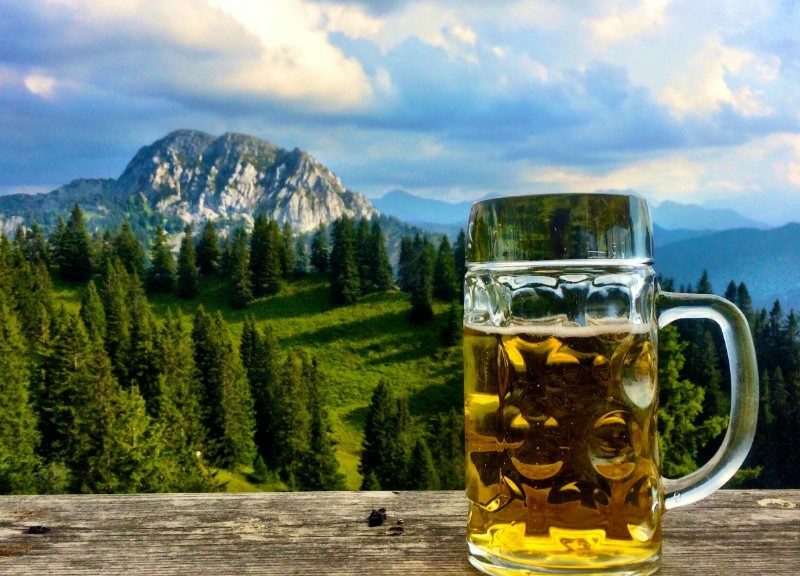 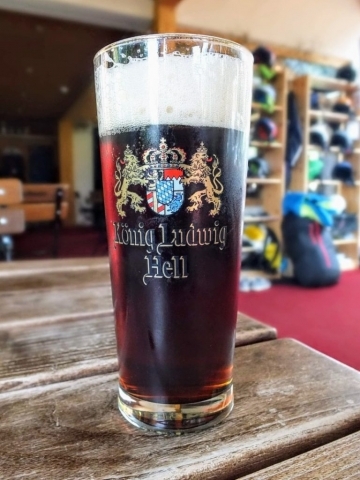 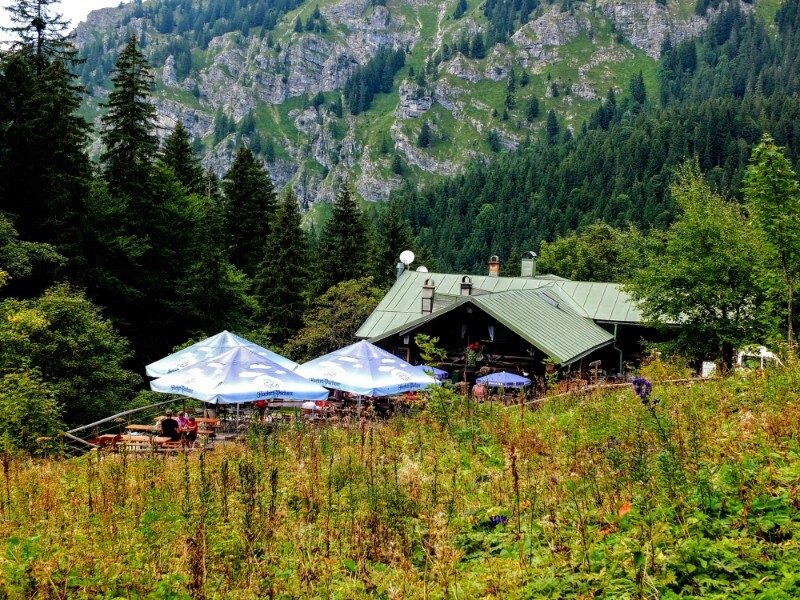 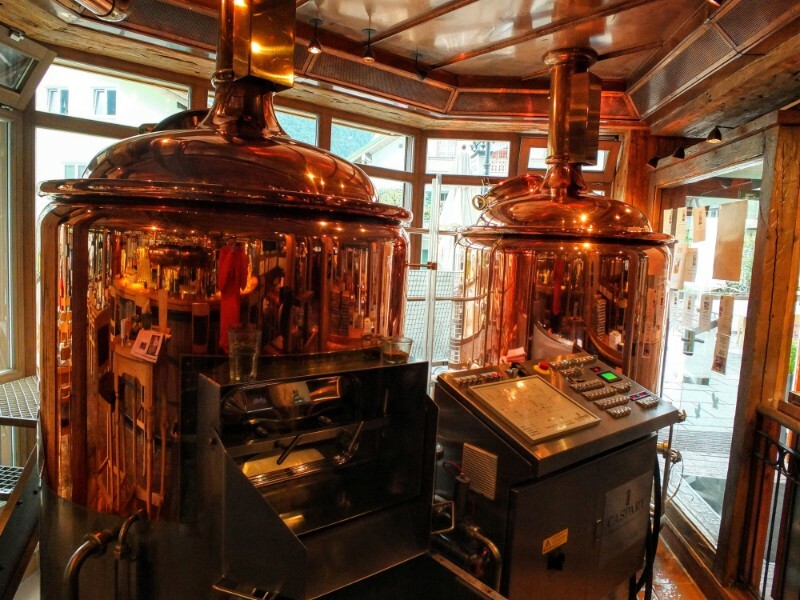 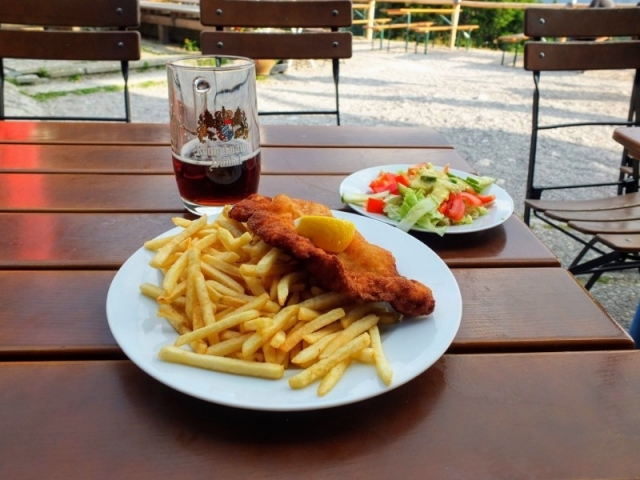 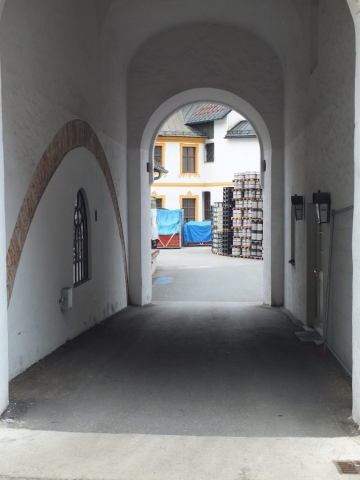 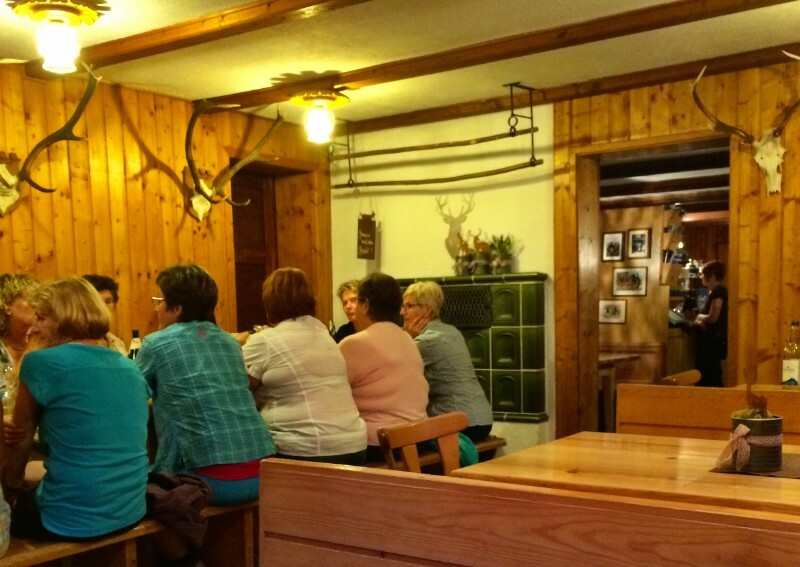 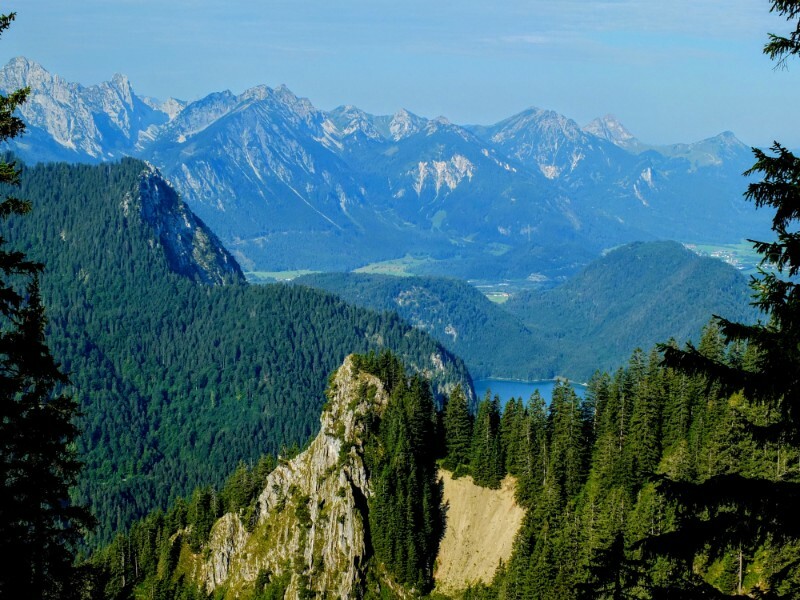 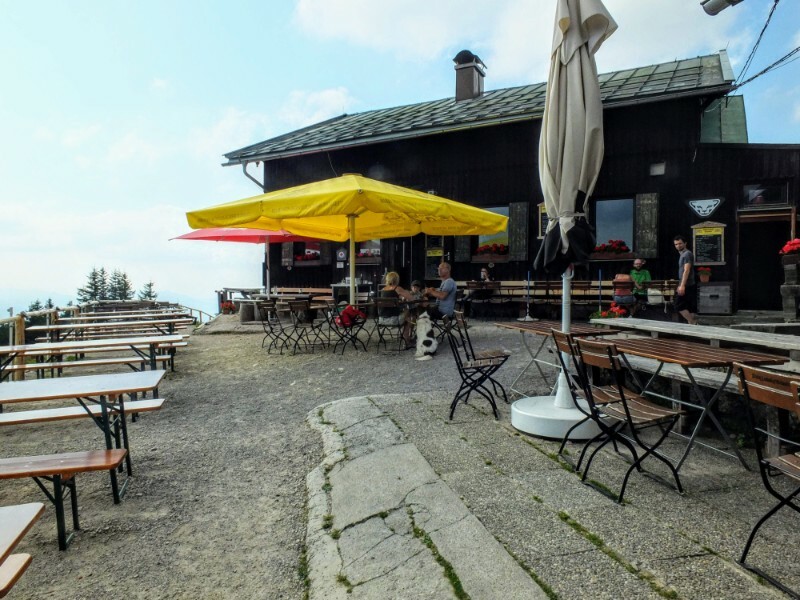 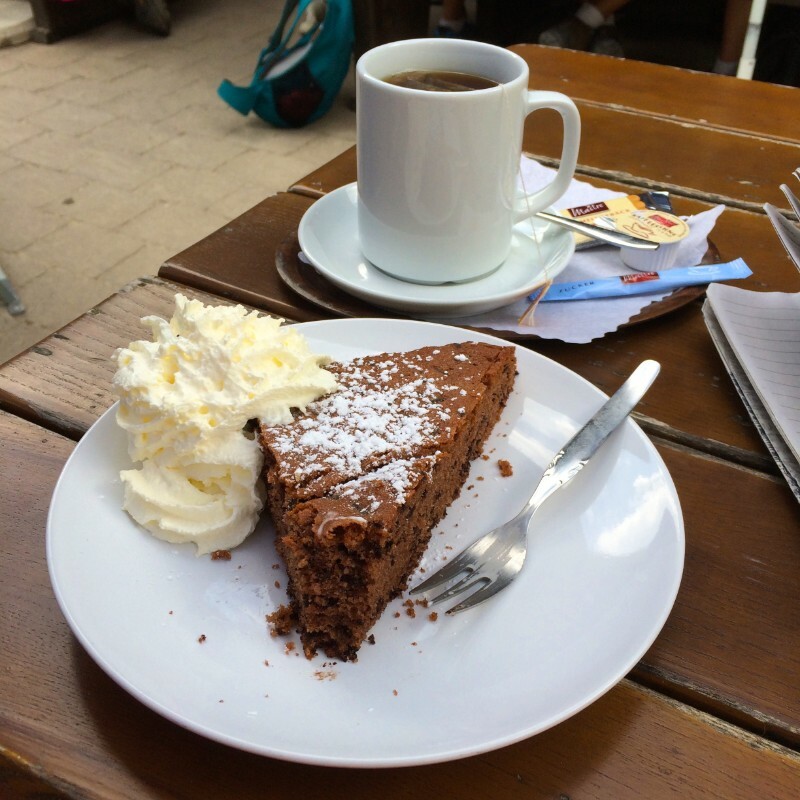 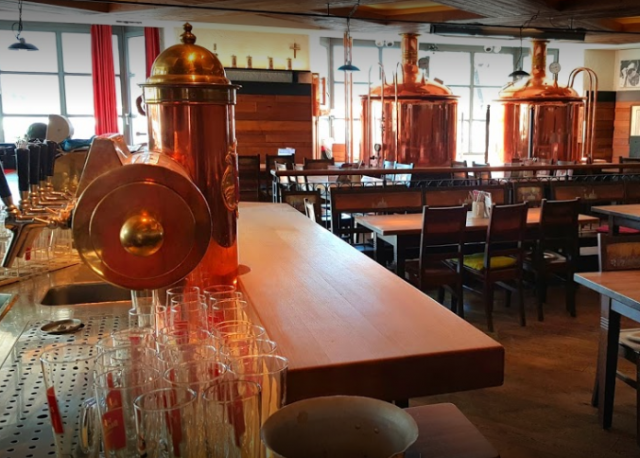 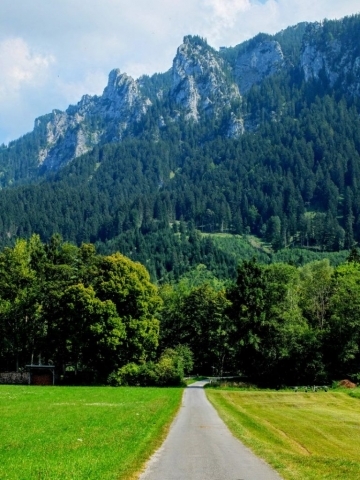 There is a family-owned brew pub and distillery in the village of Schwangau called Schlossbrauhaus Schwangau — it is just a bit off the route located near Neuschwanstein castle. 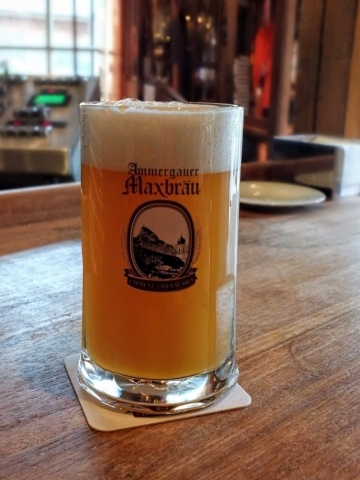 For IPA lovers you can find one there along with a nice line-up of traditional German brews. 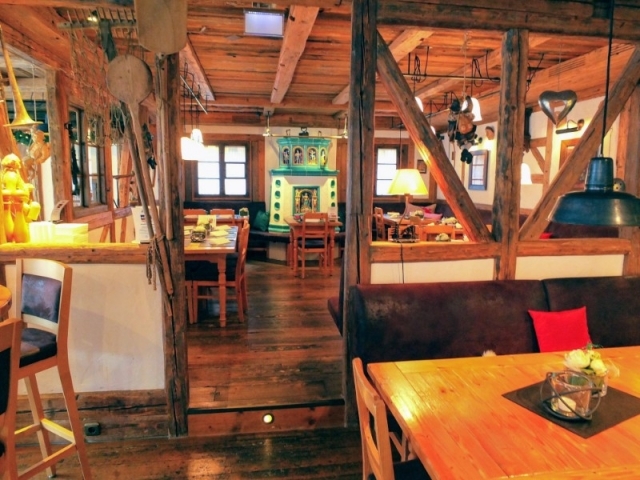 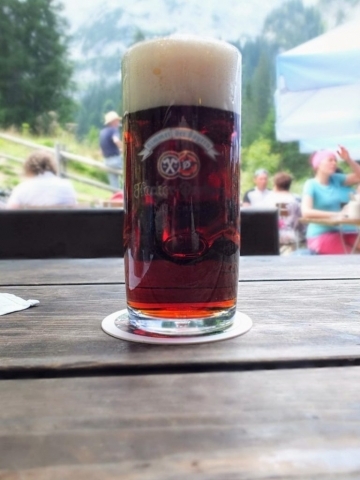 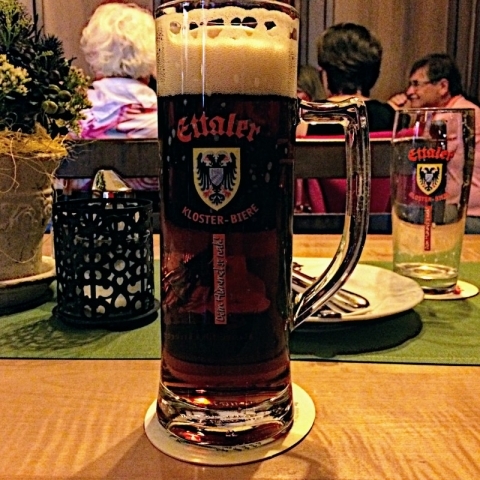 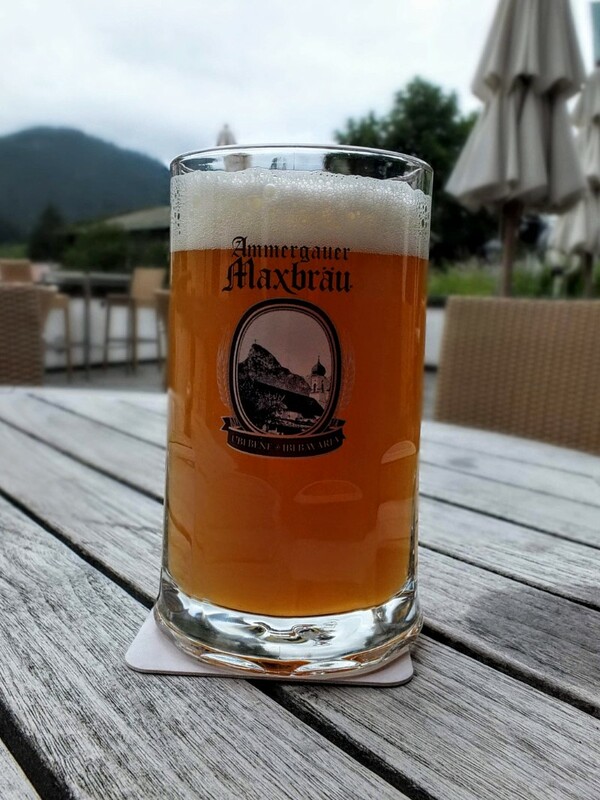 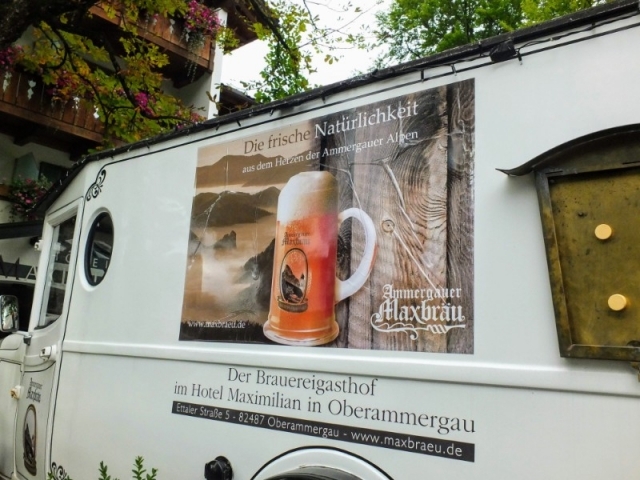 Maxbrau is brewed and served in a brewpub in a local hotel in Oberammergau. 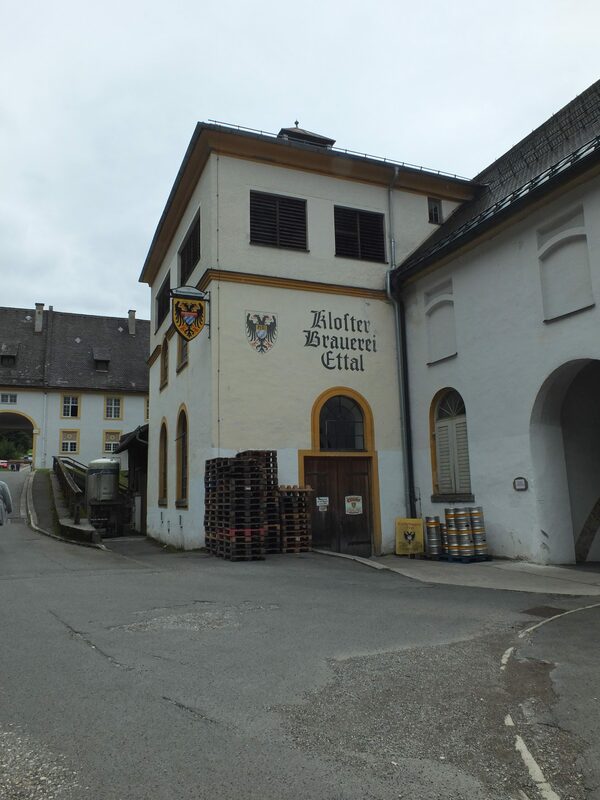 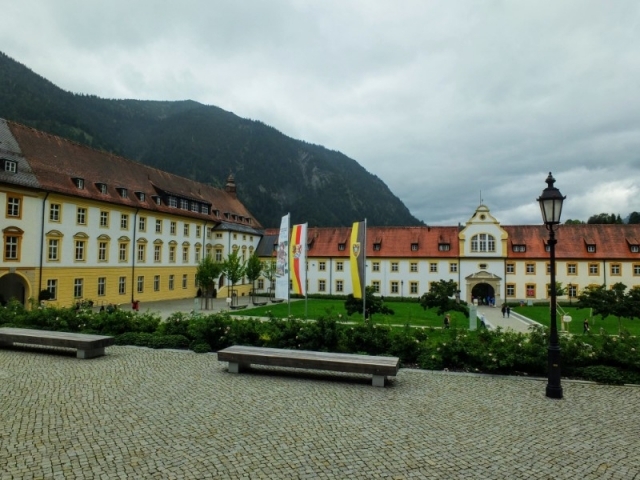 The venerable Benedictine Kloster Ettal is home to the Klosterbrauerei Ettal where there has been a brewery since 1609. 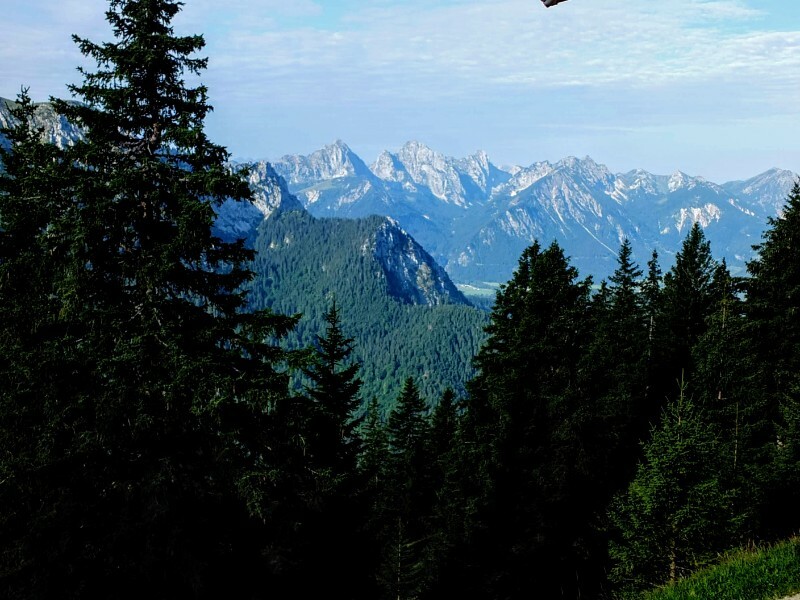 My route crossing the Bavarian Alps was filled with spectacular views and interesting sights, both man made and natural. 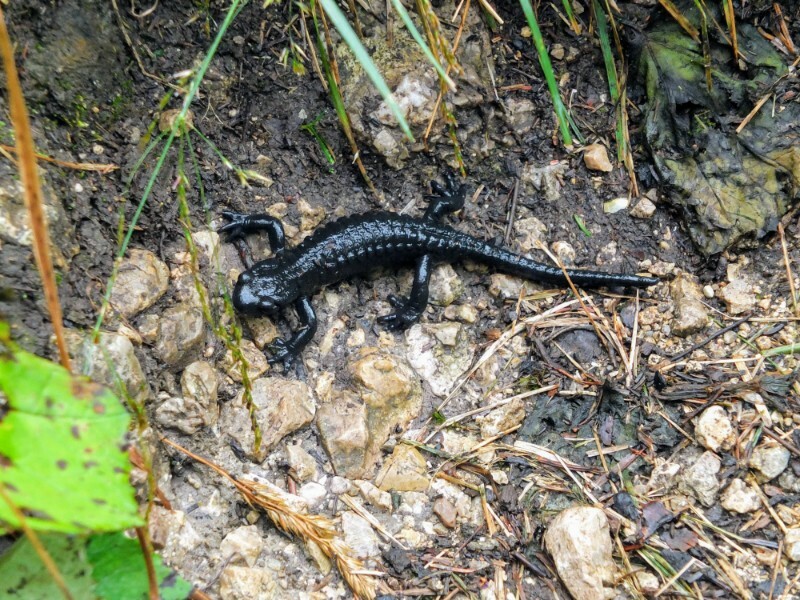 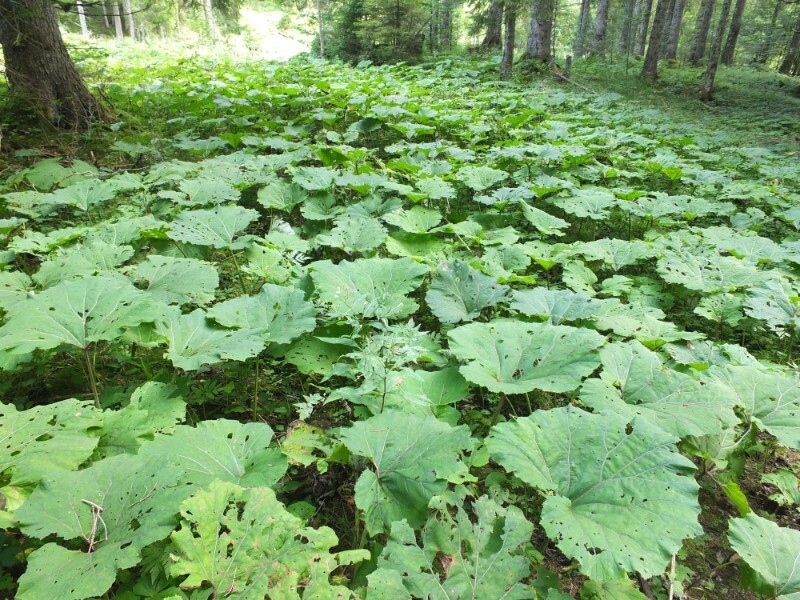 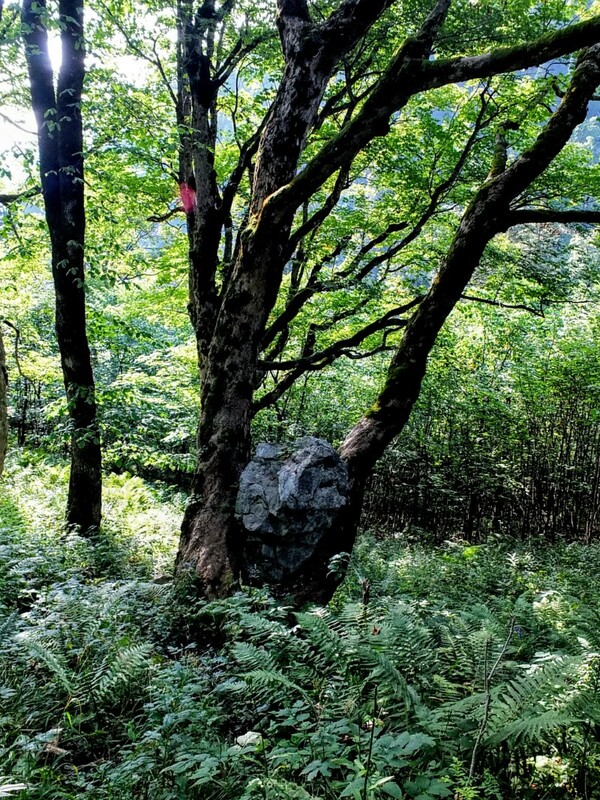 The first day is spent mostly in the forest, often along high ridgelines. 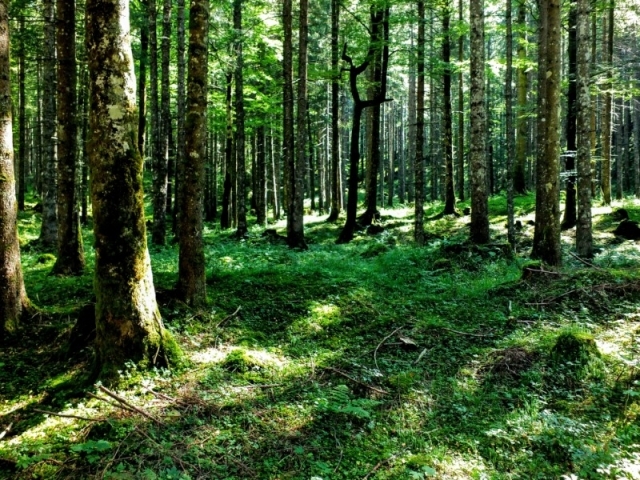 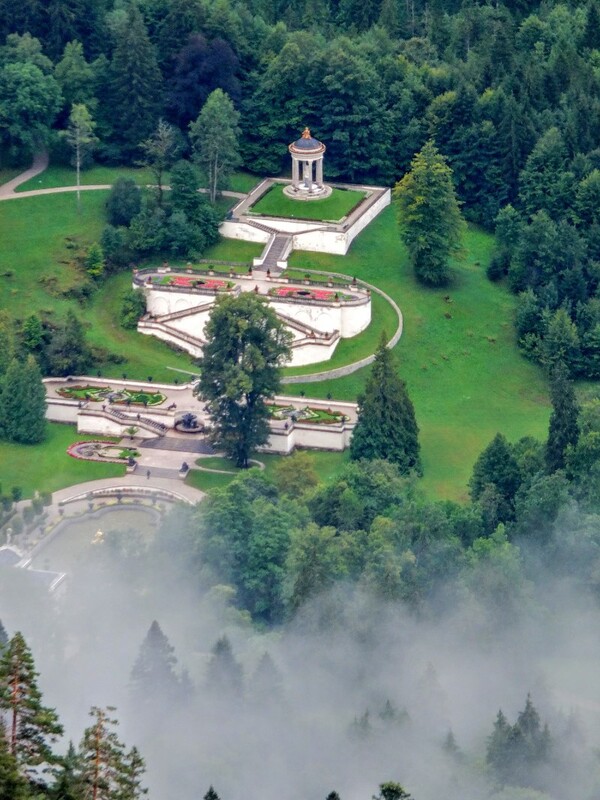 Eventually the forest opens to a descent to the 19th-century Schloss Hohenschwangau, the palace of King Maximilian II of Bavaria. 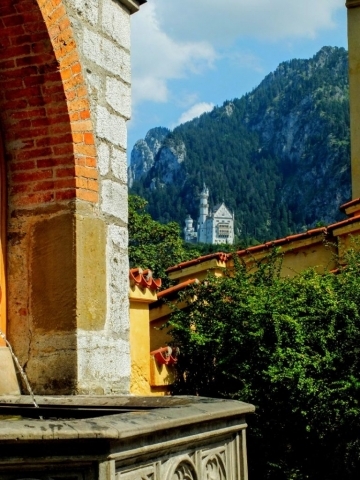 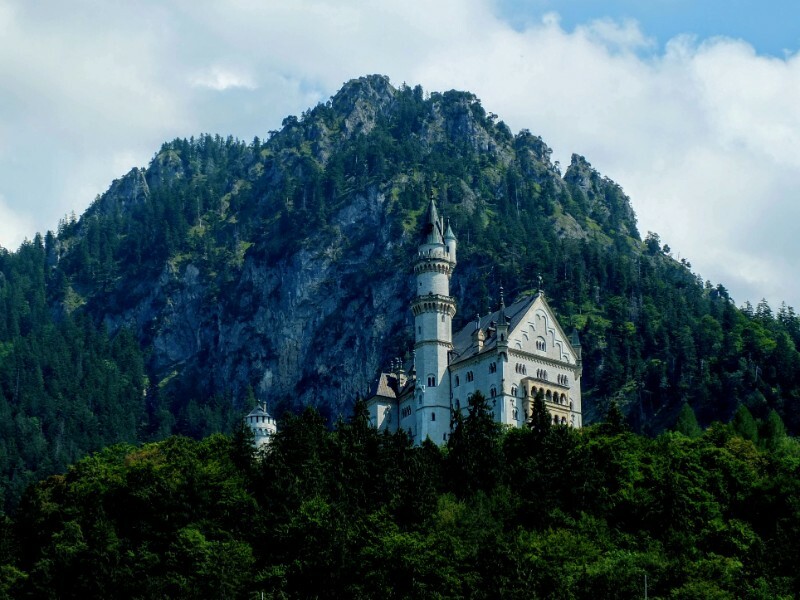 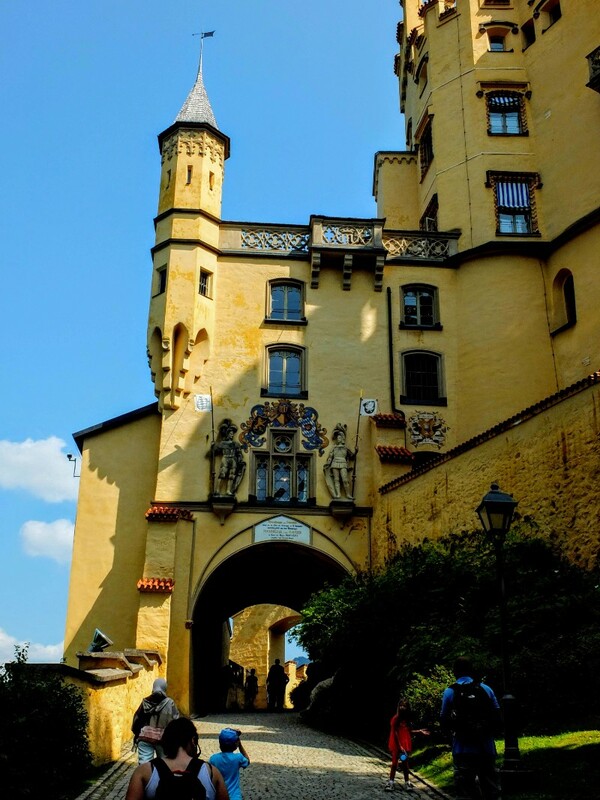 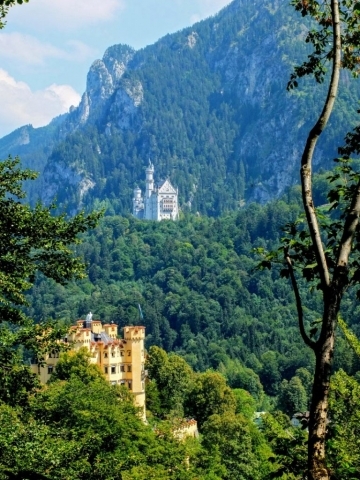 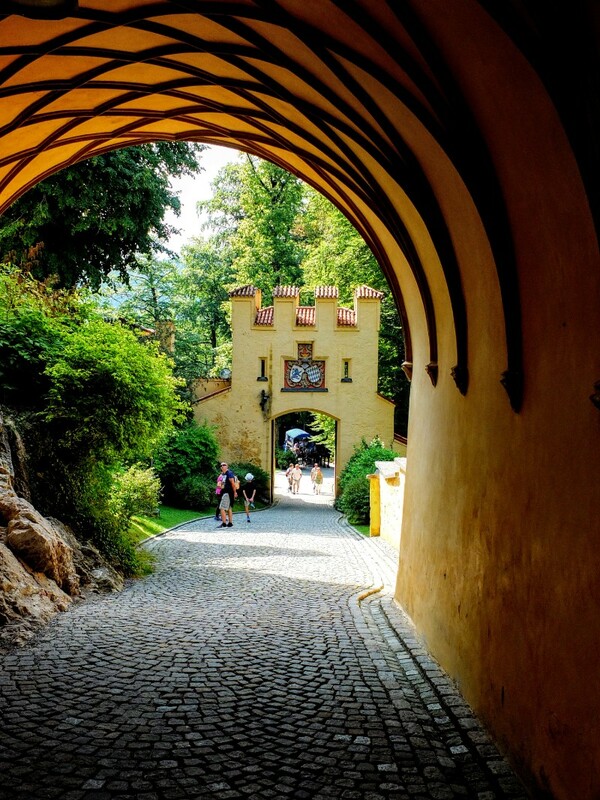 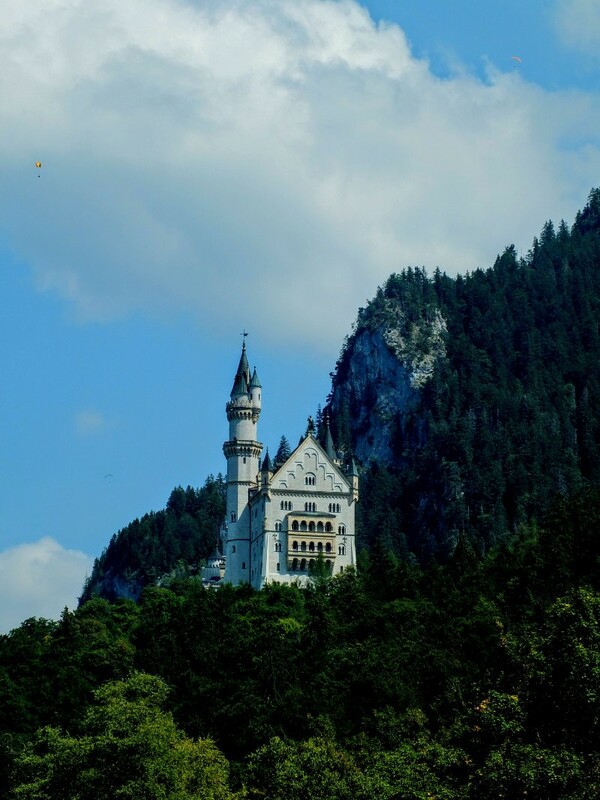 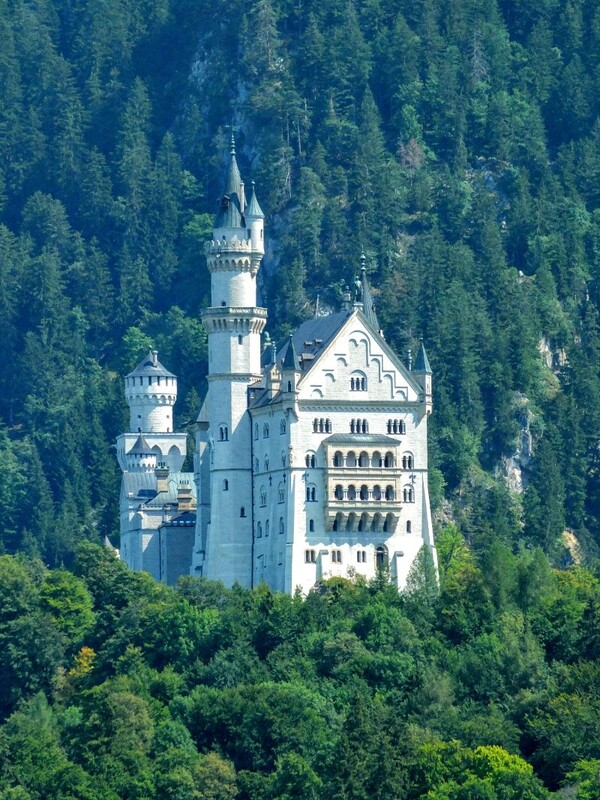 This was the childhood home of King Ludwig II who built the iconic Neuschwanstein castle in view across a steep valley. 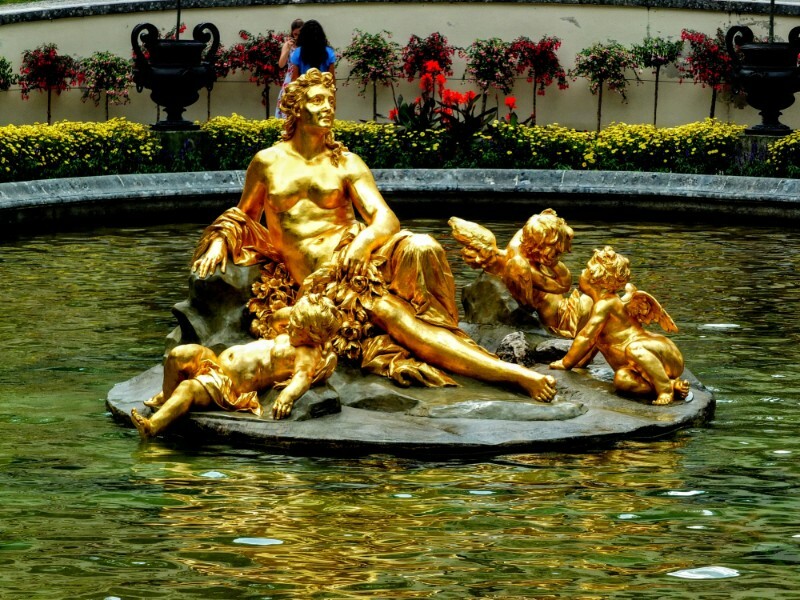 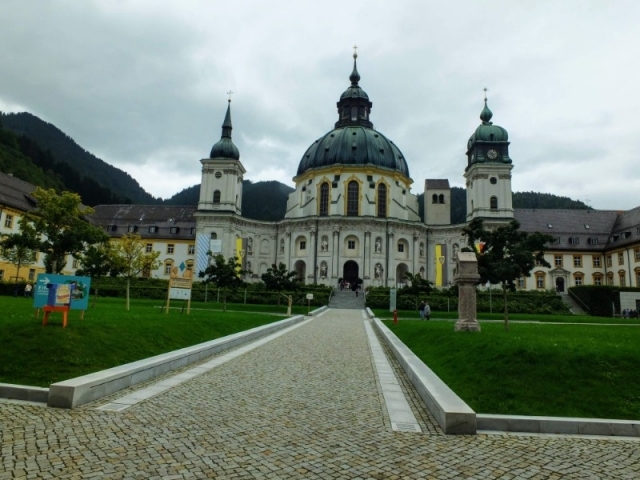 Several days later I passed Linderhof , another of Ludwig’s palaces that is situated in a remote mountain valley. 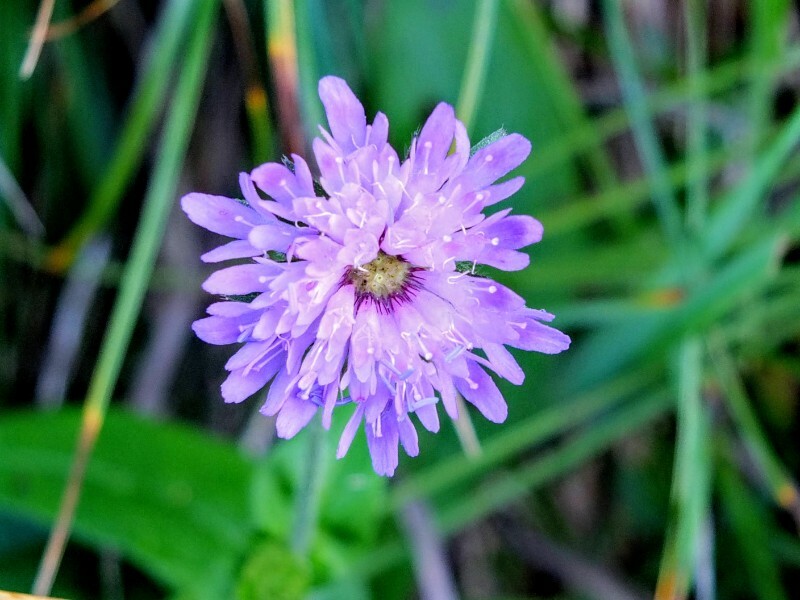 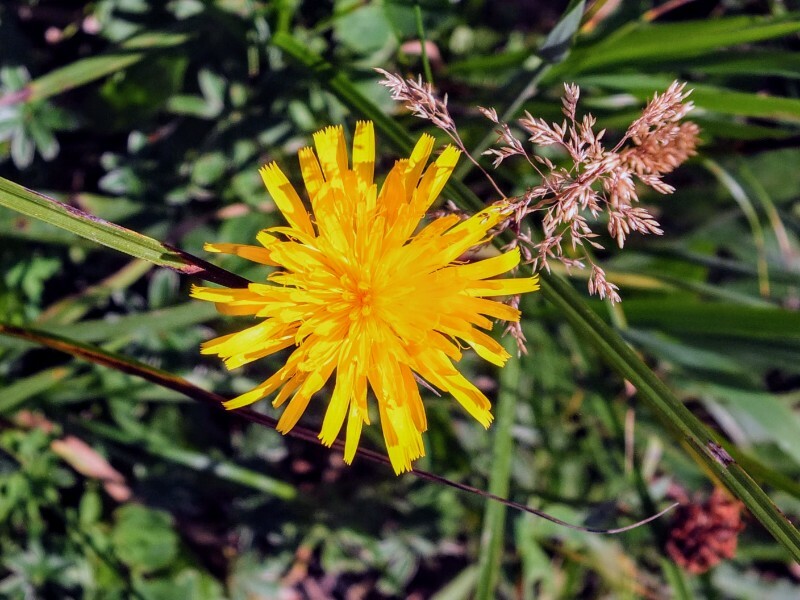 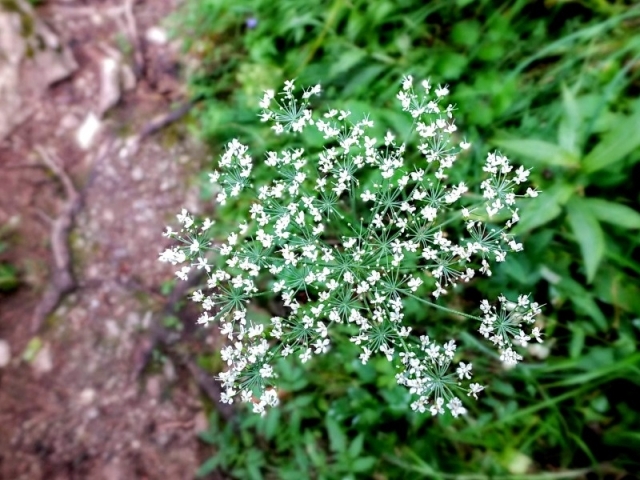 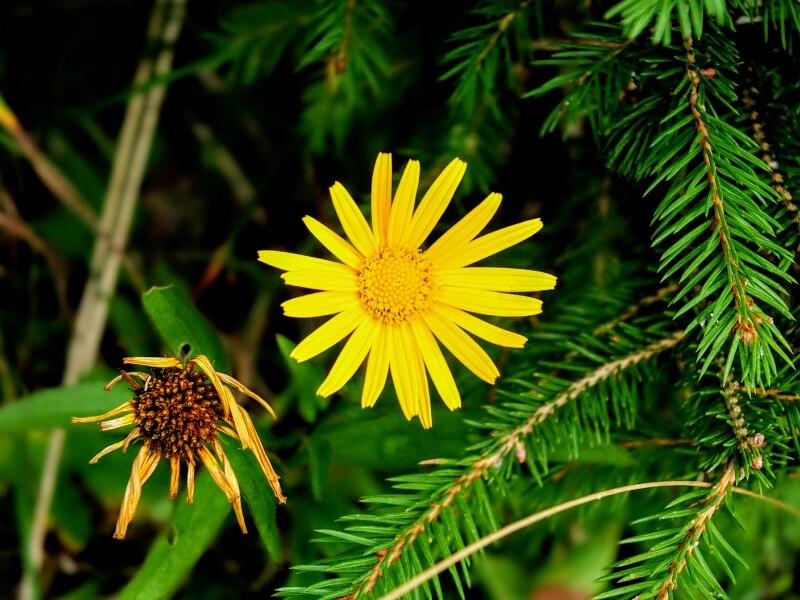 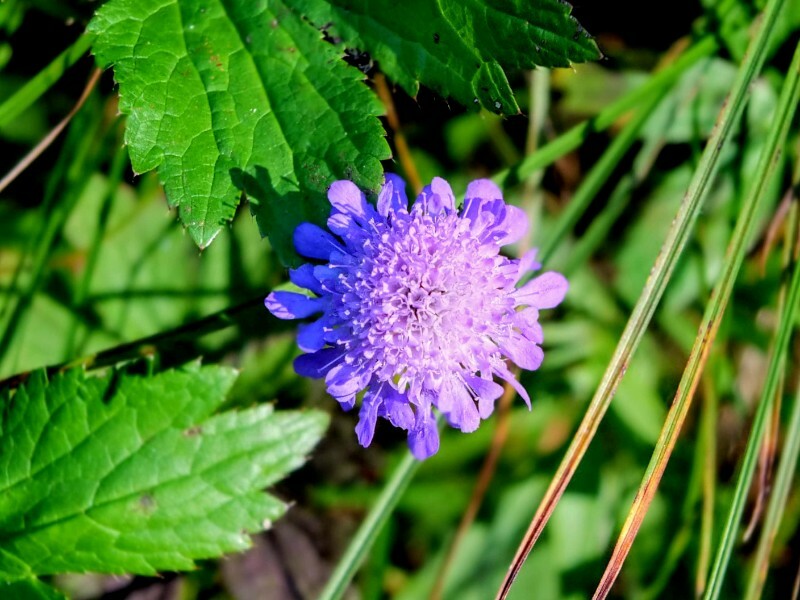 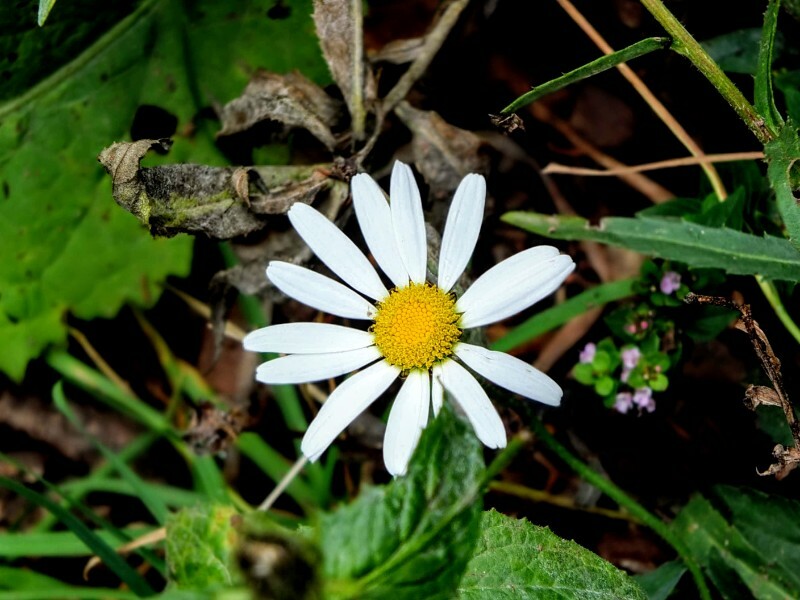 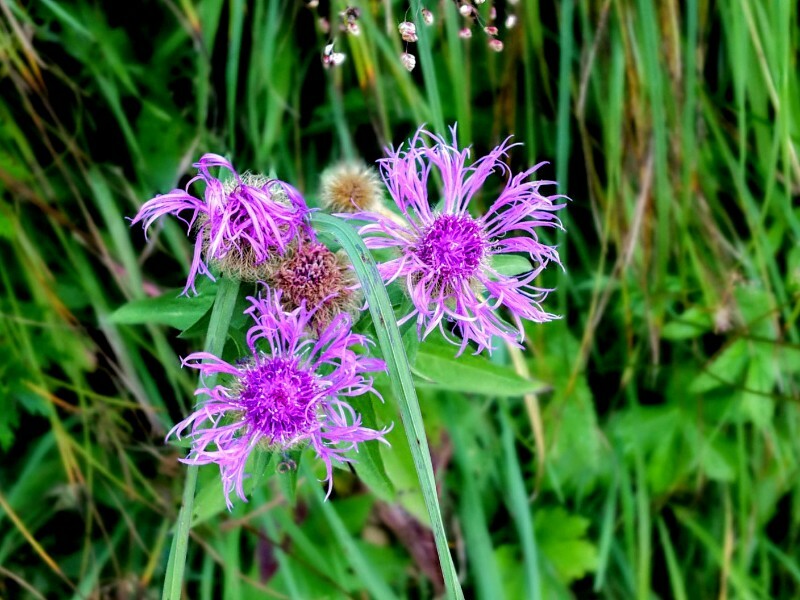 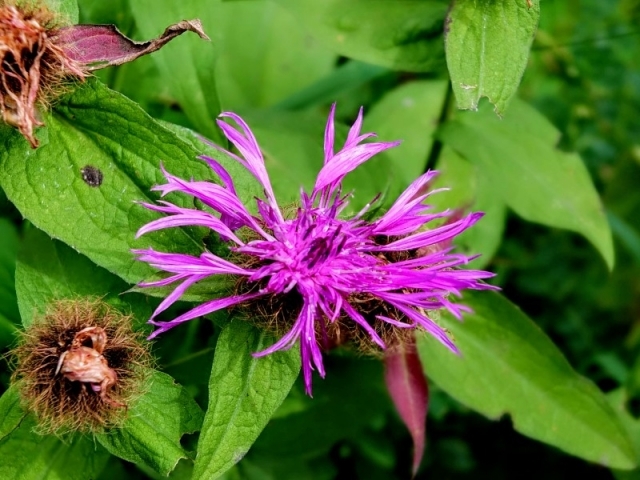 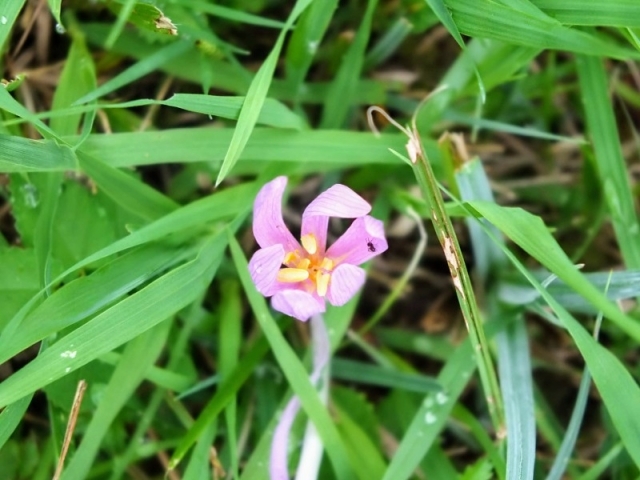 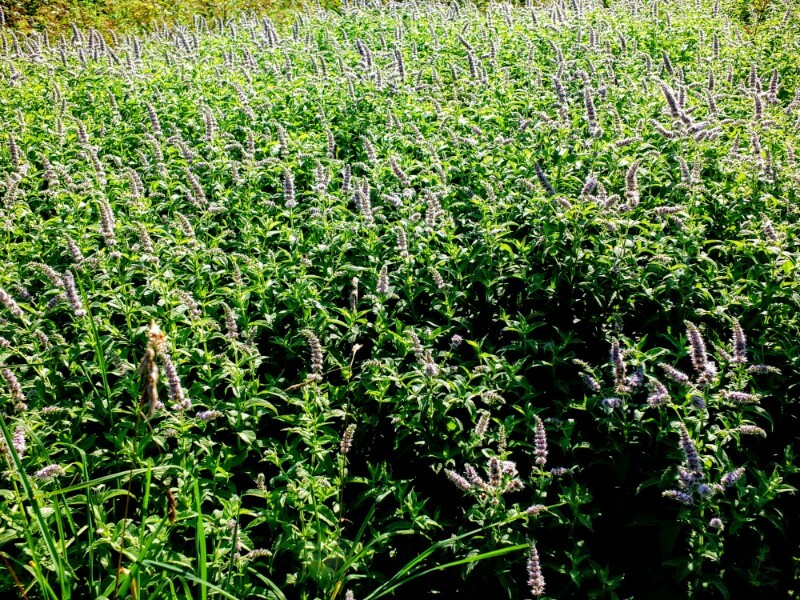 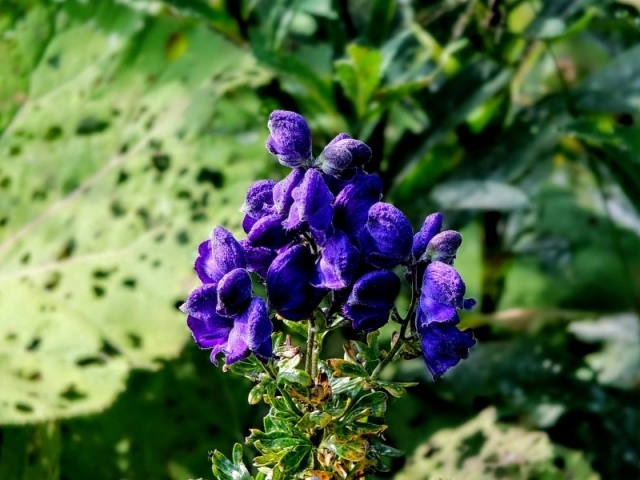 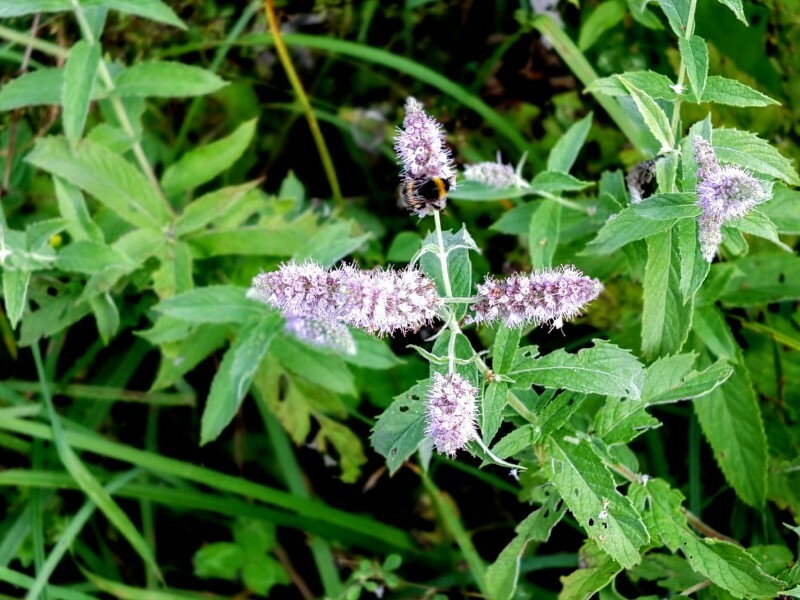 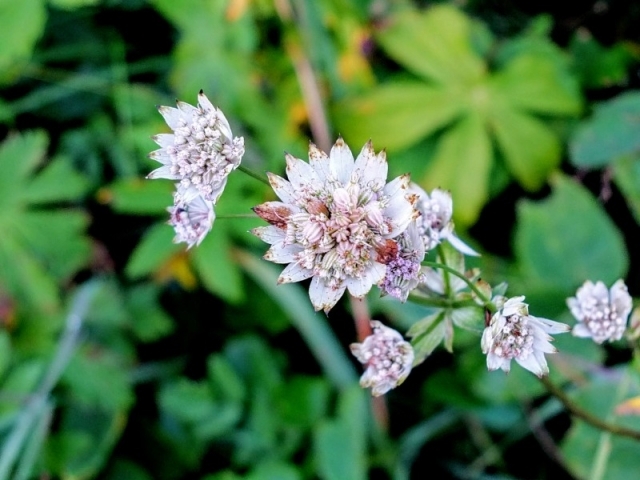 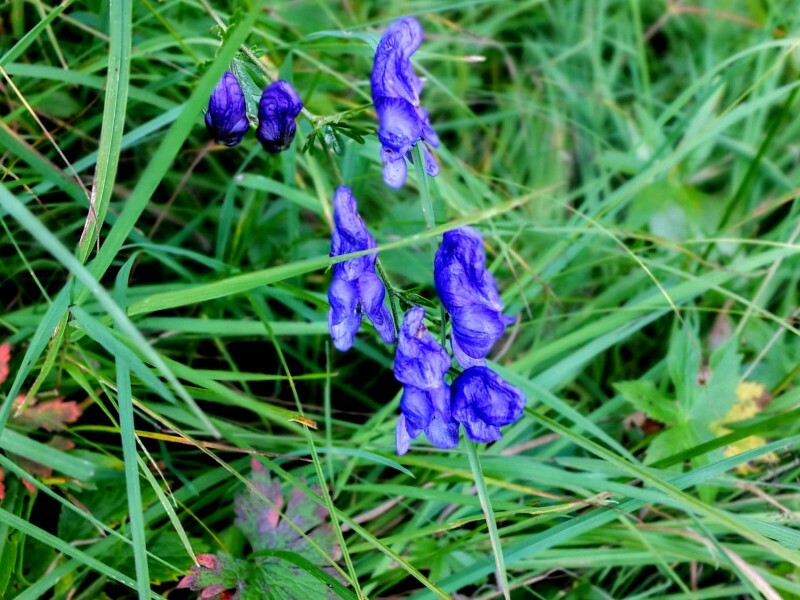 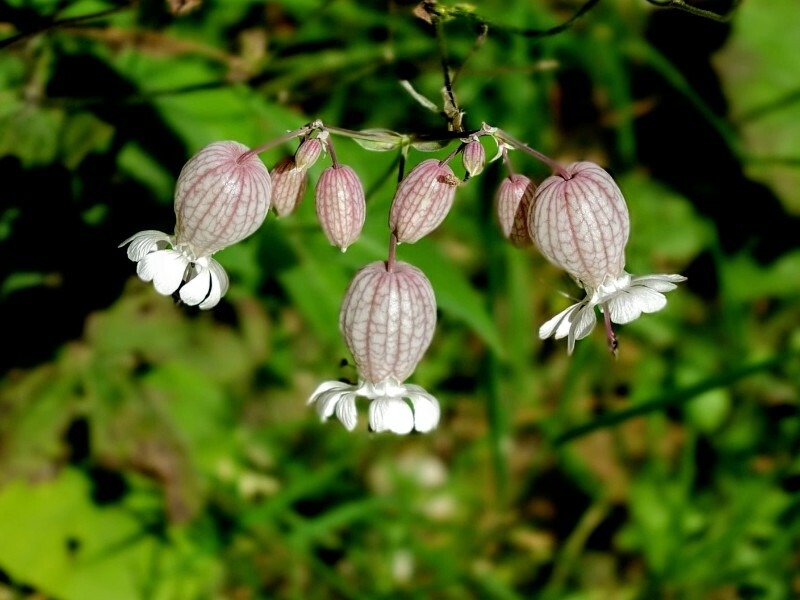 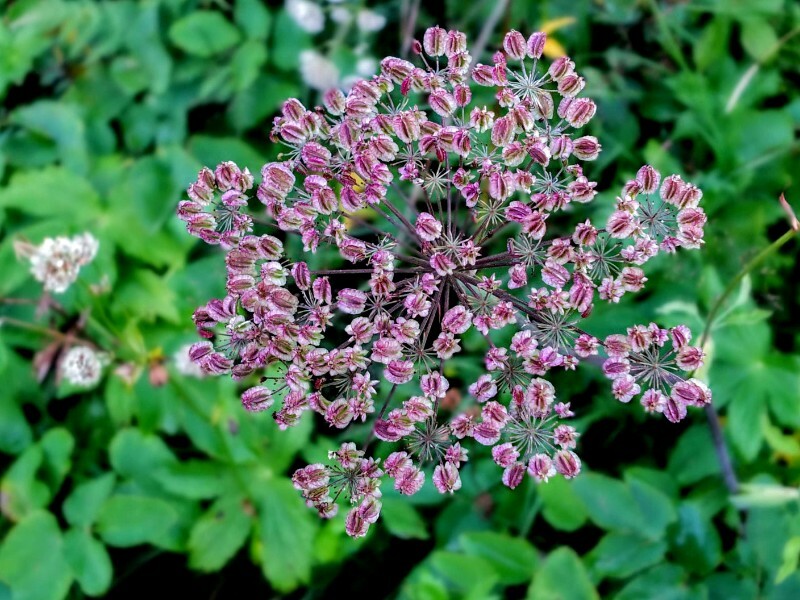 There were an abundant variety of wildflowers along the way. 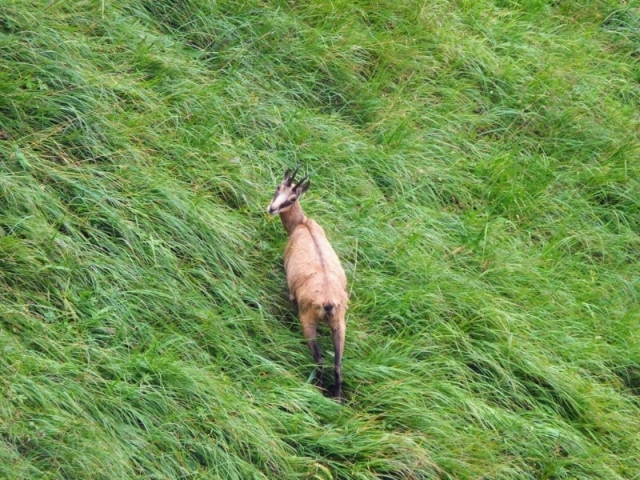 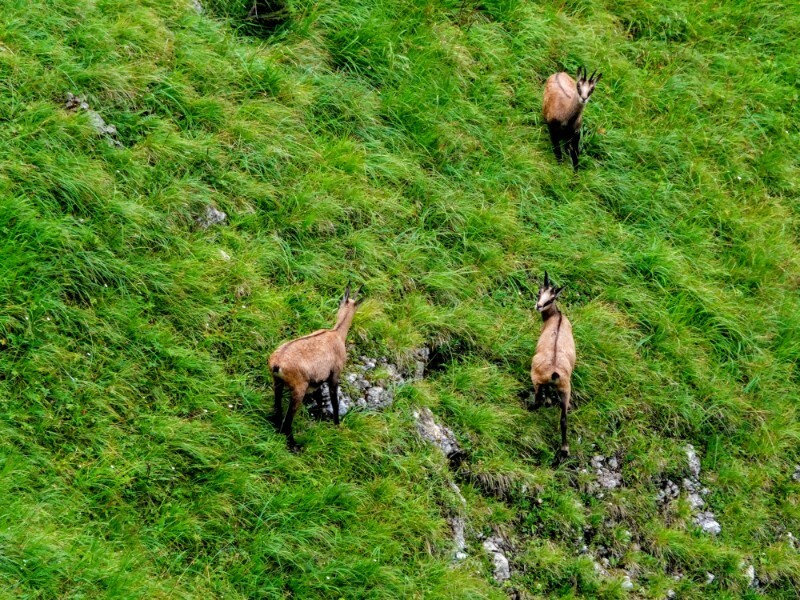 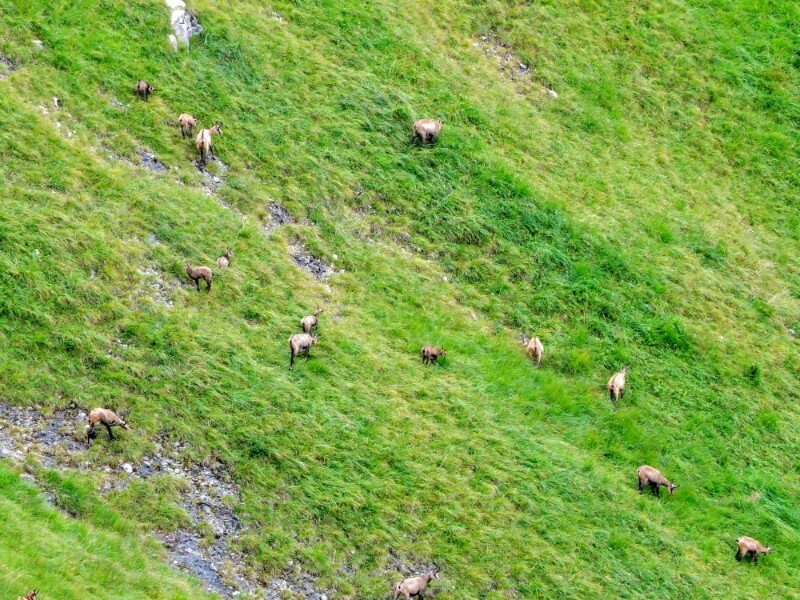 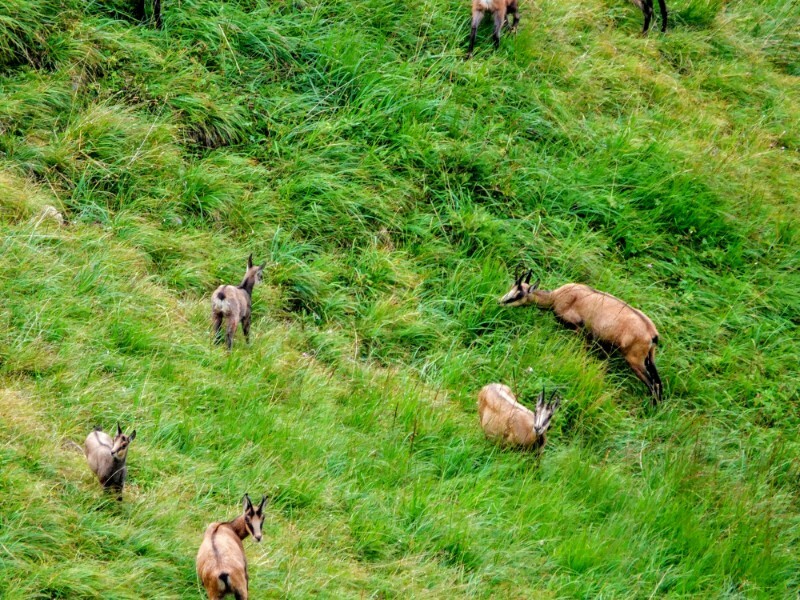 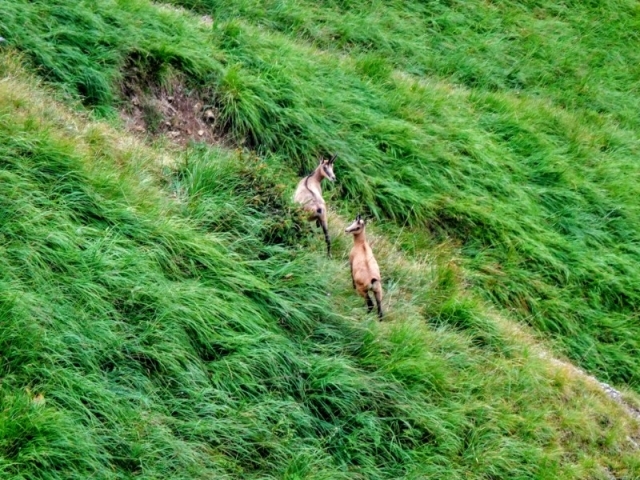 The biggest wildlife I encountered was a group of alpine chamois (kind of a goat-antelope) that were grazing a very steep, grassy slope below the trail one day. 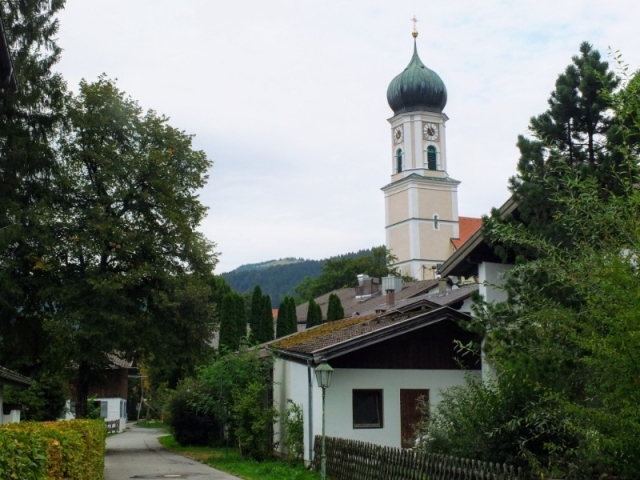 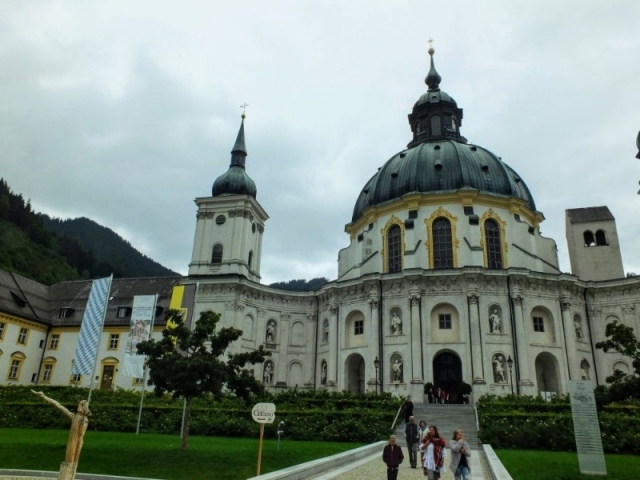 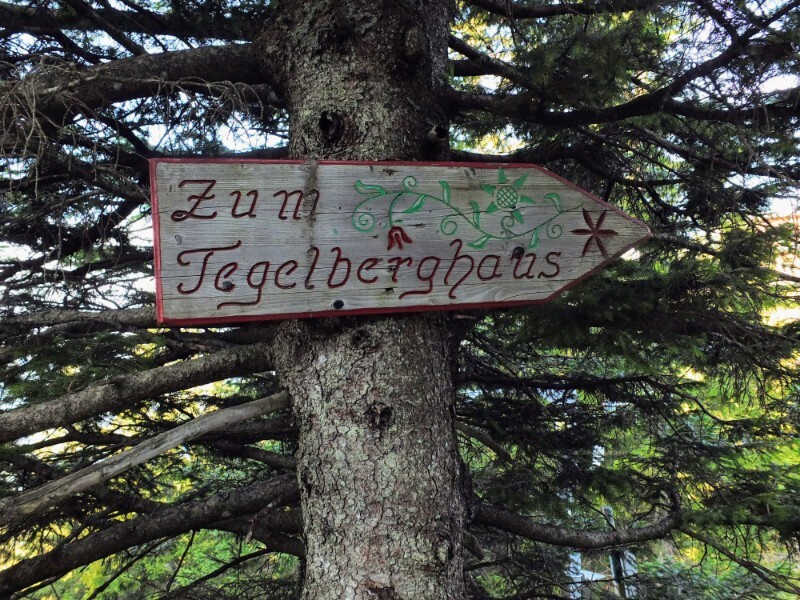 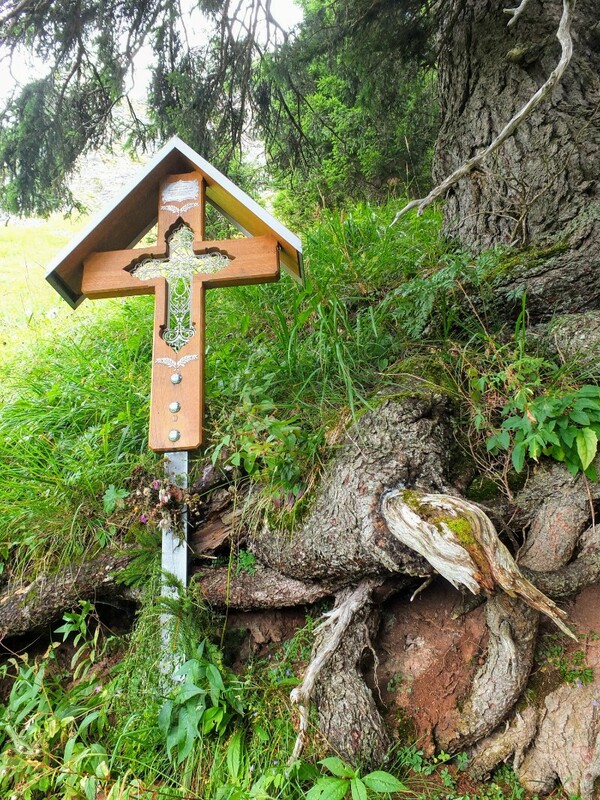 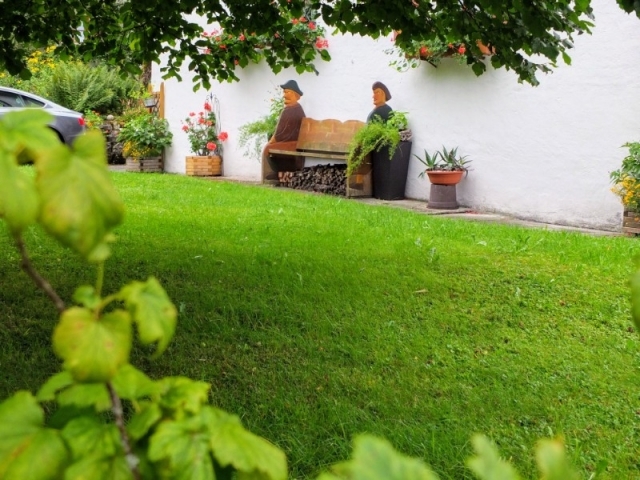 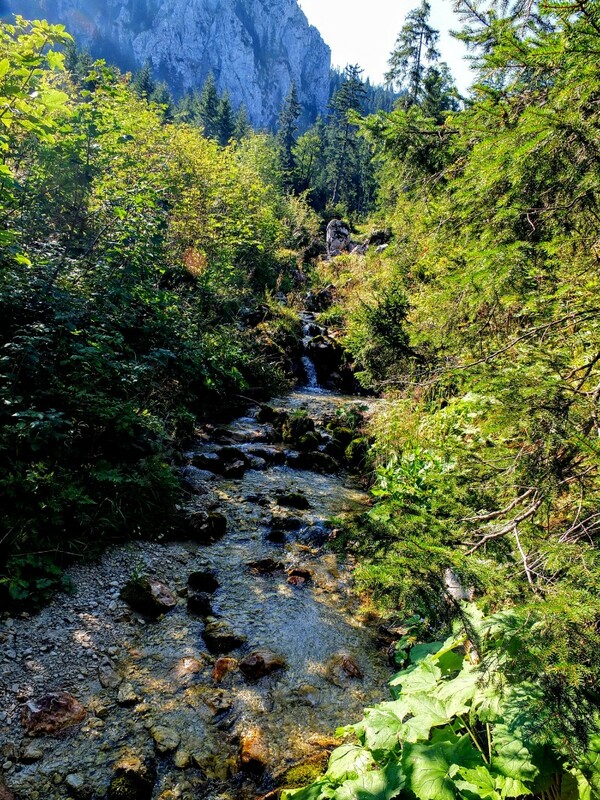 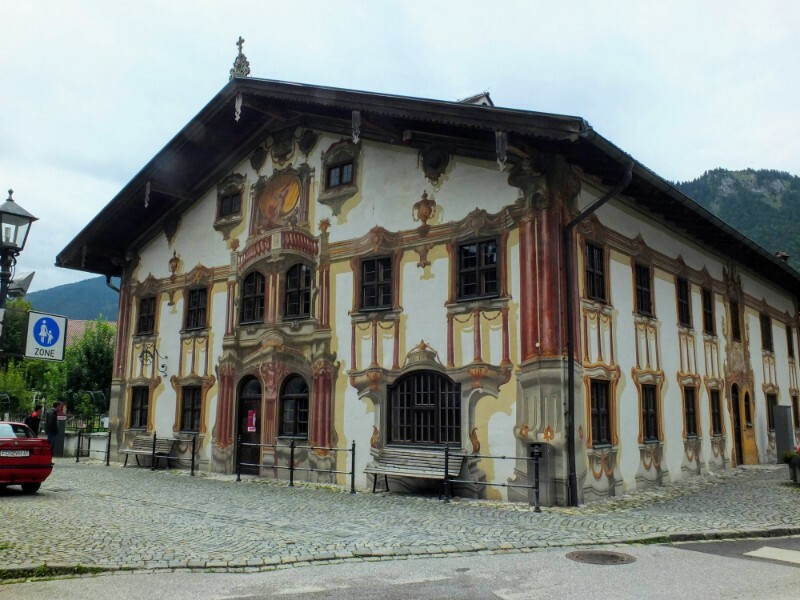 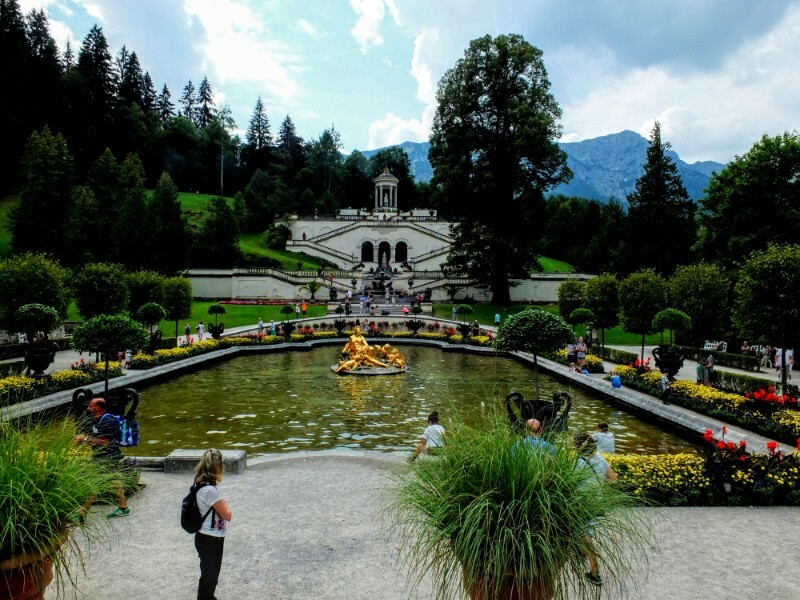 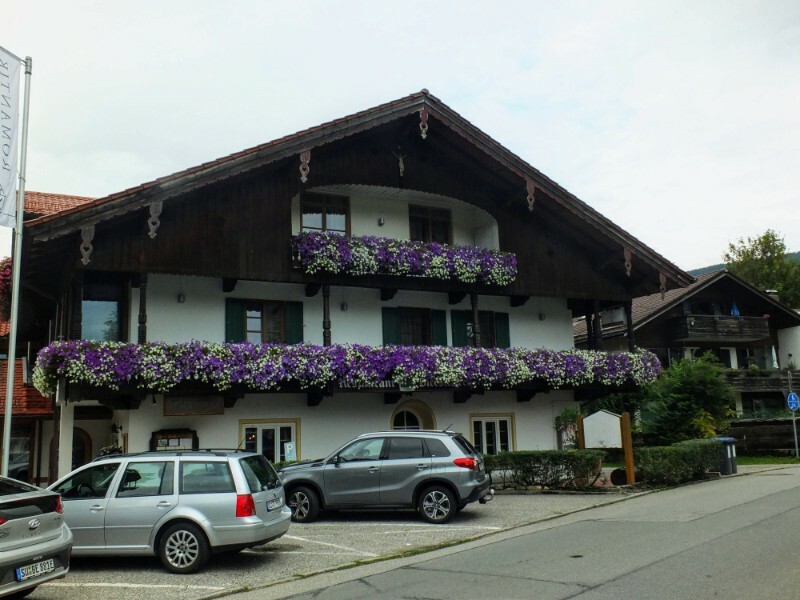 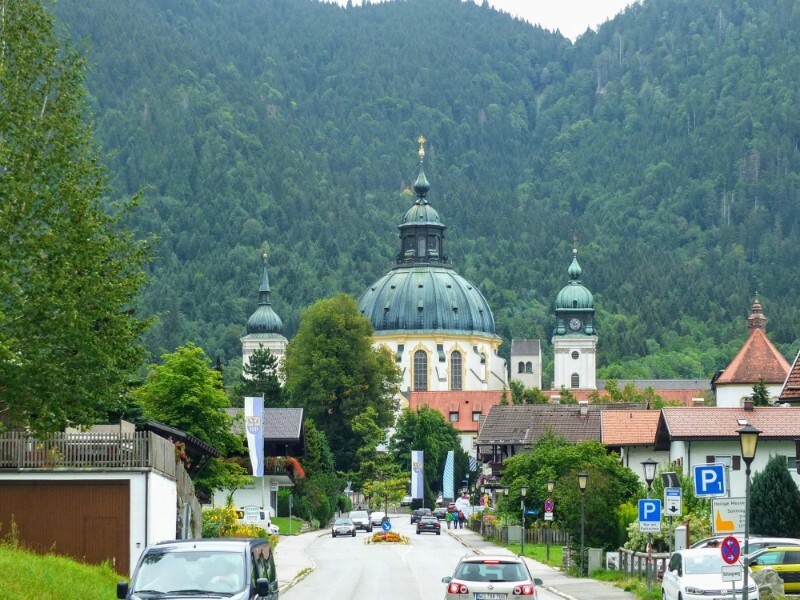 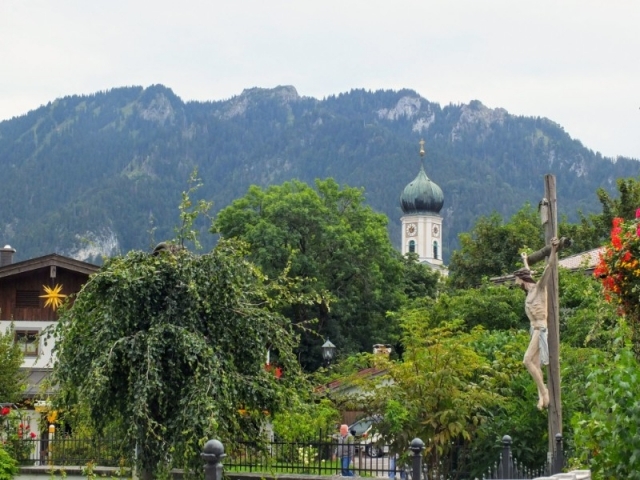 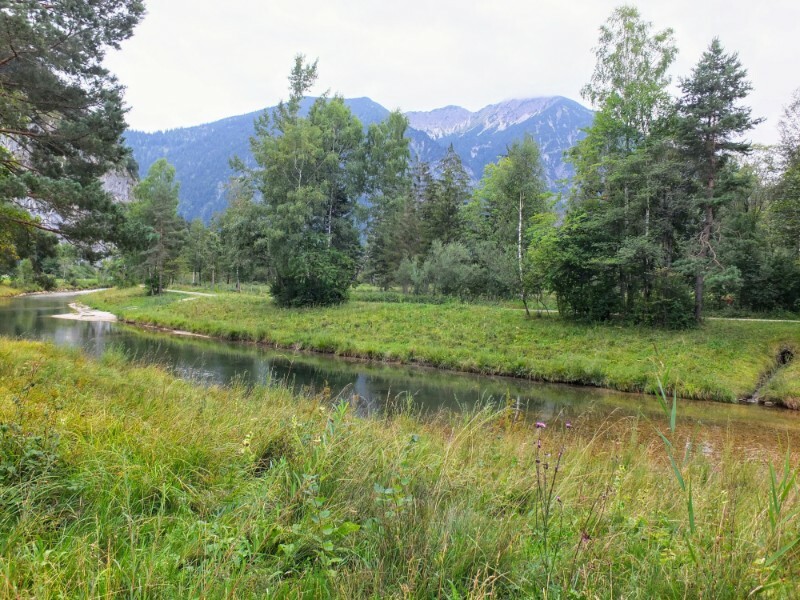 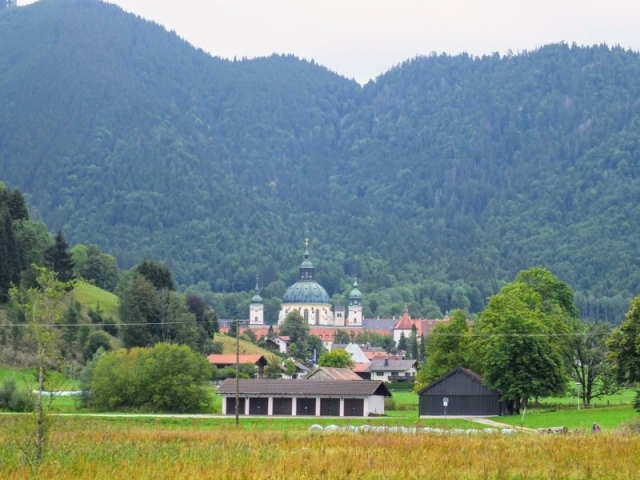 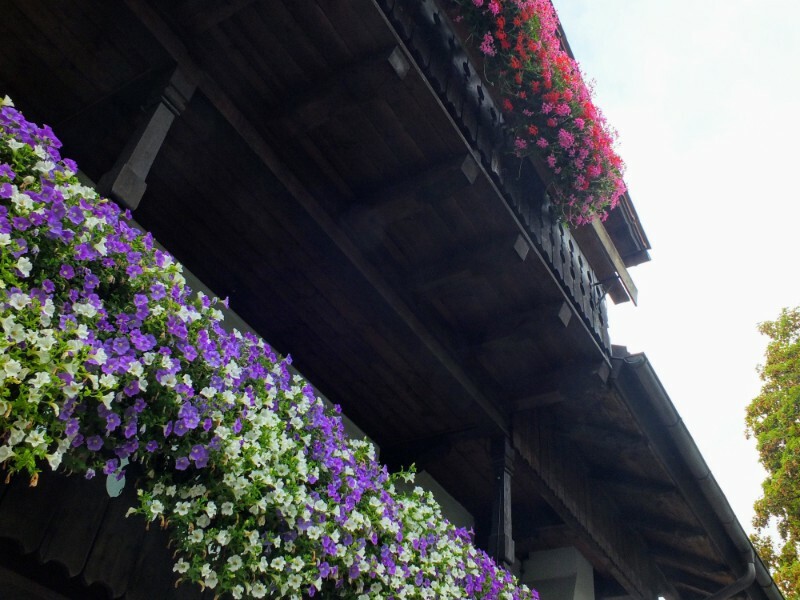 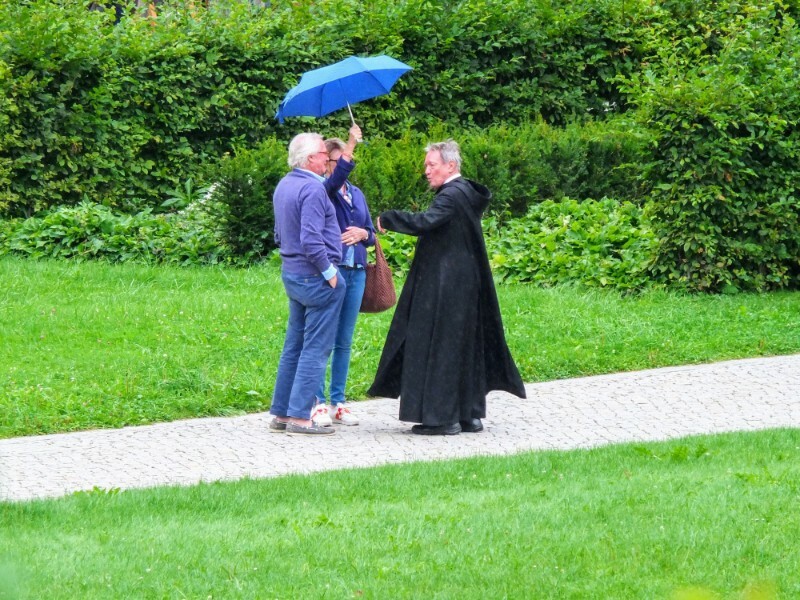 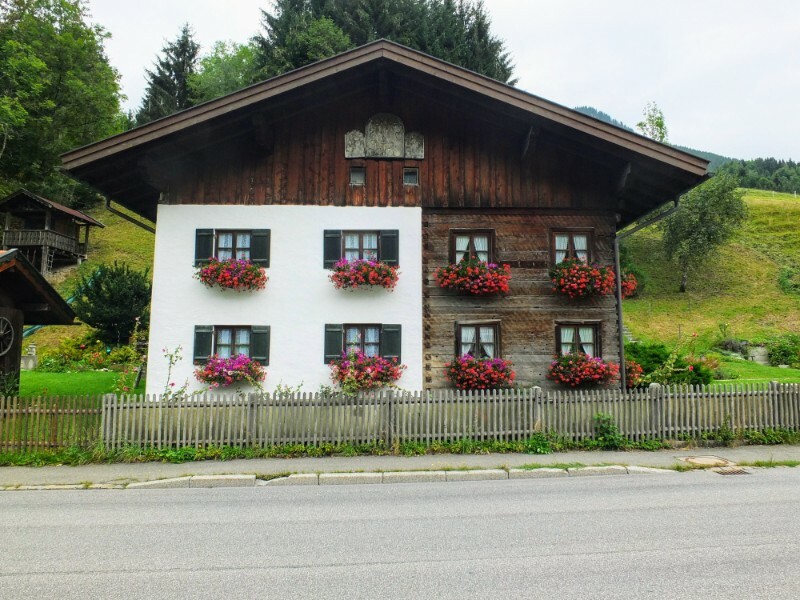 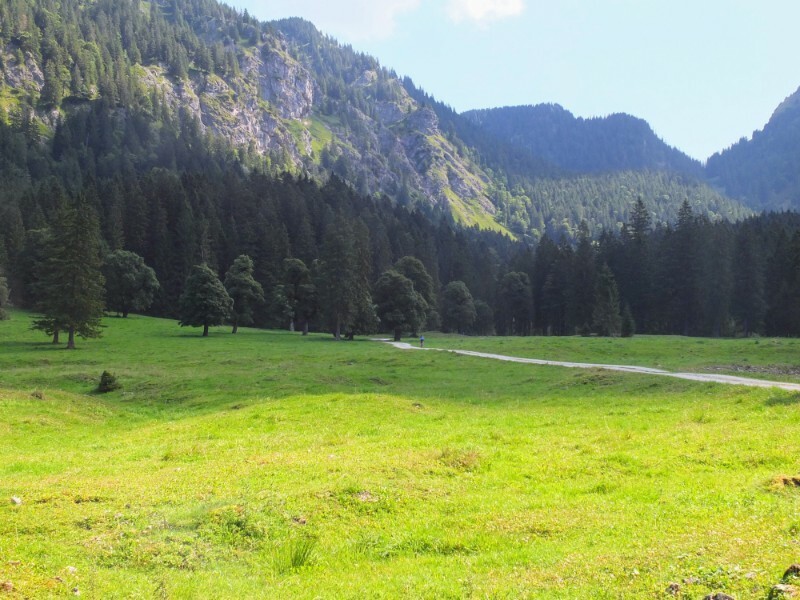 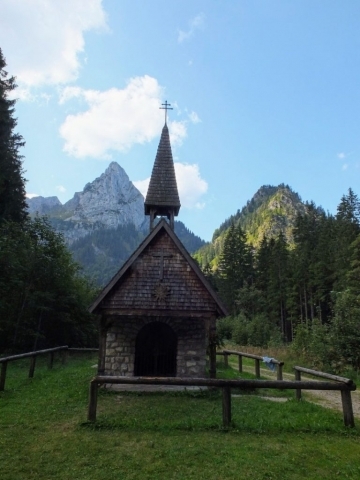 The villages of Oberammergau and Ettal added considerable charm to the last day of the hike with picturesque houses and the impressive domed monasterey.